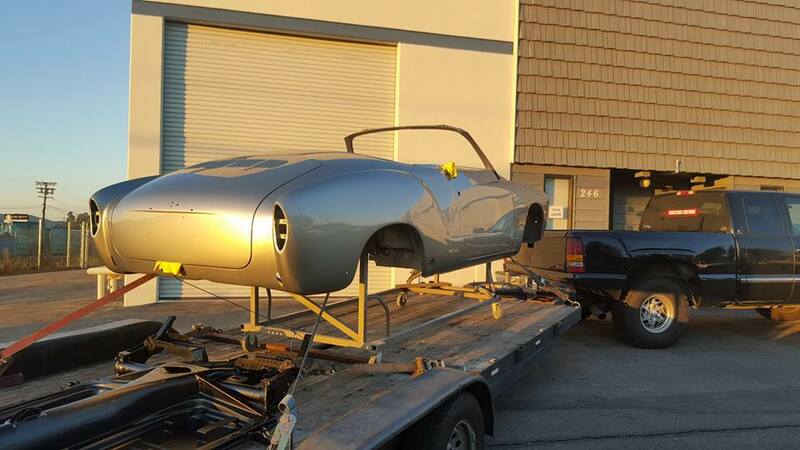 "RARE THING" TO HAPPEN AT THE HOME OF STYLE AND PERFORMANCE. 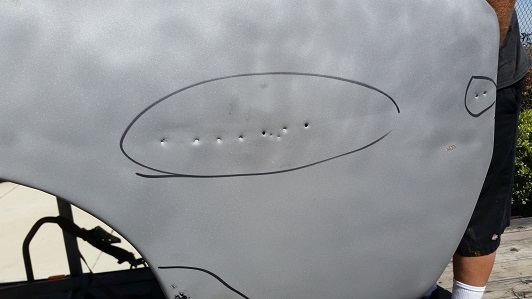 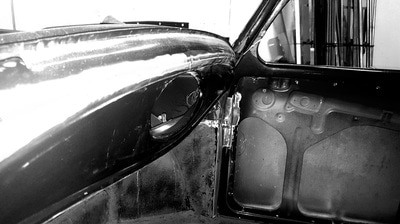 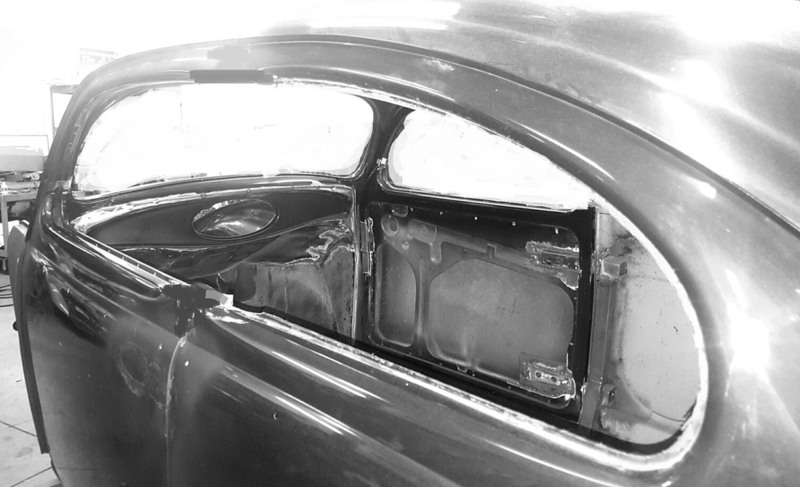 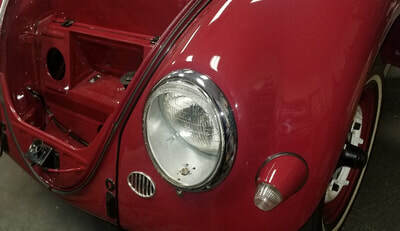 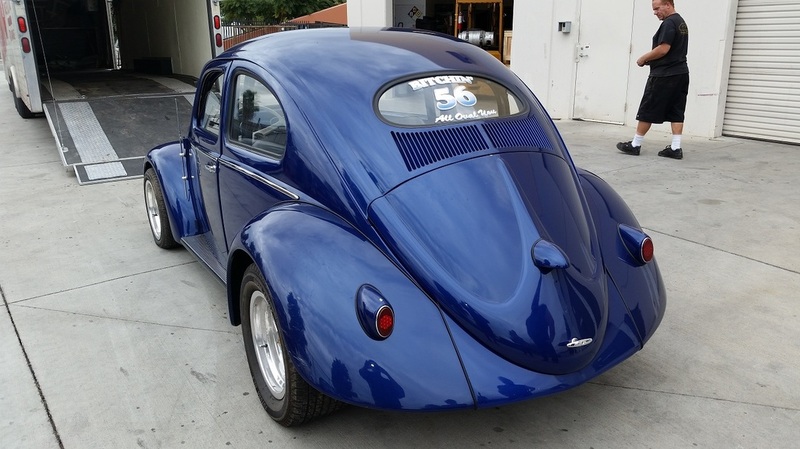 JUST ANOTHER "Cal-Look" OVAL WINDOW ? 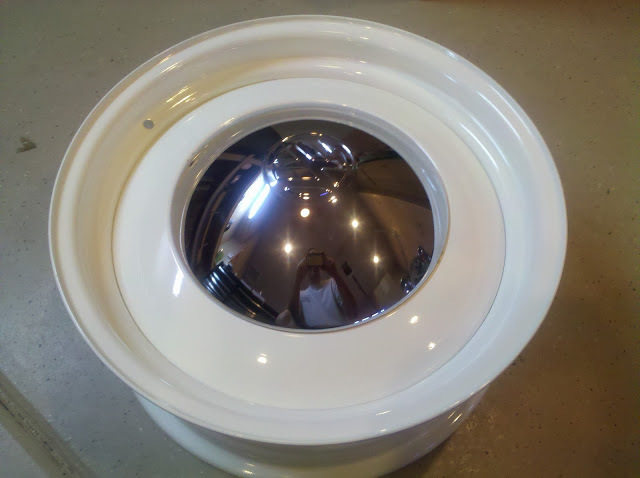 WELL THAT IS WHAT THE PREVIOUS OWNER HAD IN MIND WHEN THEY BUILT THIS "BITCHEN 56' OVAL. 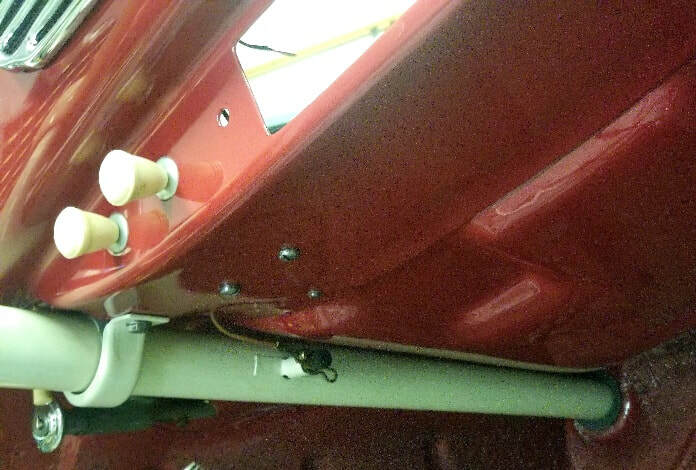 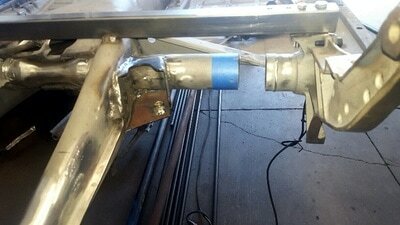 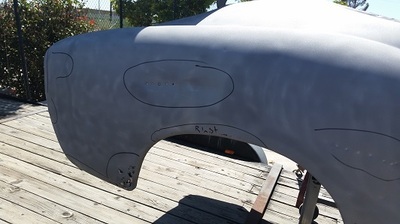 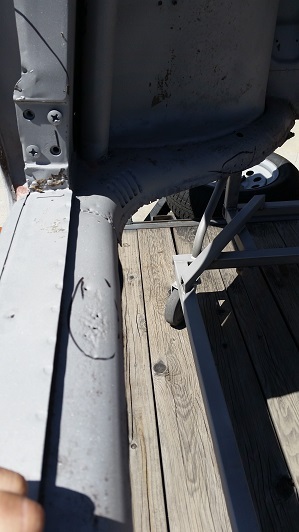 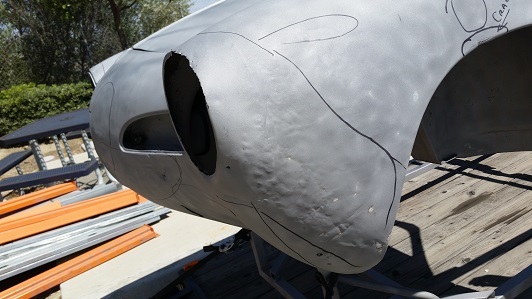 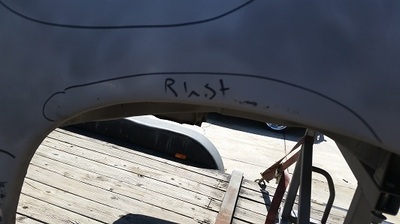 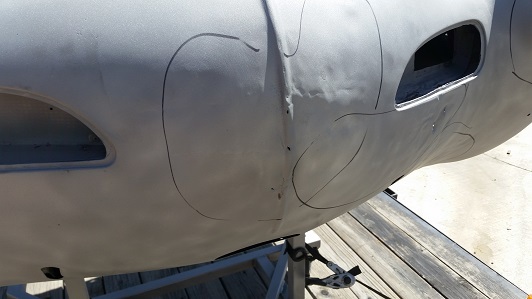 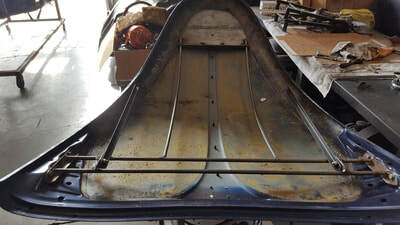 NOW WE ARE GOING TO MAKE THIS 56' WAY MORE BITCHEN AND BEING ABLE TO BACK UP THE CLAIM OF "BITCHEN" BY PUTTING THE COOLRYDES TOUCHES ON HER. 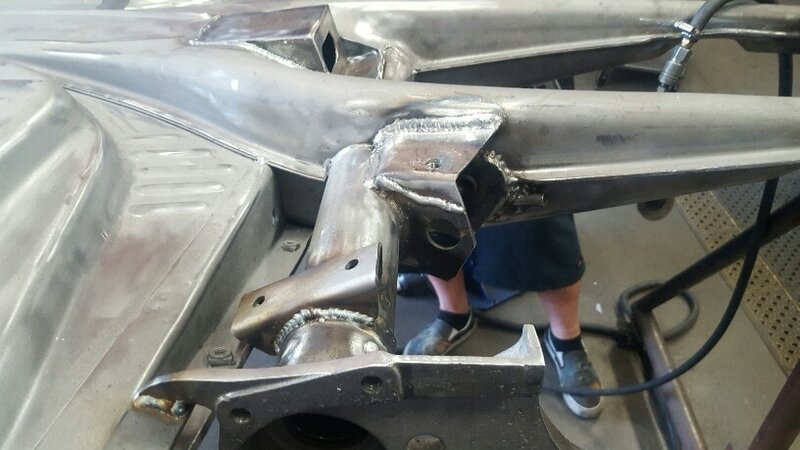 FORM FIRST, FUNCTION LATER. 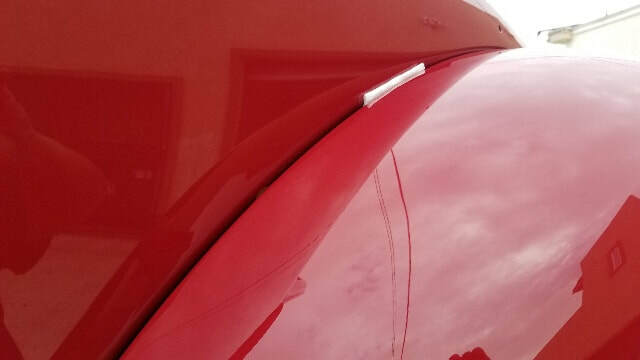 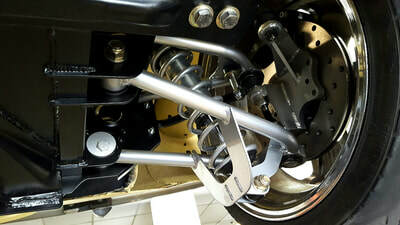 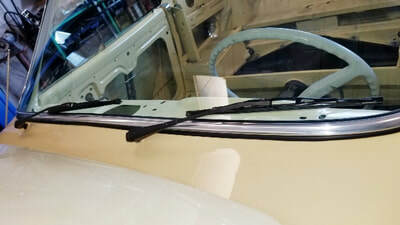 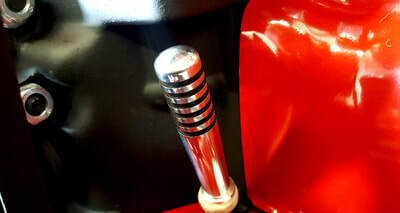 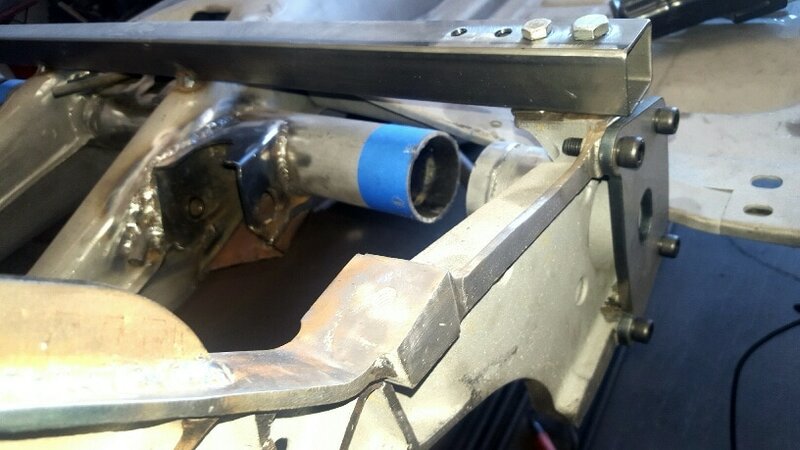 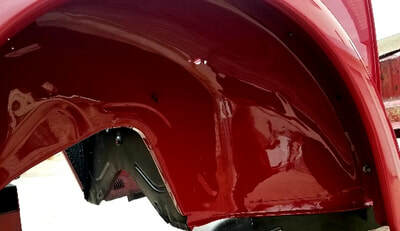 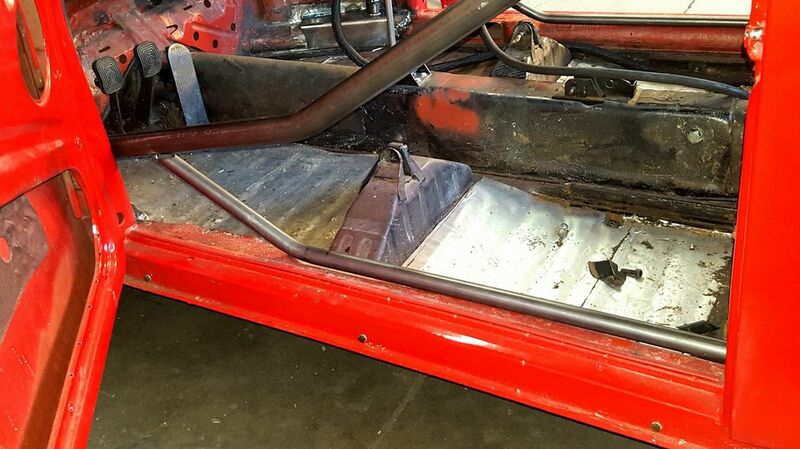 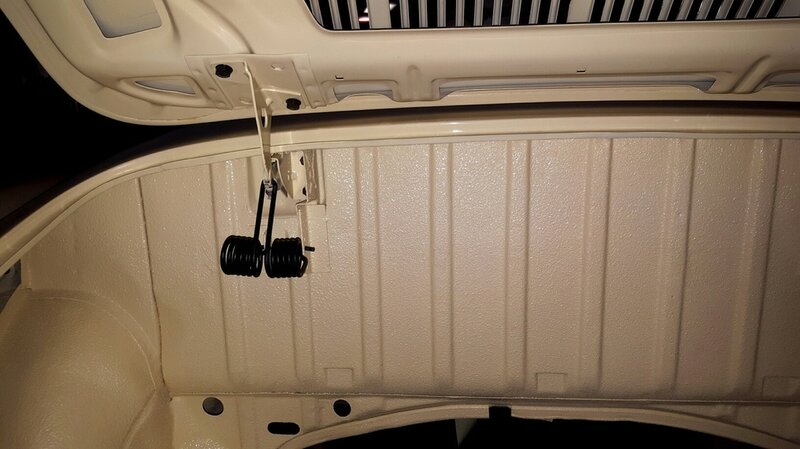 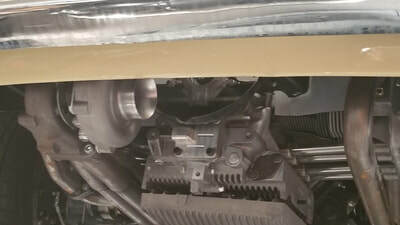 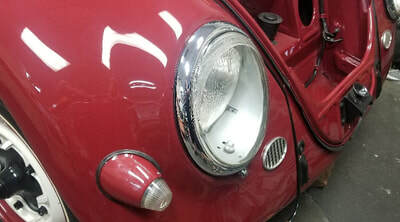 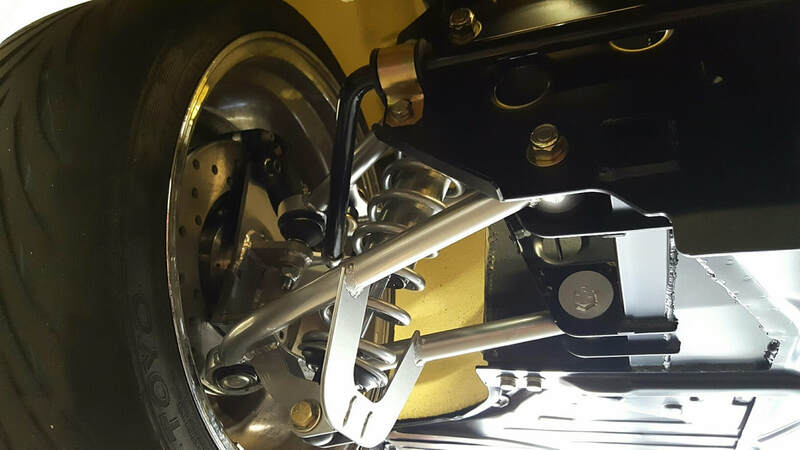 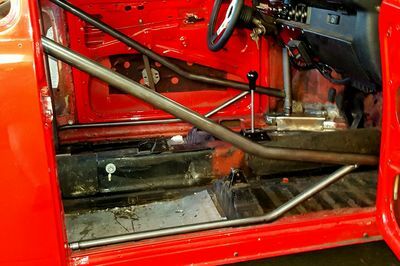 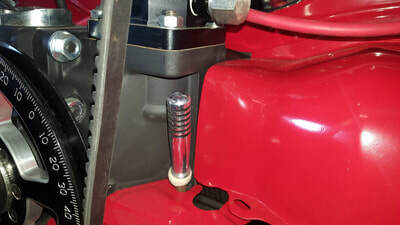 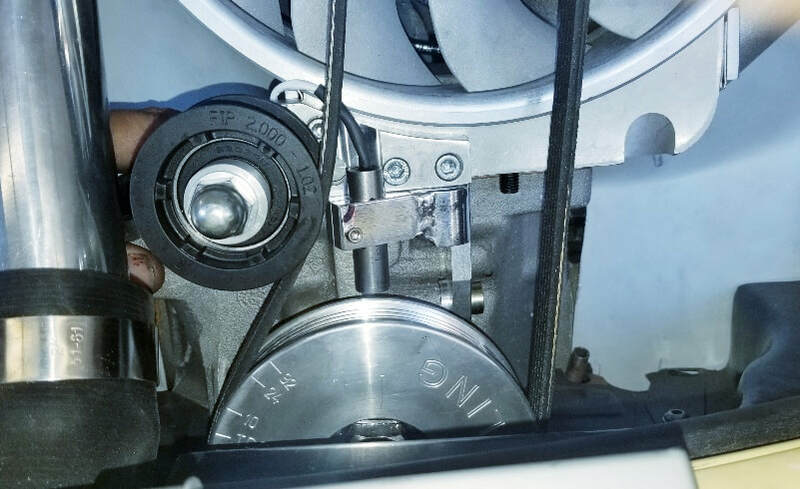 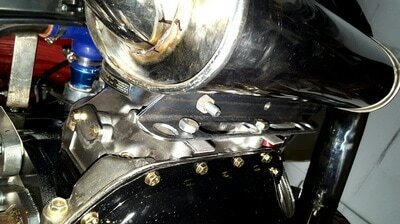 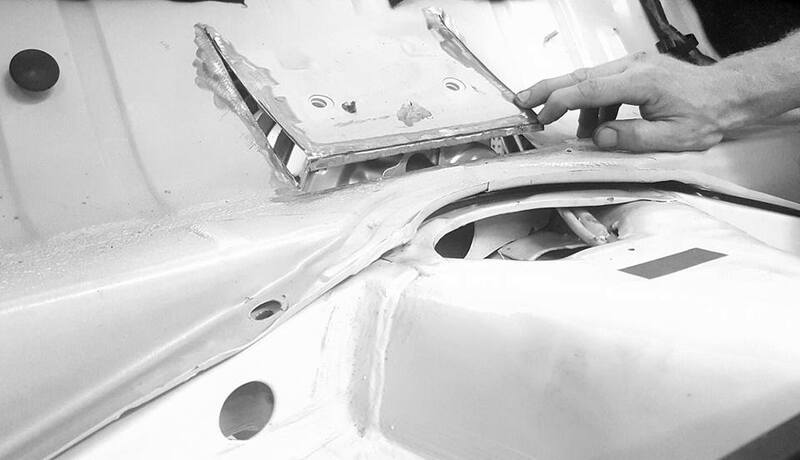 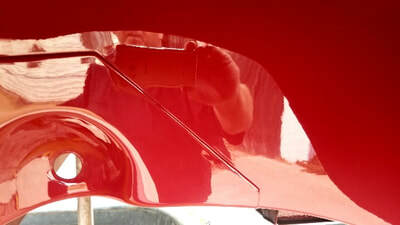 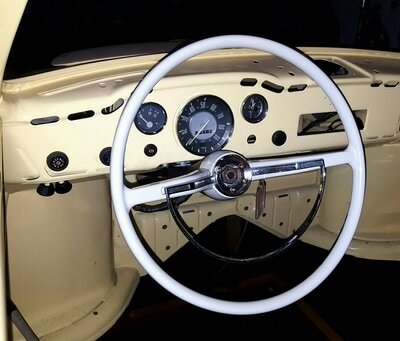 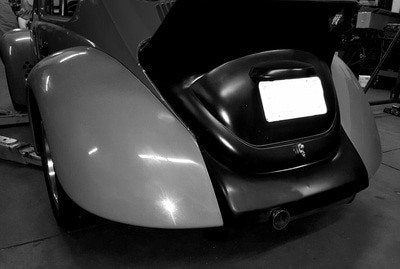 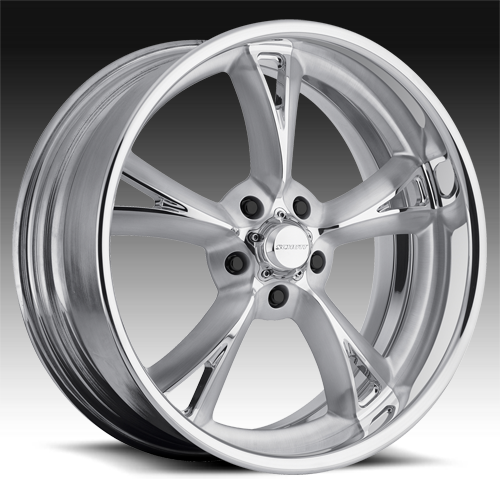 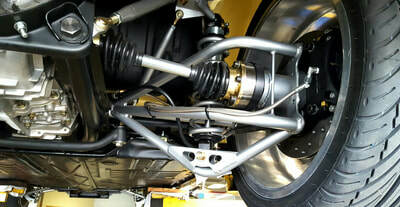 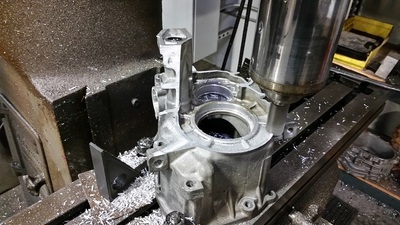 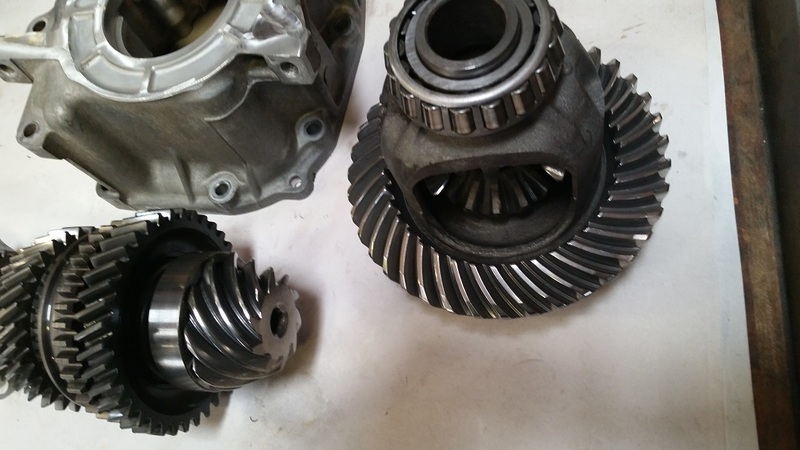 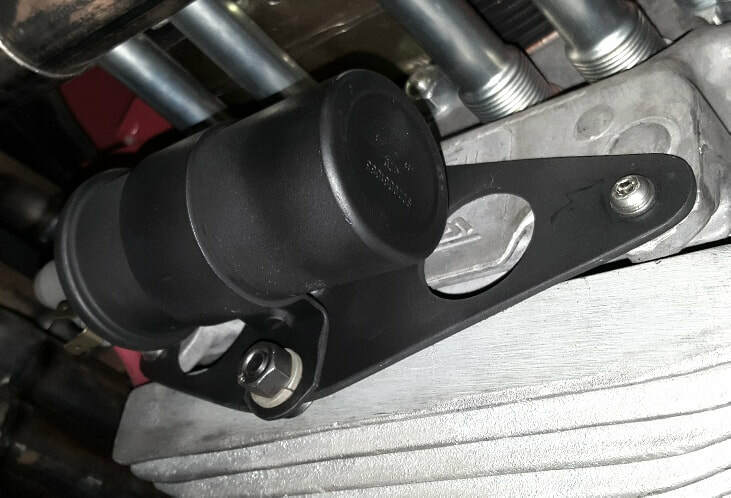 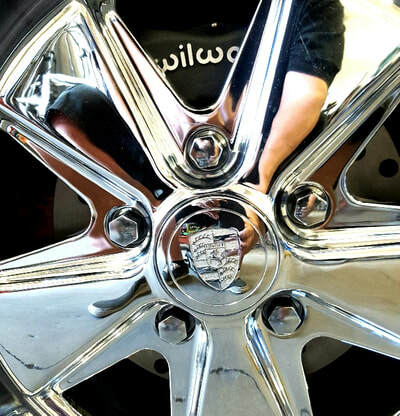 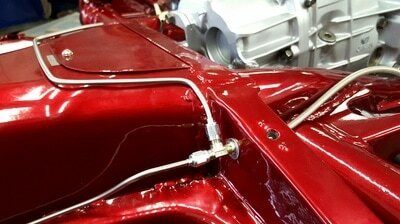 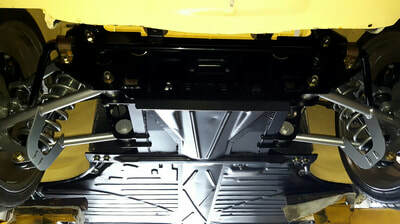 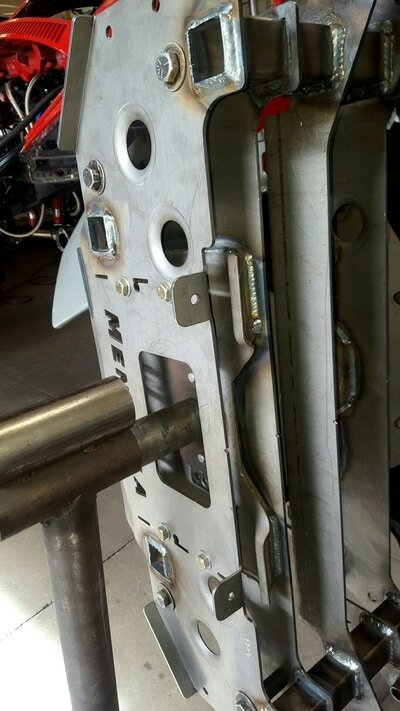 AFTER WE MAKE IT FUNCTION LIKE A MODERN SPORTS CAR, WE'LL MOST LIKELY BE ADDING SOME SERIOUR STYLING ITEMS. 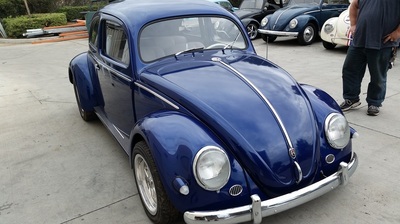 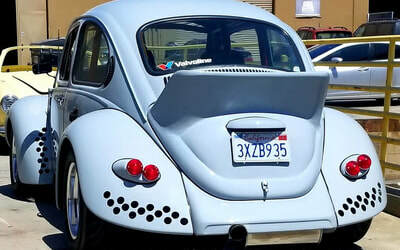 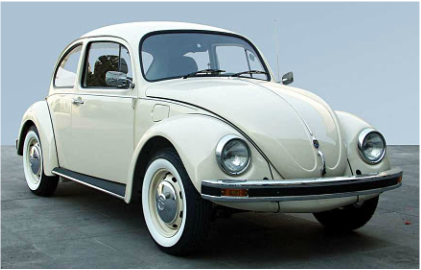 IN 2003 VOLKSWAGEN MADE ONLY 3500 OF THEIR ICONIC BEETLE IN TWO COLORS, CREME THAT YOU SEE HERE AND BABY BLUE. 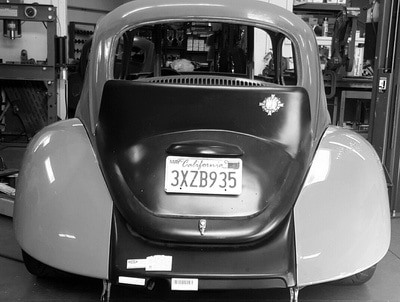 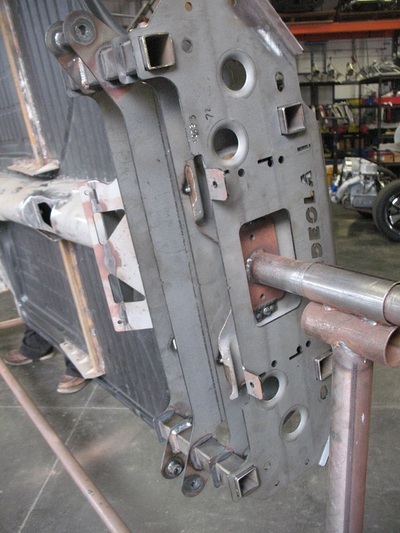 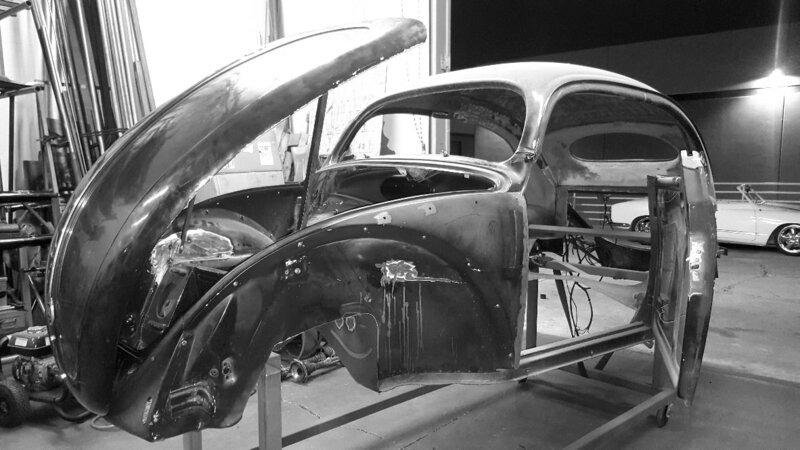 WHEN THEY BUILT THOSE LAST BEETLES, THEY KNEW THEY WOULD NEVER BE MAKING THEM AGAIN. 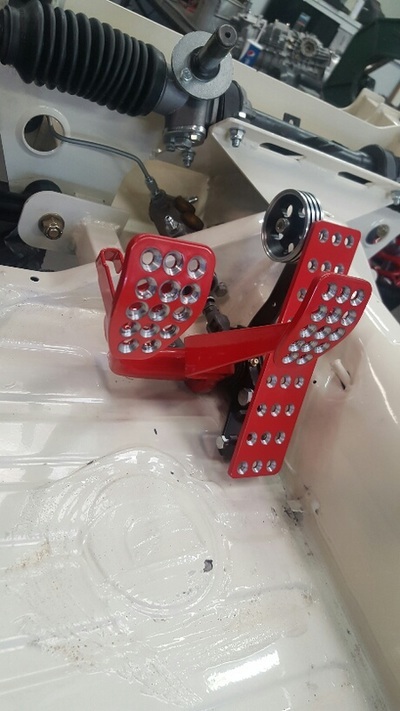 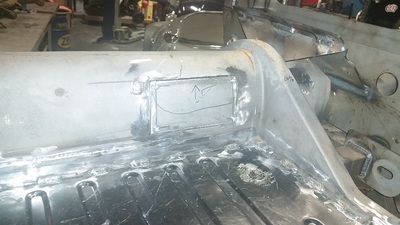 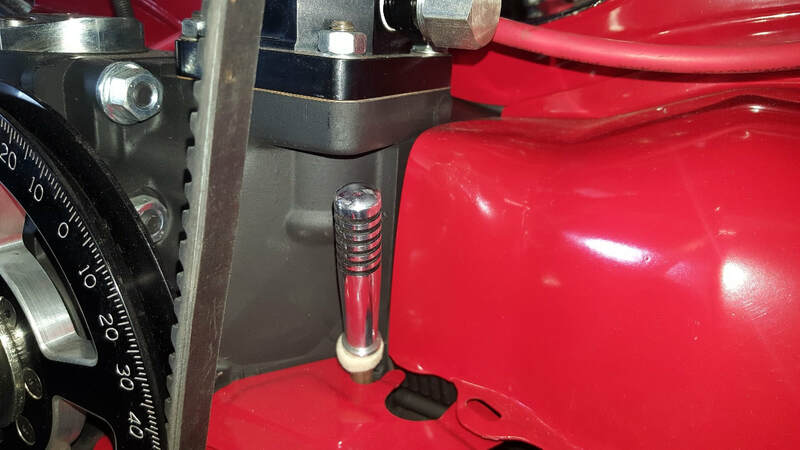 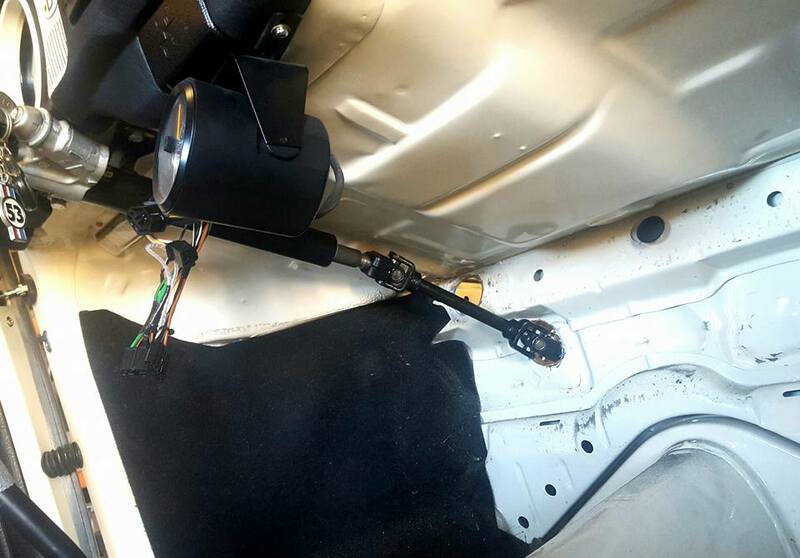 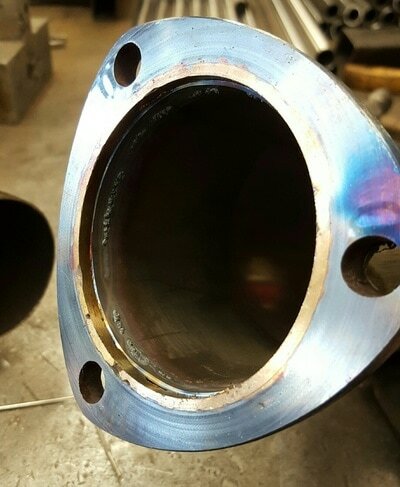 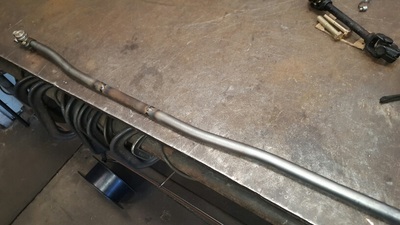 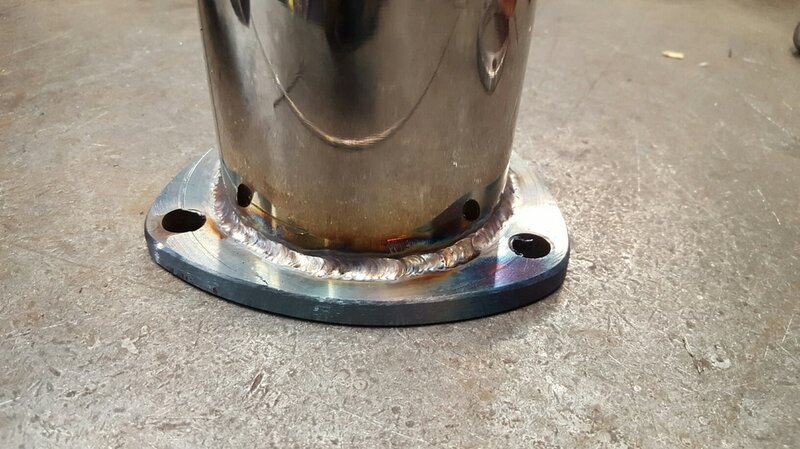 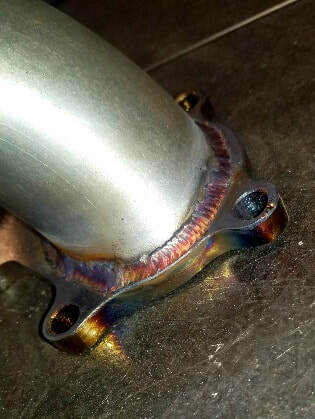 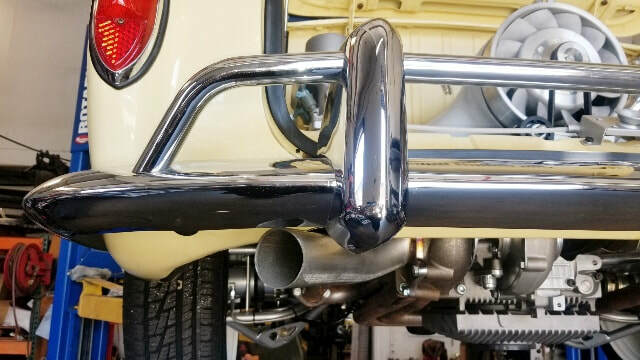 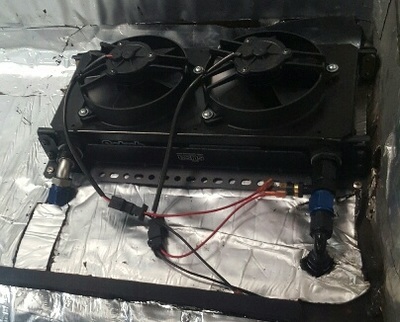 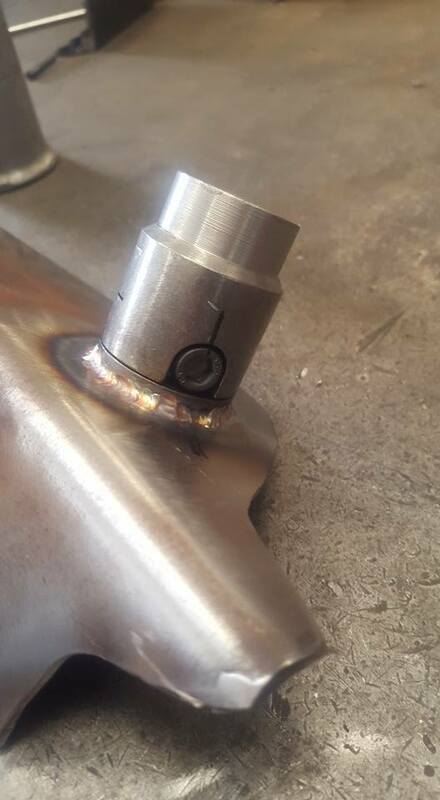 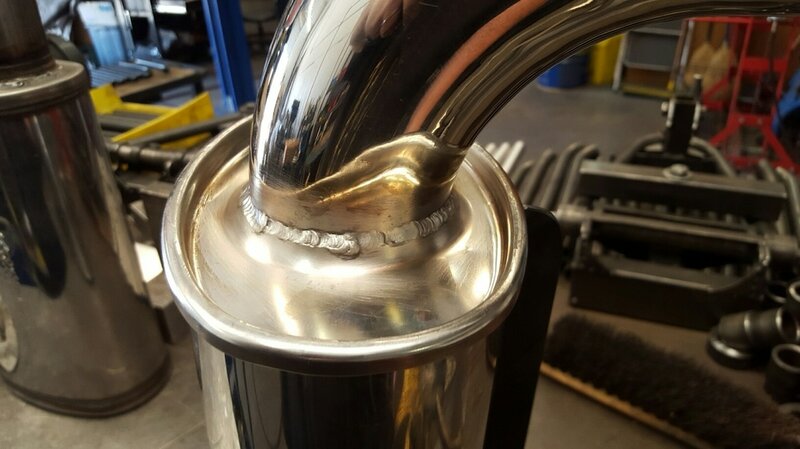 OUR CUSTOMER WAS ABLE TO PURCHASE TWO OF THE FINAL 3500 AND HAS ALWAYS WANTED AND WONDERED COULD ONE OF THESE BE MADE TO BE MORE THEN IT ALREADY IS. 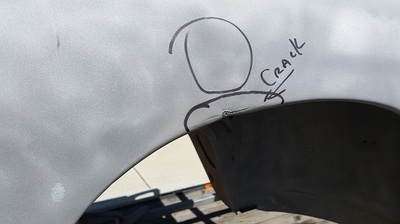 THE ANSWER IS ﻿YES !!!!!! 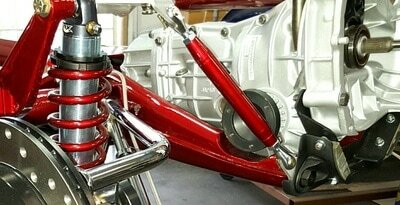 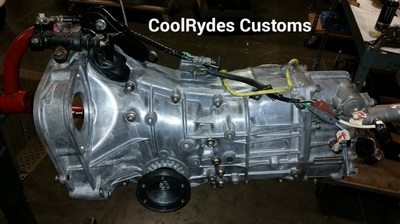 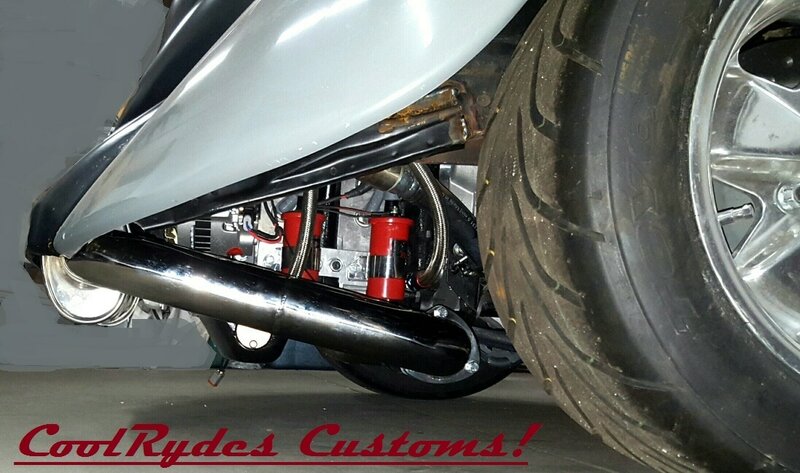 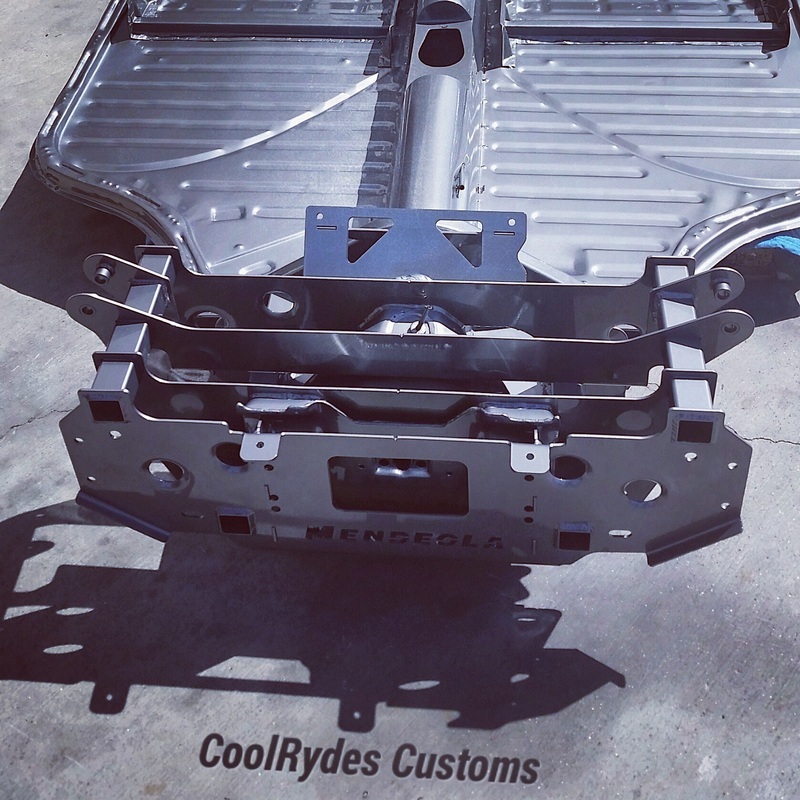 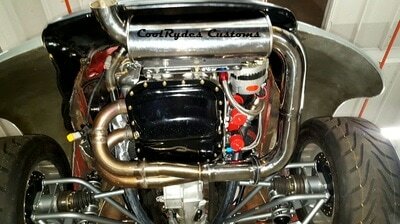 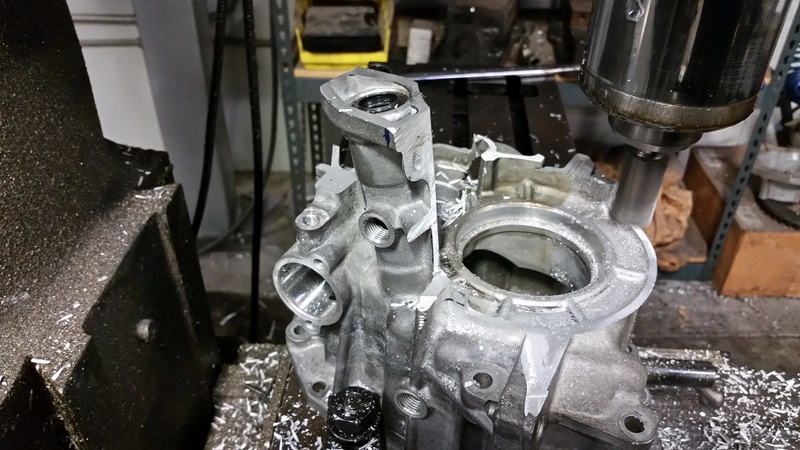 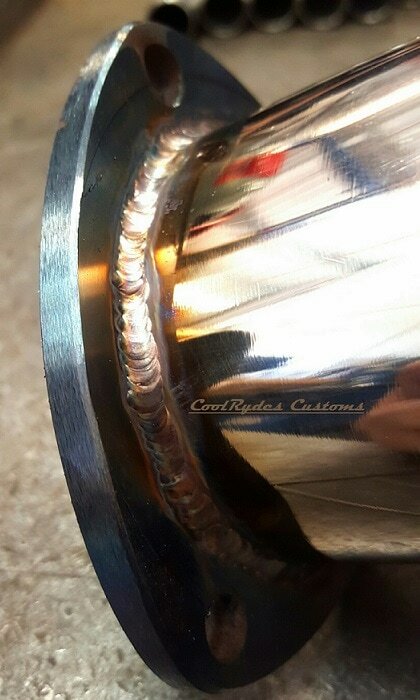 THIS IS WHERE COOLRYDES CUSTOMS COMES INTO THE PICTURE. 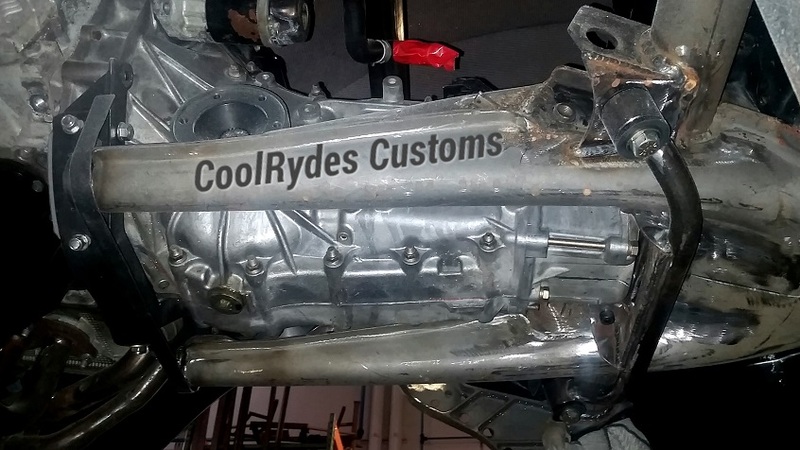 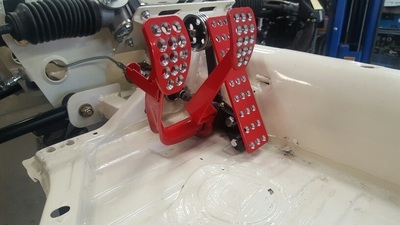 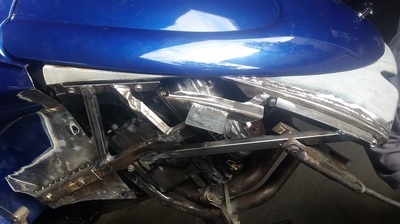 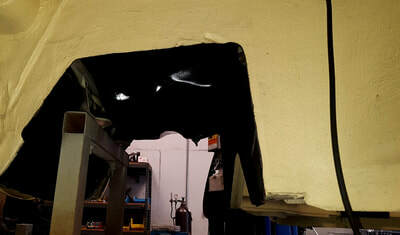 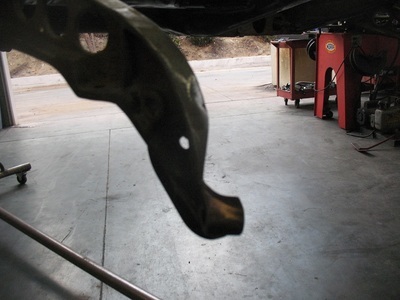 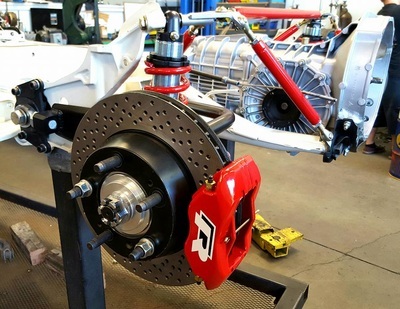 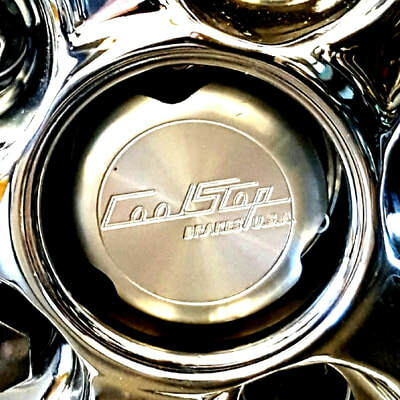 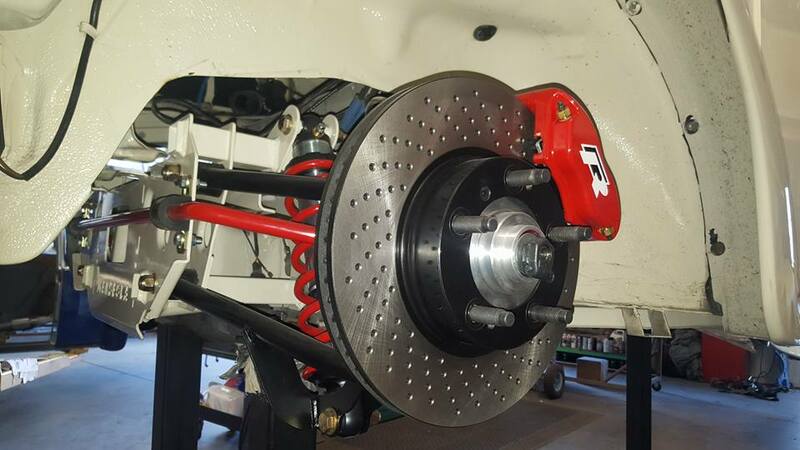 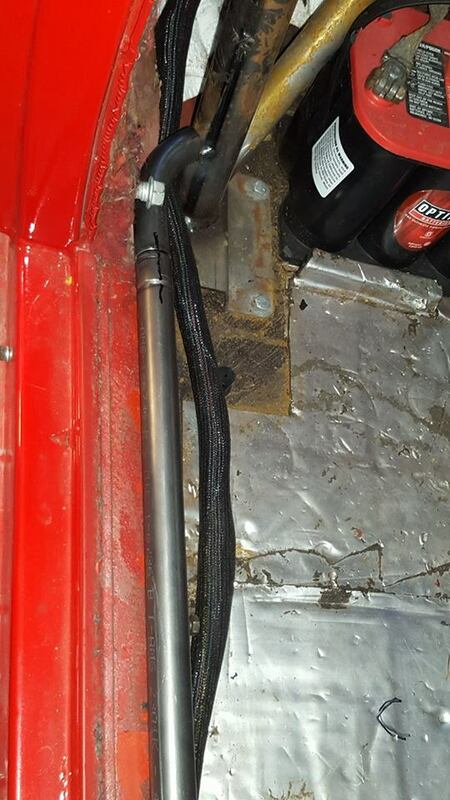 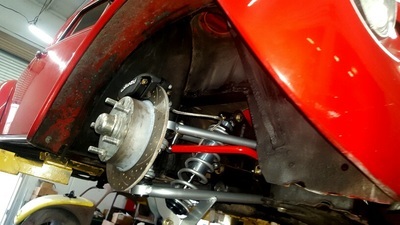 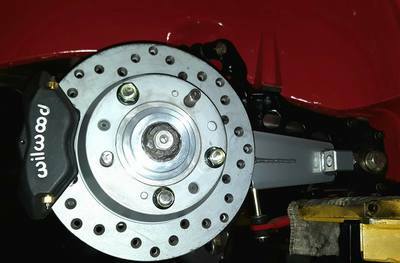 TOP DESIGNED KEVIN "CoolRydes" ZAGAR HAS BEEN AND WILL CONTINUE TO BE A CAR NUT. 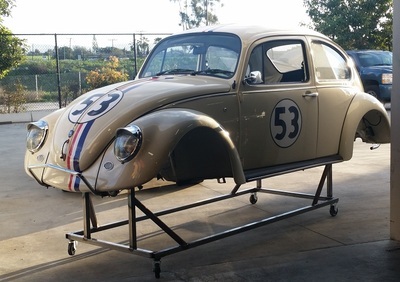 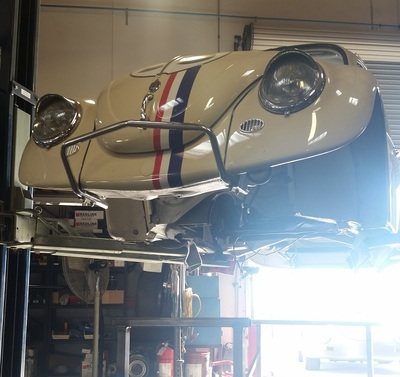 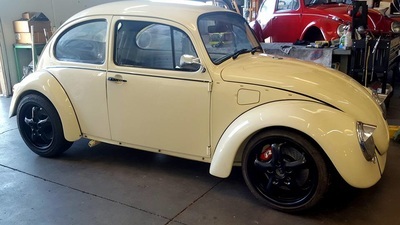 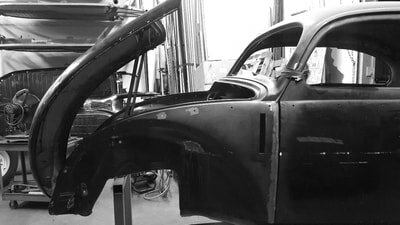 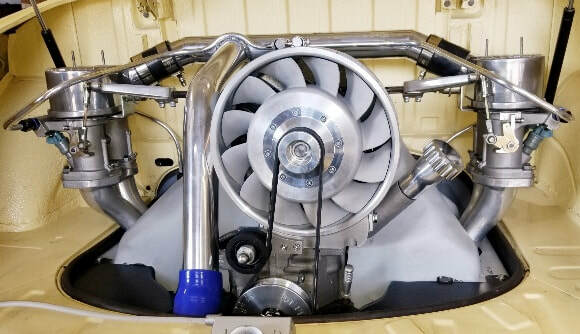 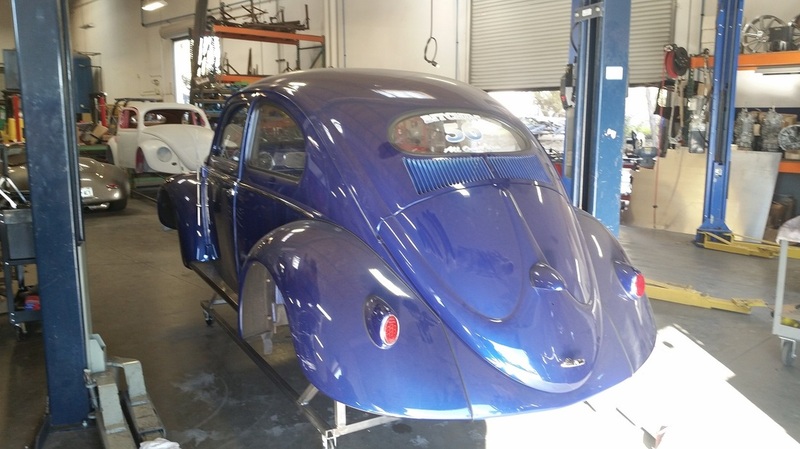 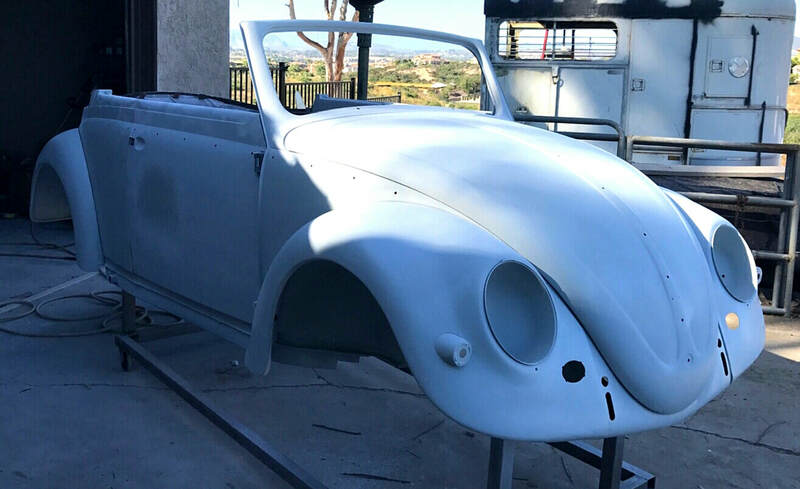 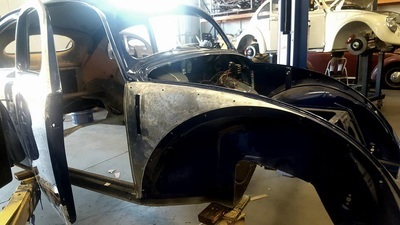 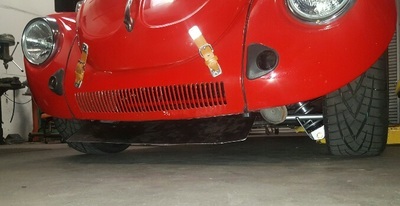 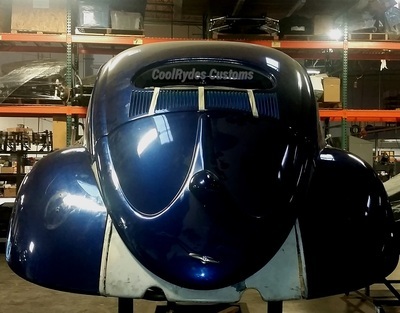 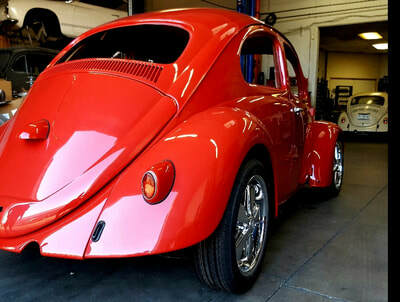 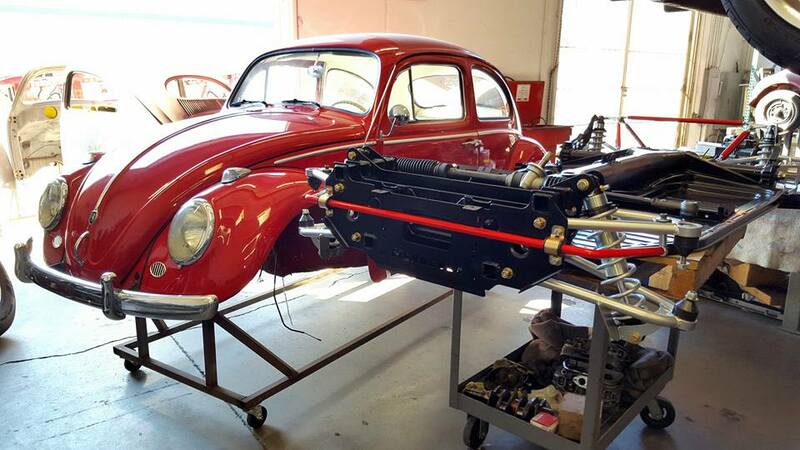 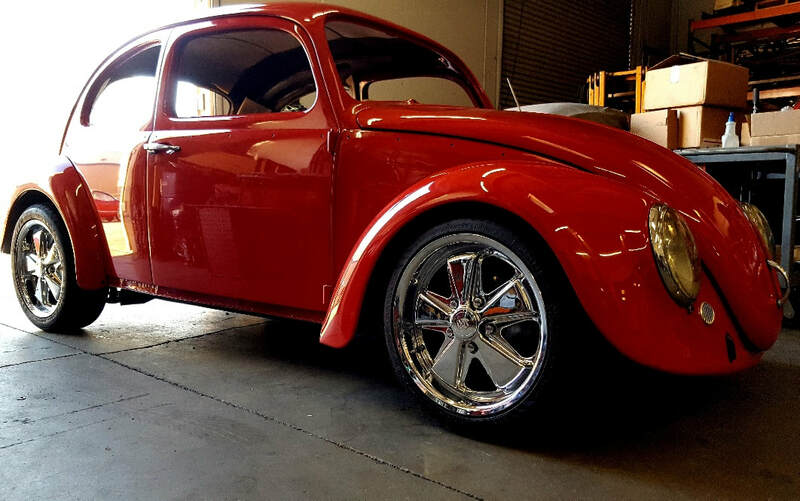 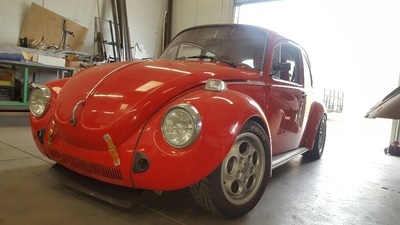 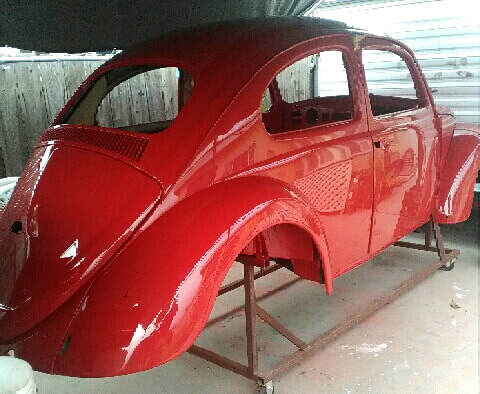 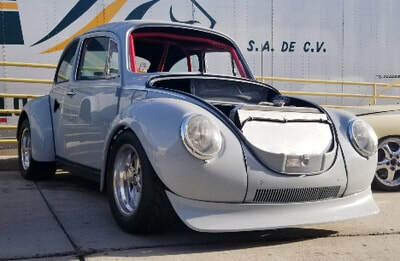 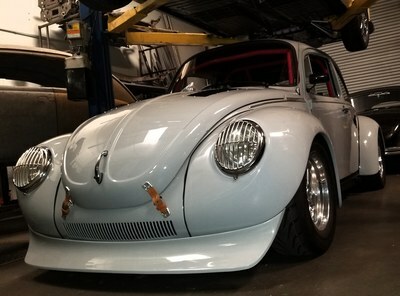 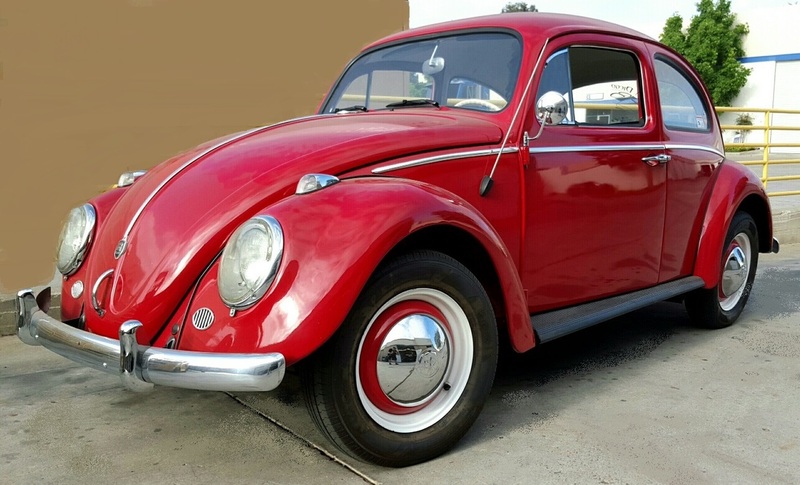 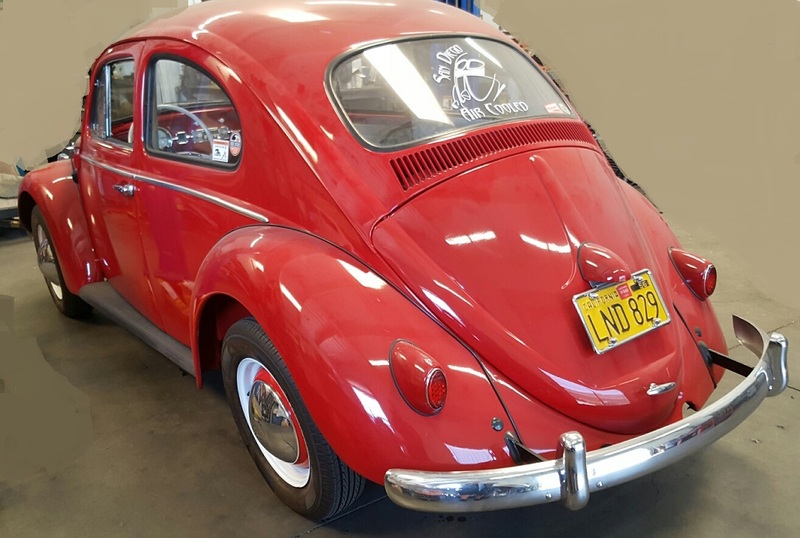 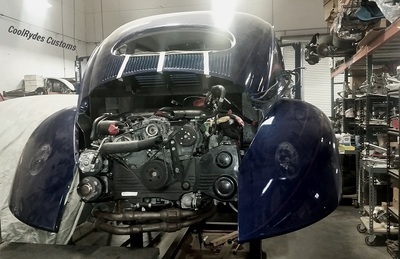 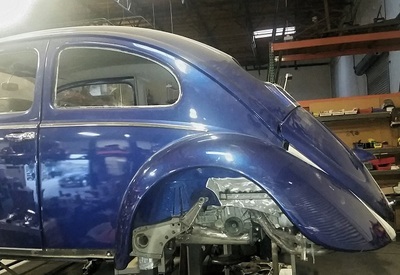 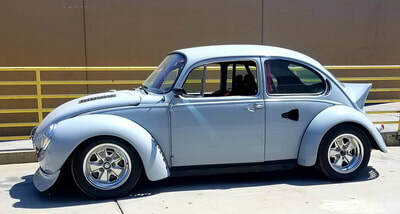 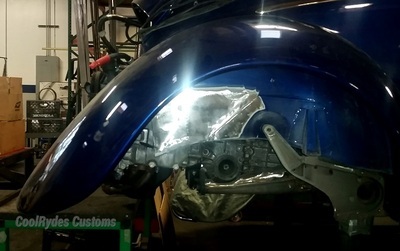 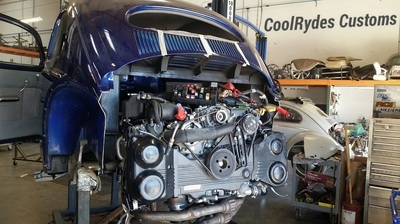 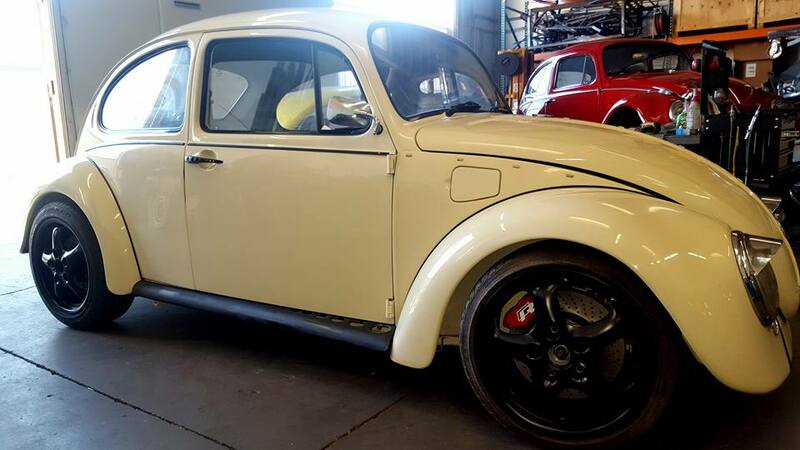 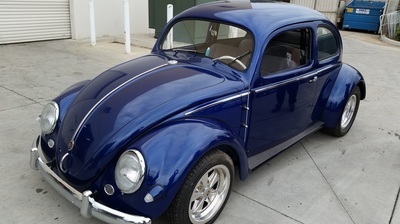 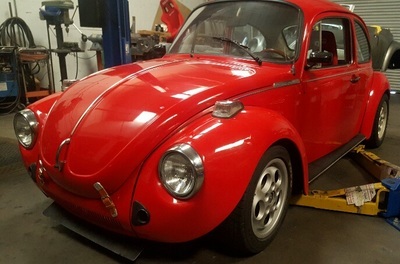 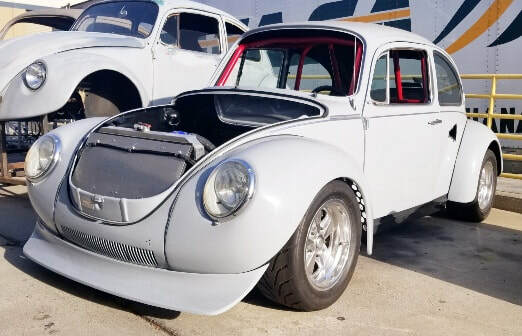 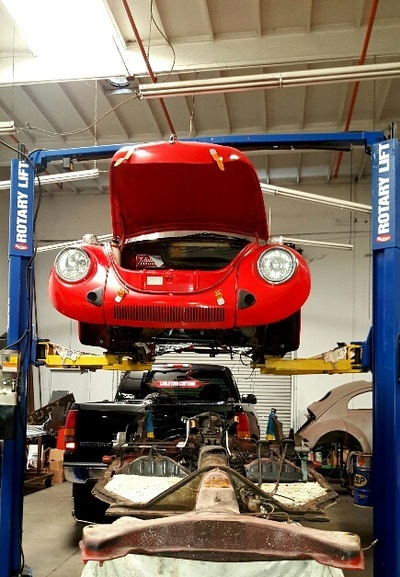 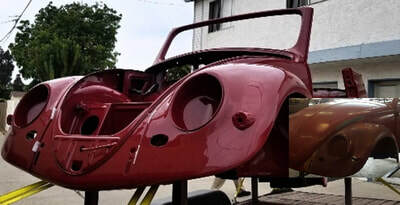 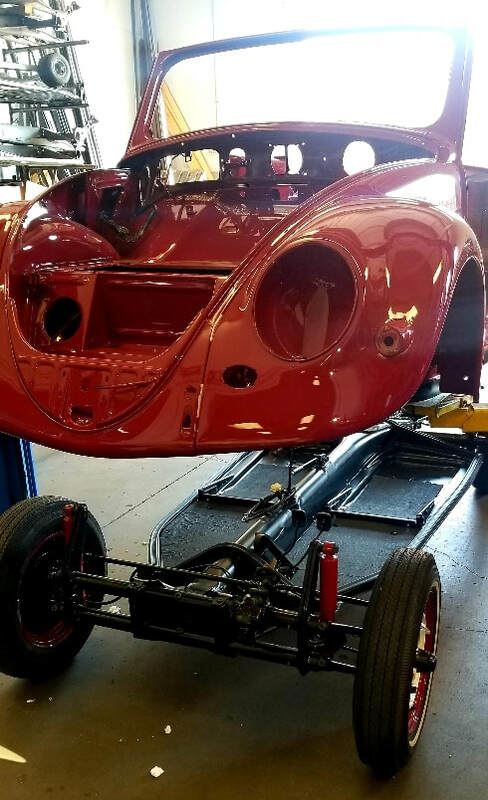 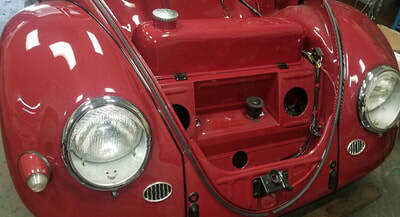 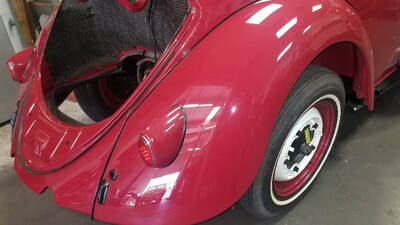 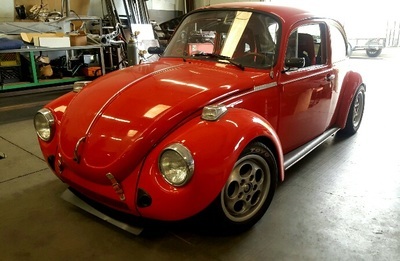 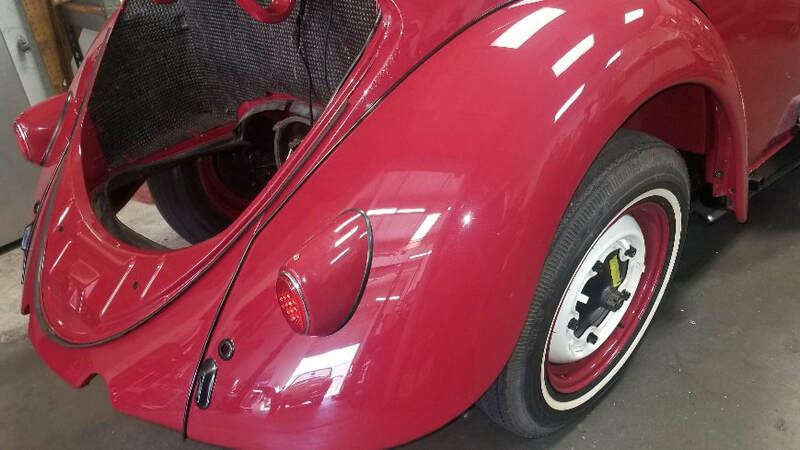 HE AND THE CREW AT COOLRYDES CUSTOMS WILL BE CHANGING THIS HUM-DRUM LITTLE BEETLE INTO WHAT VOLKSWAGEN WOULD HAVE DONE IF THEY WOULD HAVE BUILT A BEELTE EQUIVALENT TO PORSCHE'S 993 RS LIMMITED EDITION. 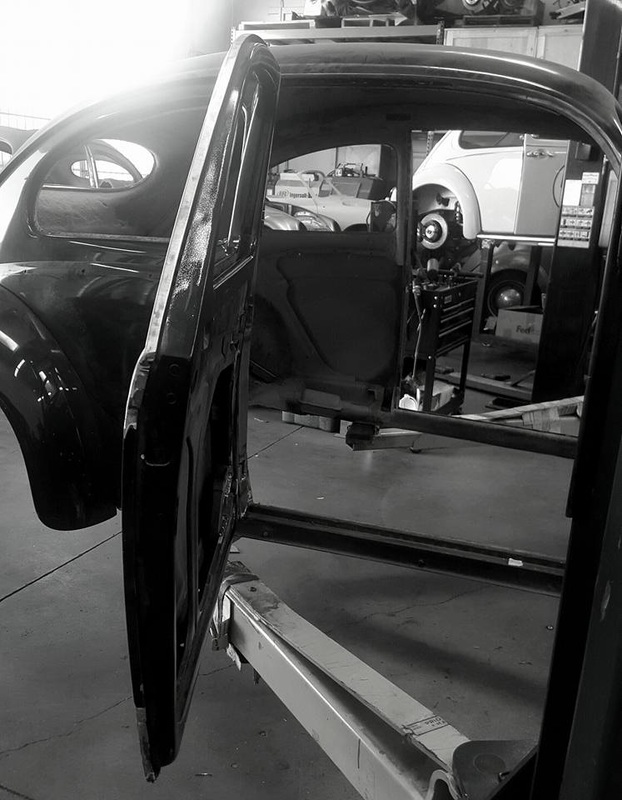 STAY TUNED FOR WHAT HAPPENS. 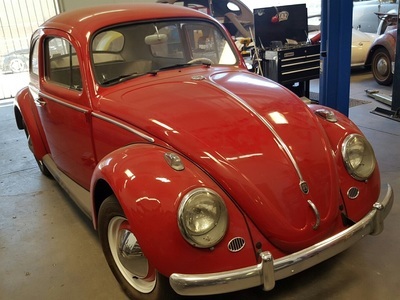 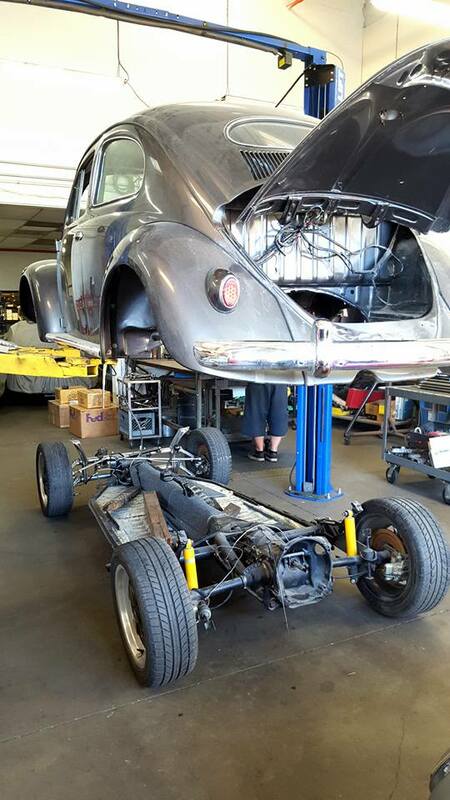 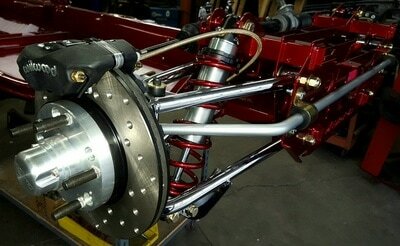 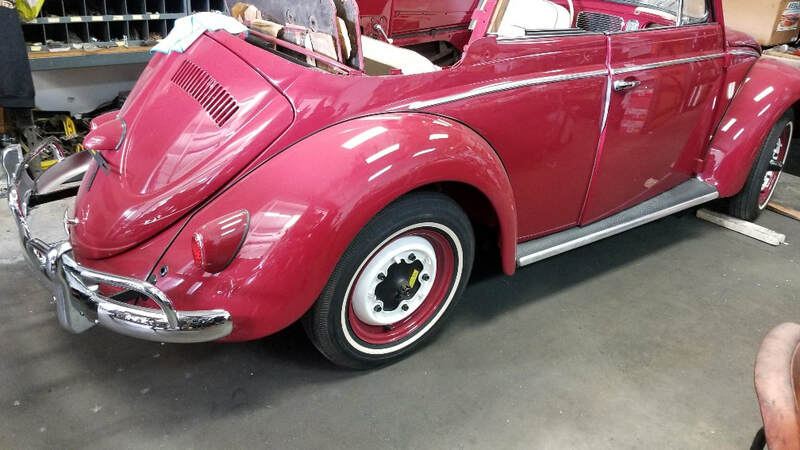 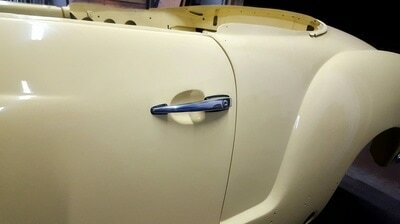 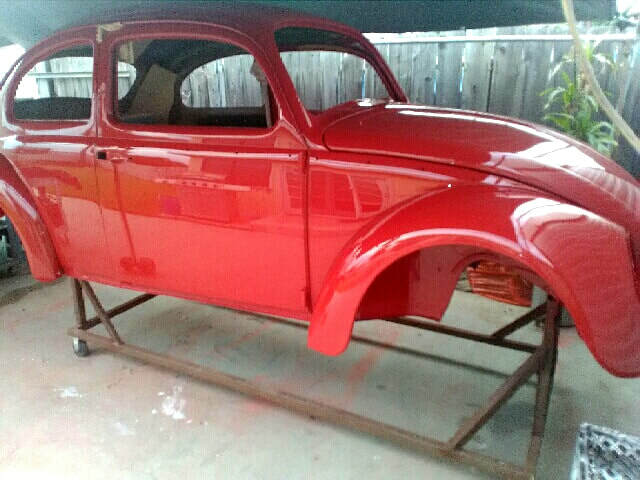 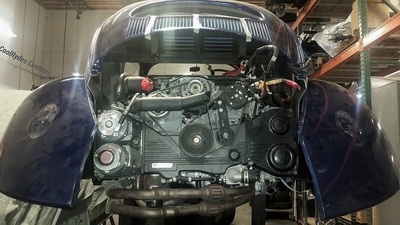 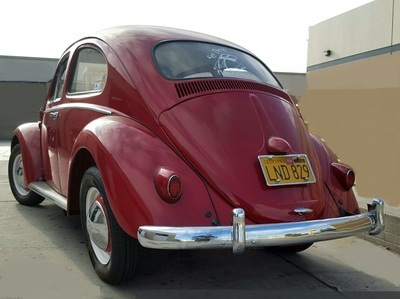 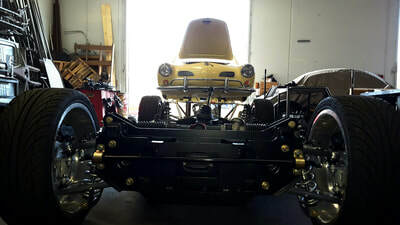 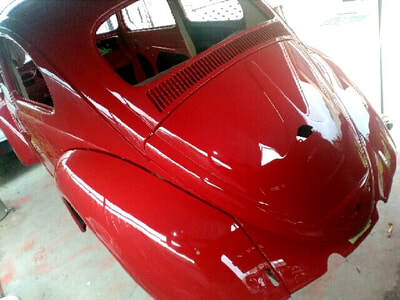 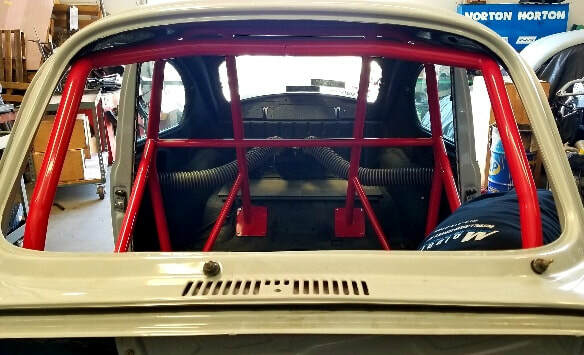 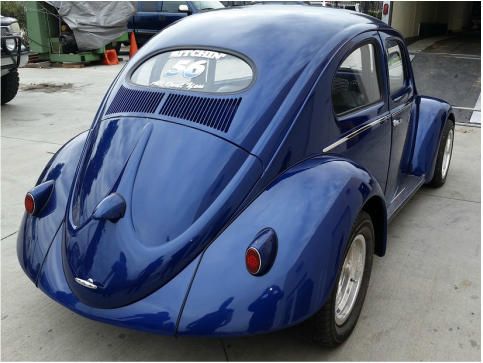 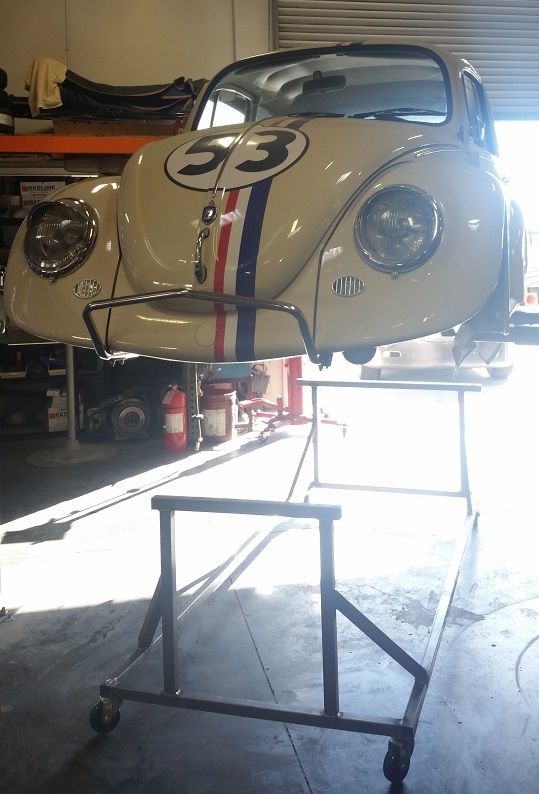 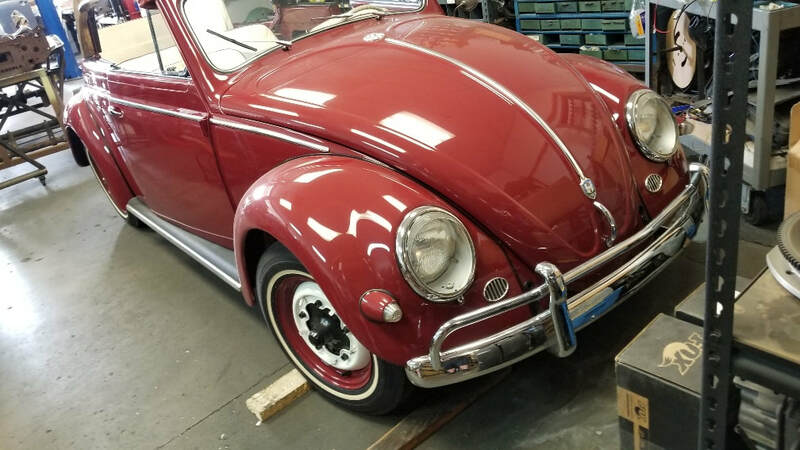 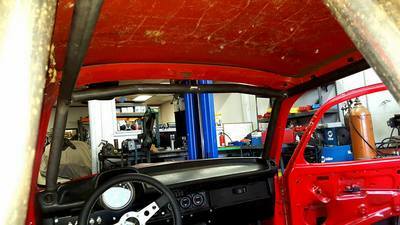 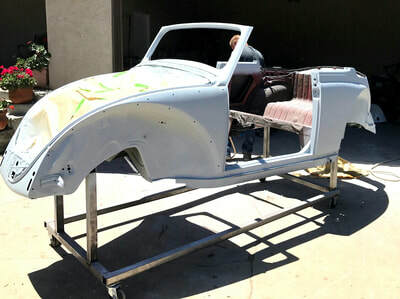 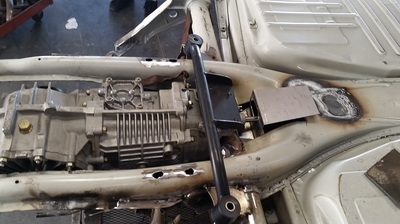 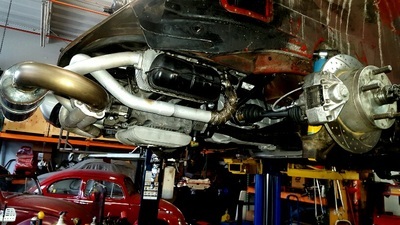 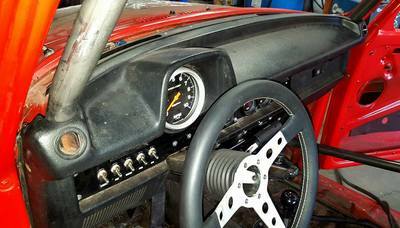 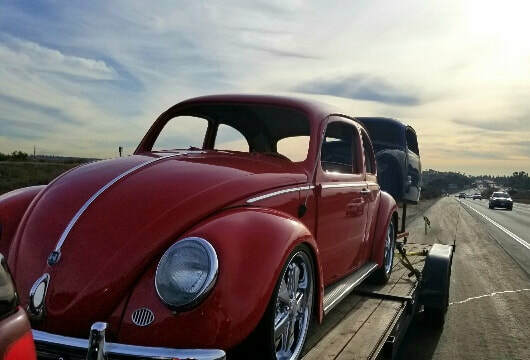 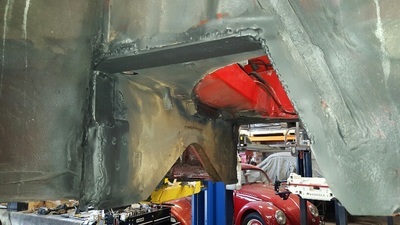 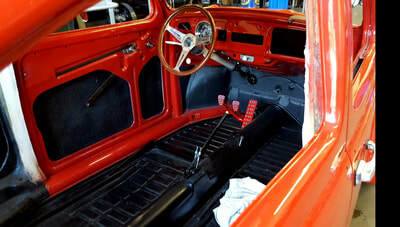 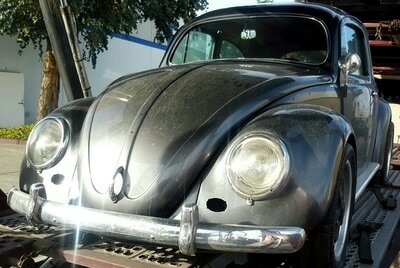 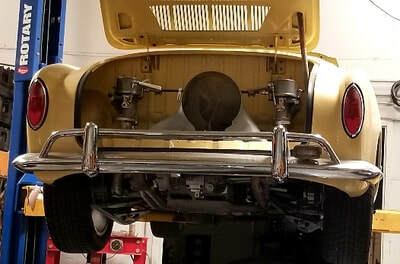 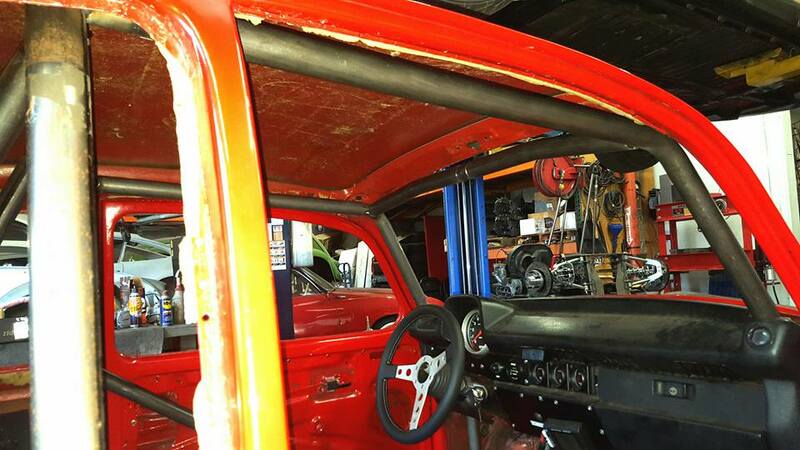 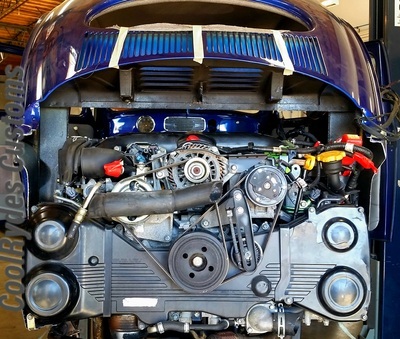 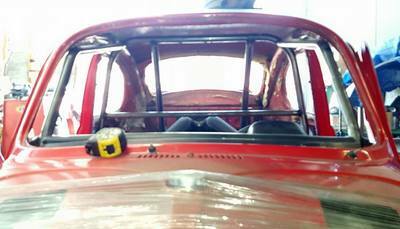 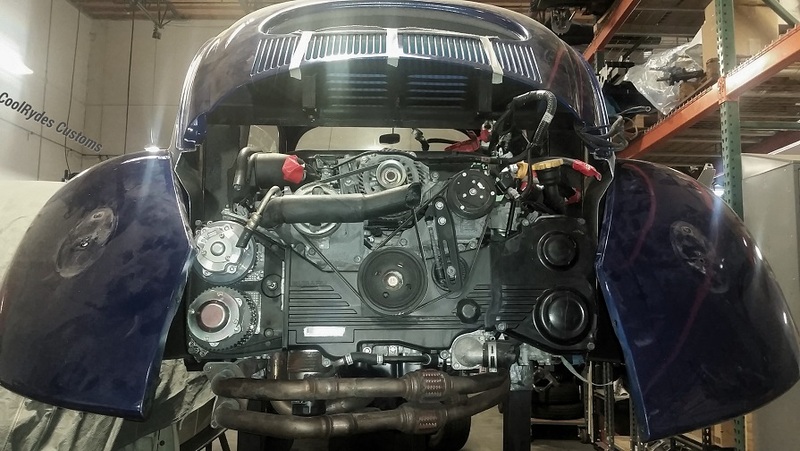 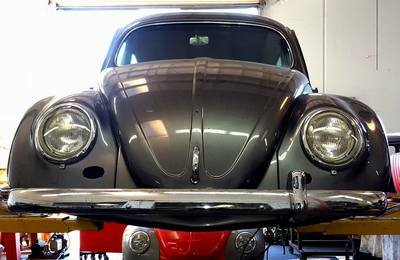 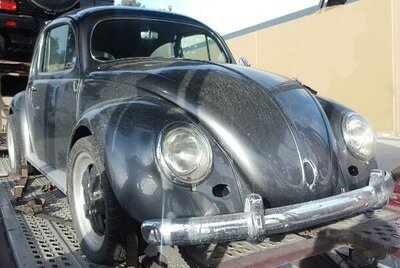 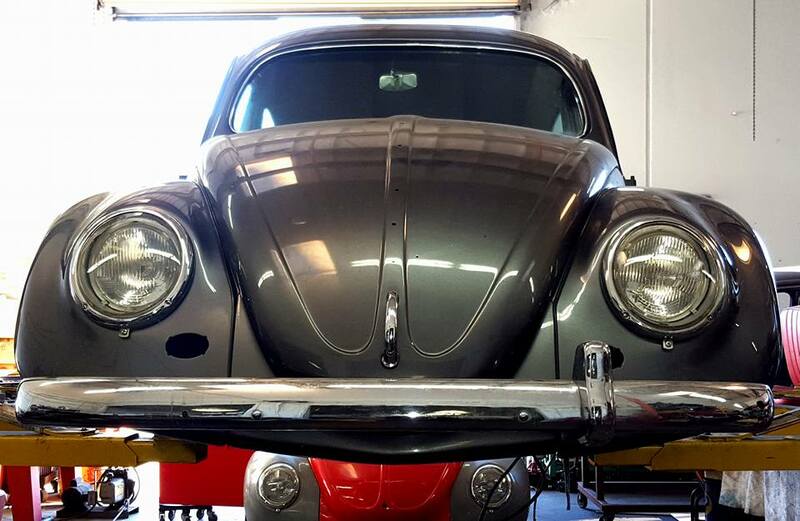 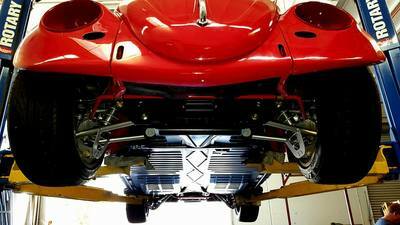 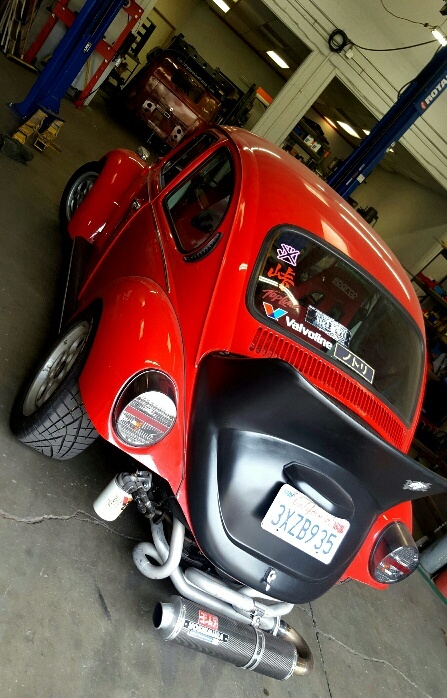 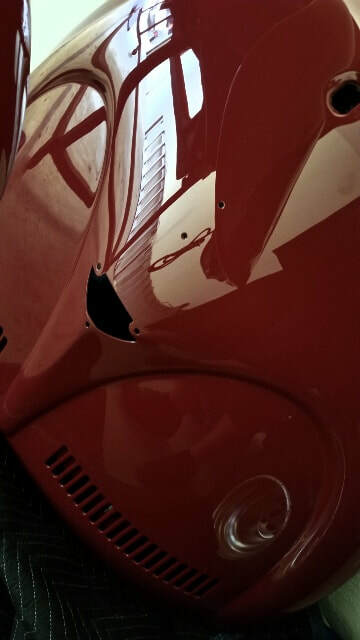 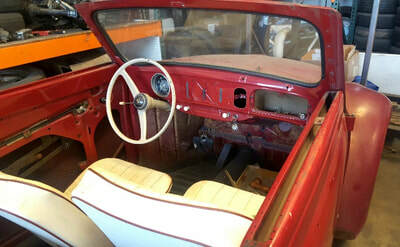 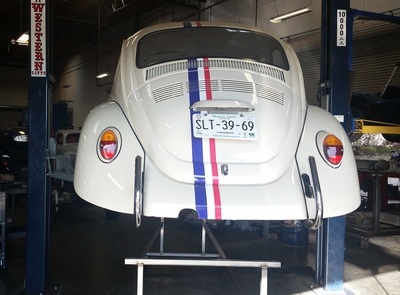 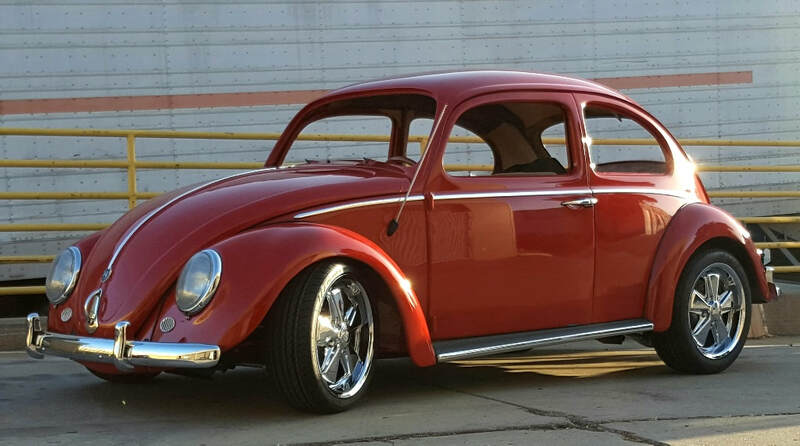 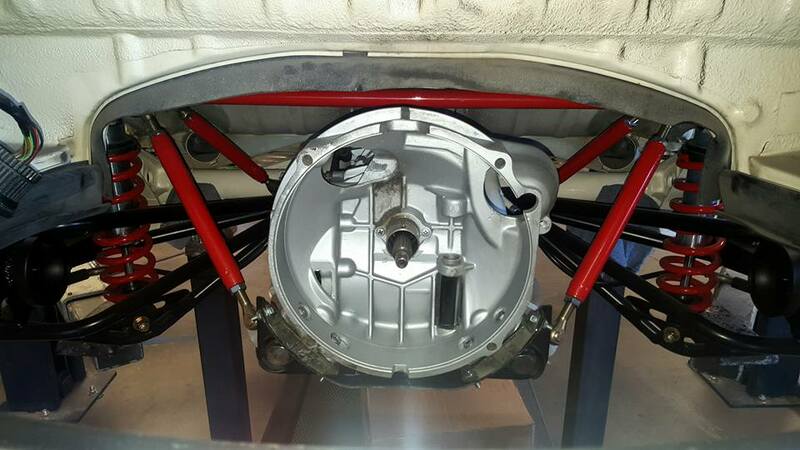 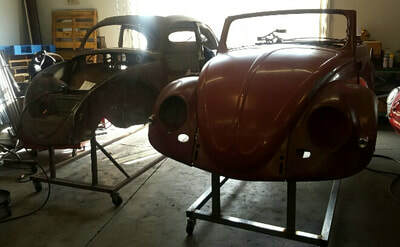 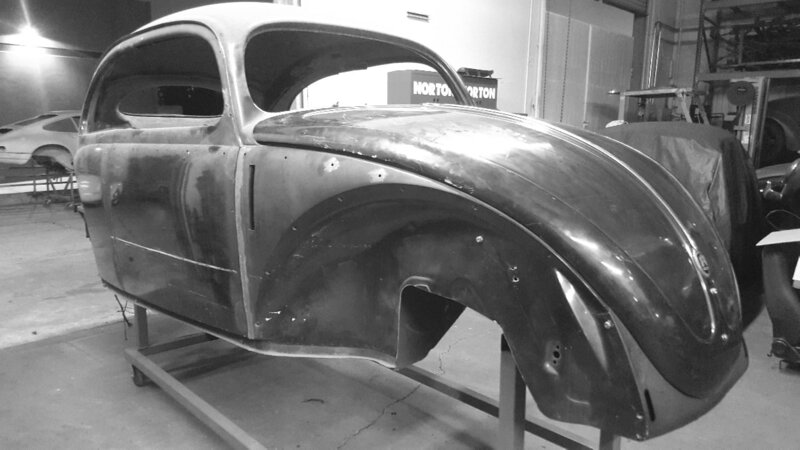 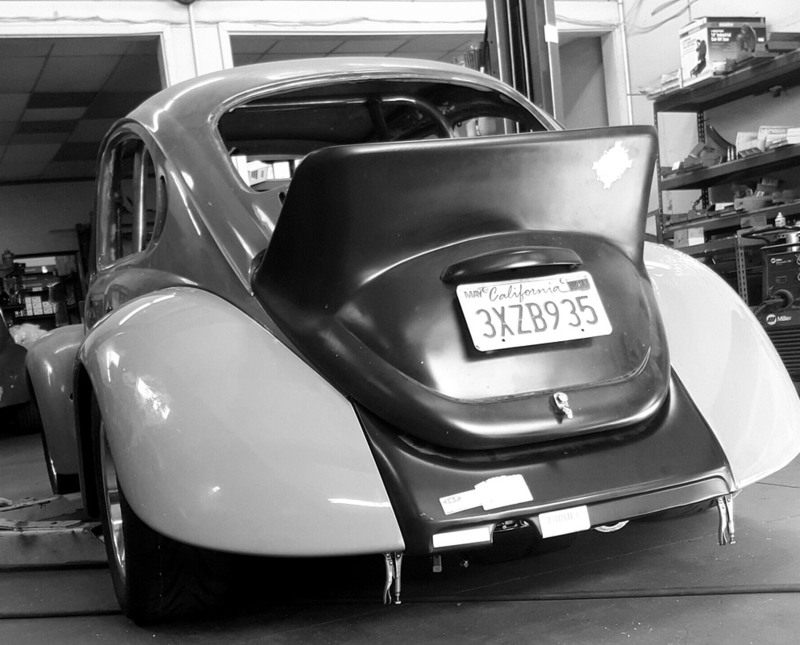 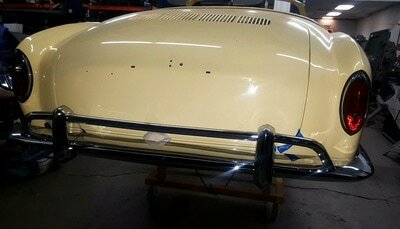 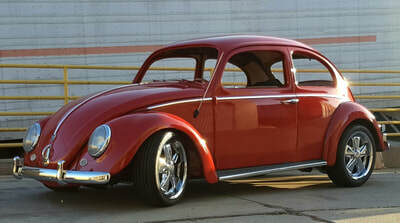 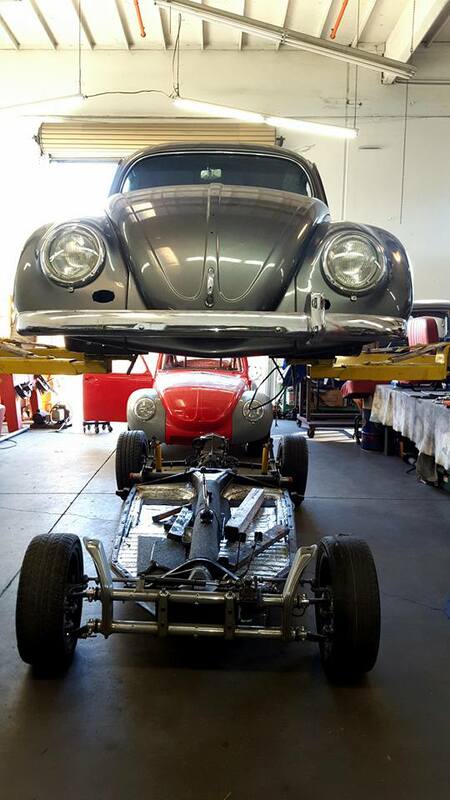 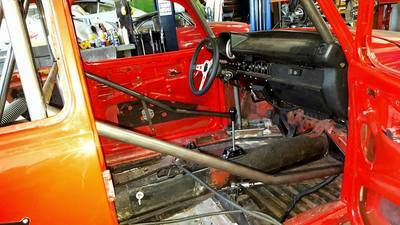 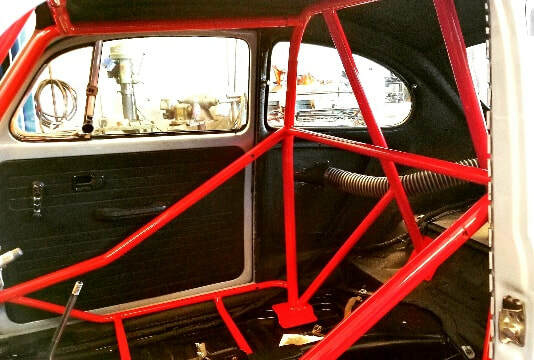 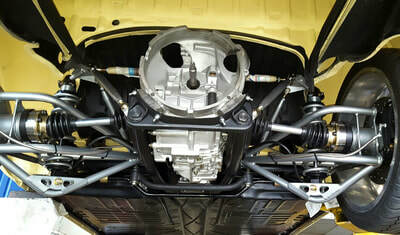 THIS CLEAN AND SIMPLE LITTLE 61' BEETLE IS ABOUT TO GET THE HEART OF A BEAST AND THE ABILITY TO TEAR UP THE ASPHAULT. 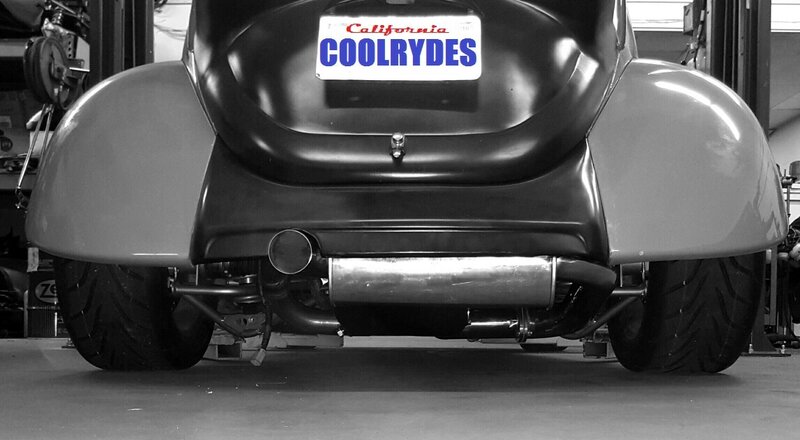 KEEP AN EYE OUT FOR THIS ONE WITH SAN DIEGO'S FINEST BEHIND IT ! 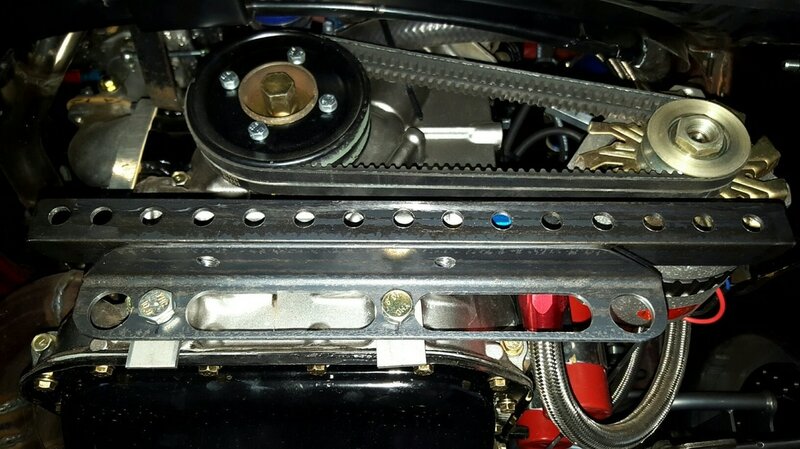 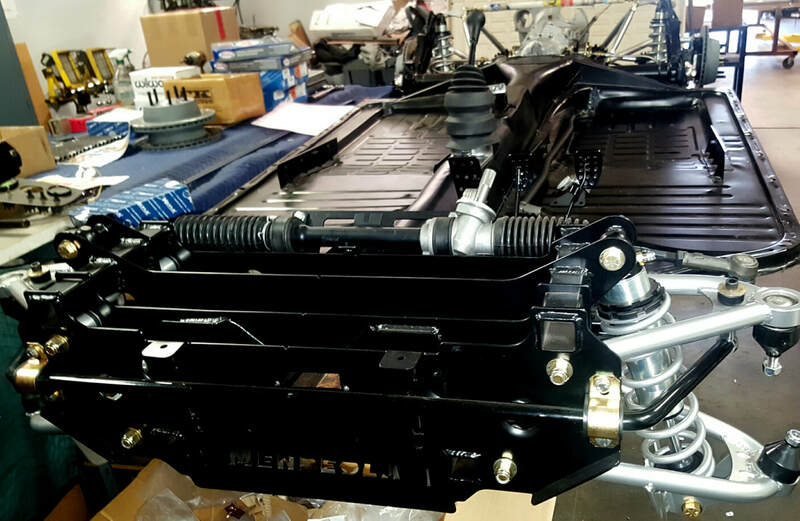 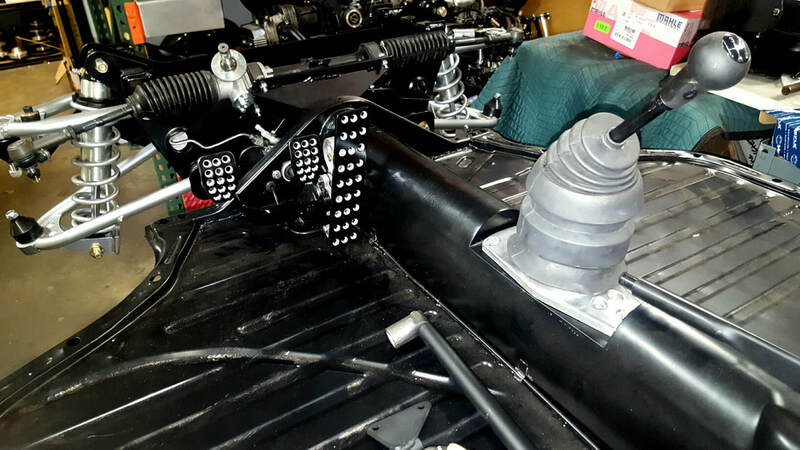 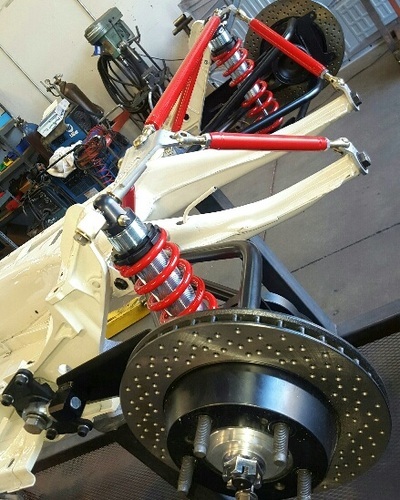 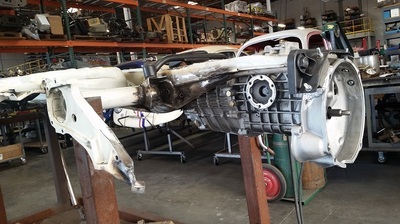 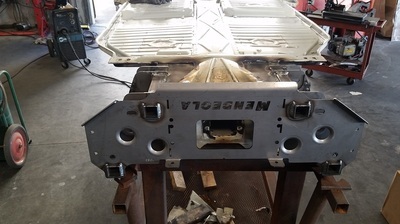 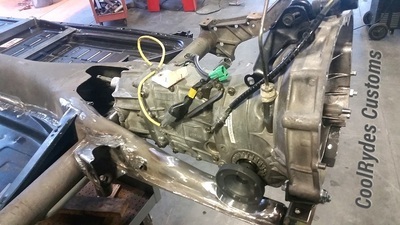 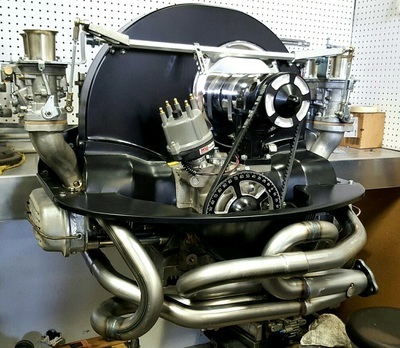 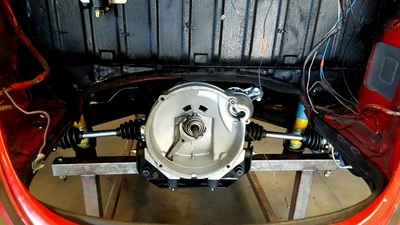 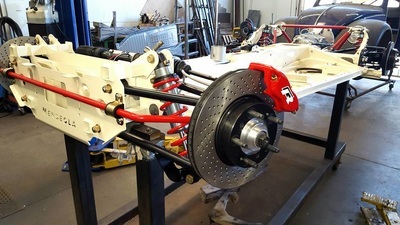 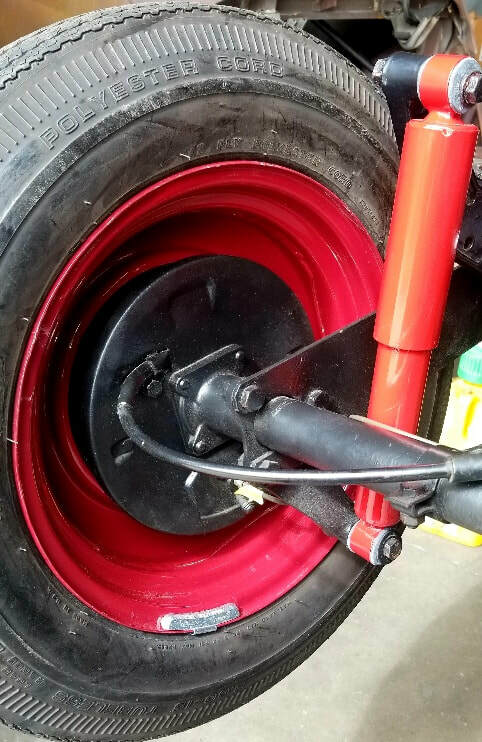 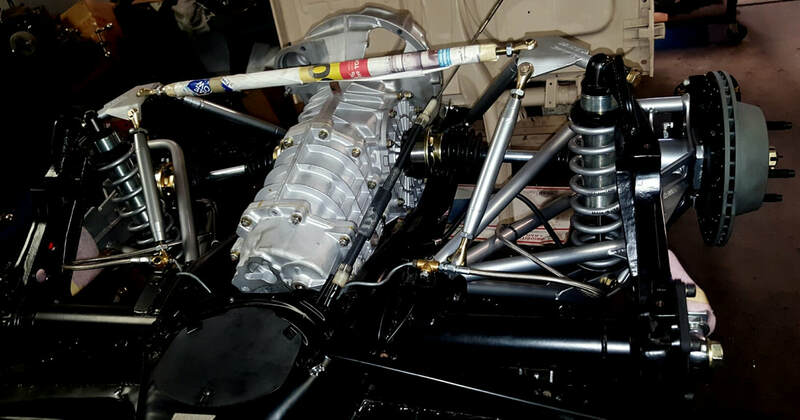 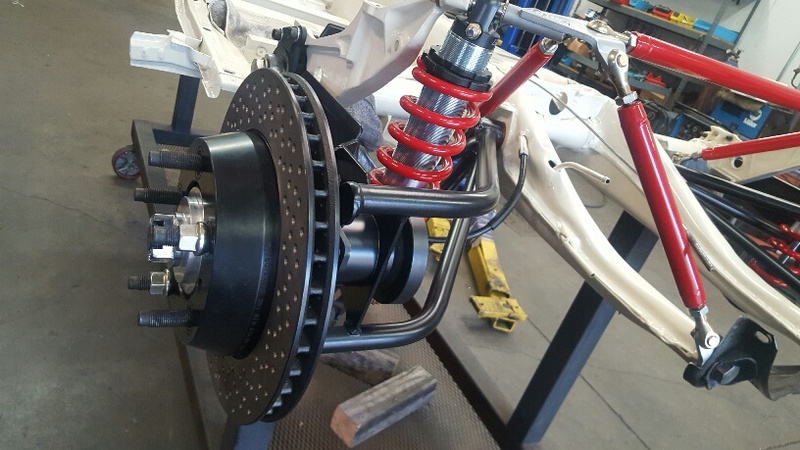 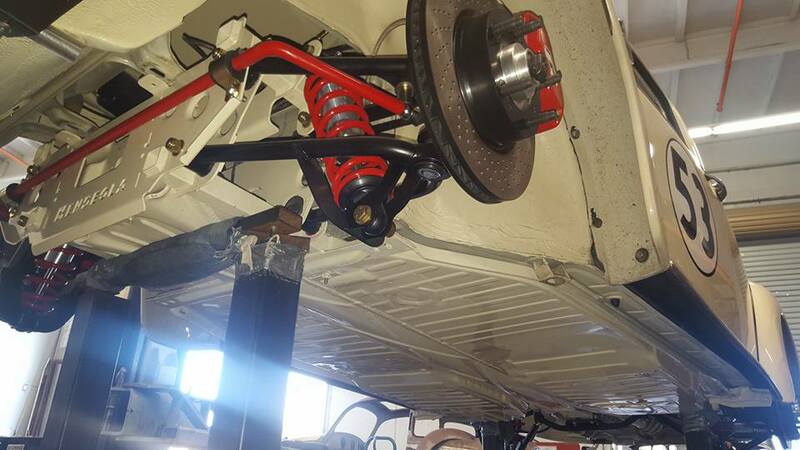 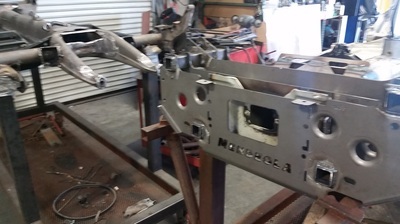 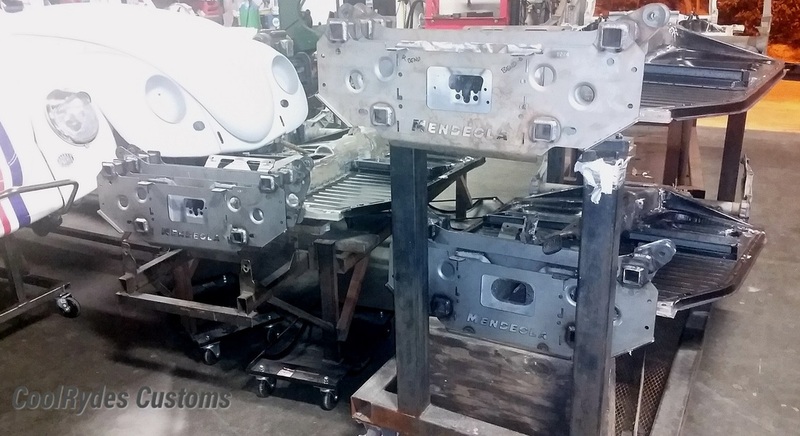 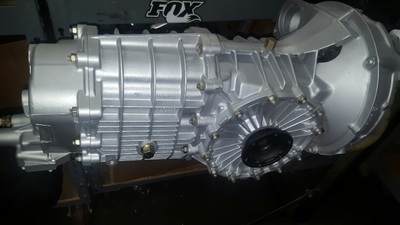 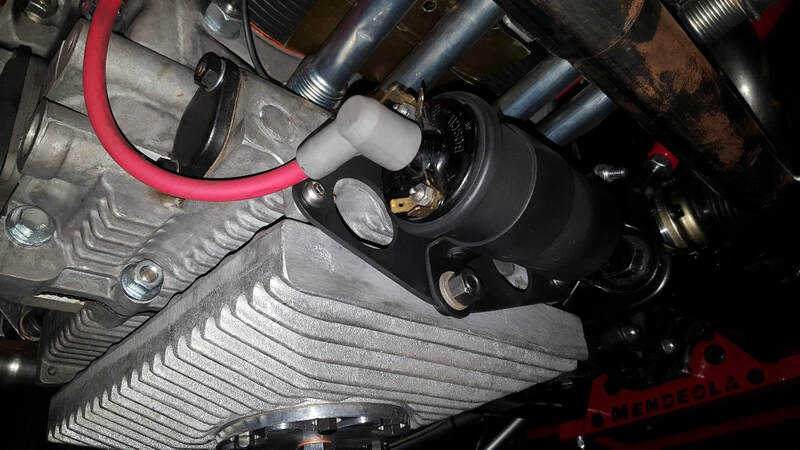 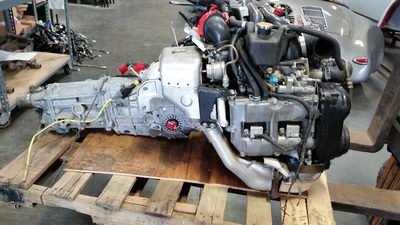 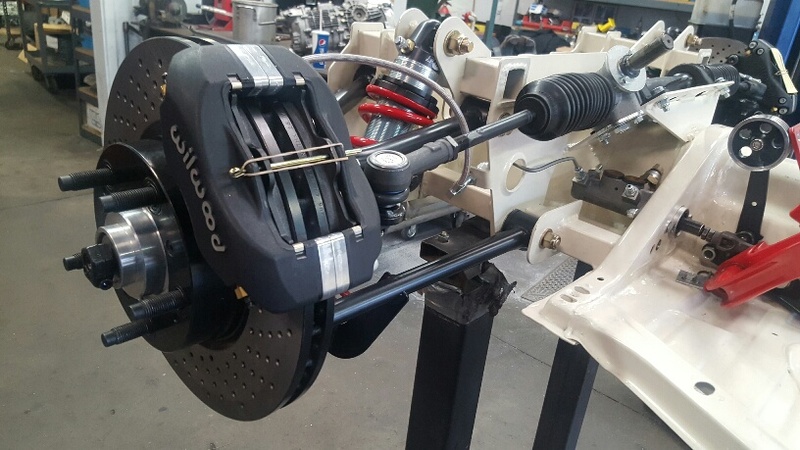 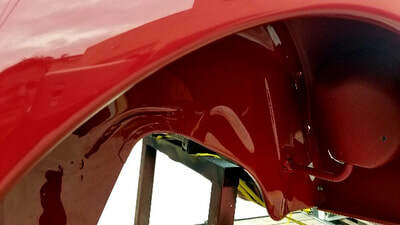 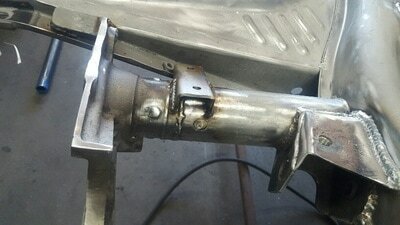 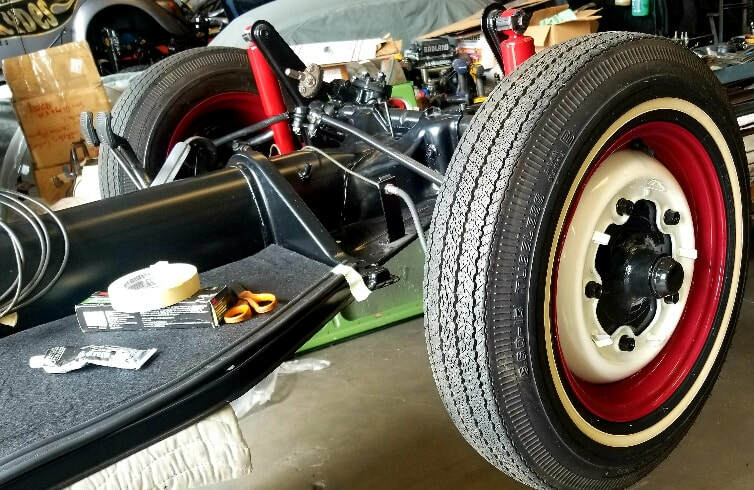 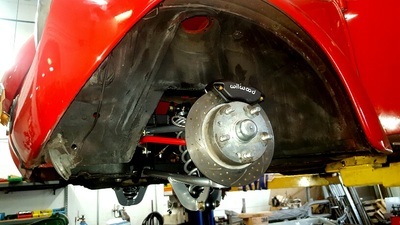 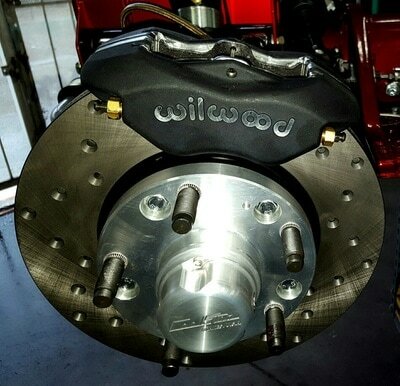 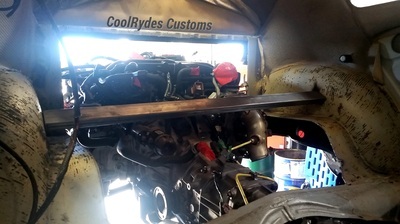 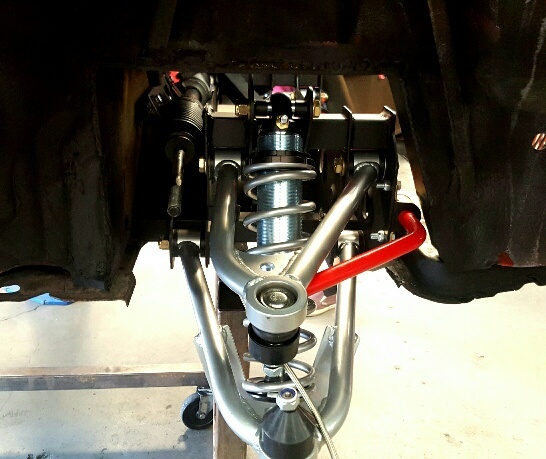 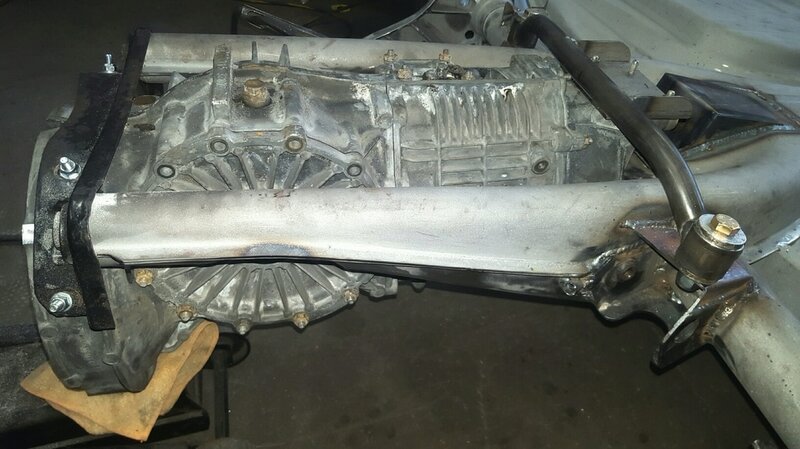 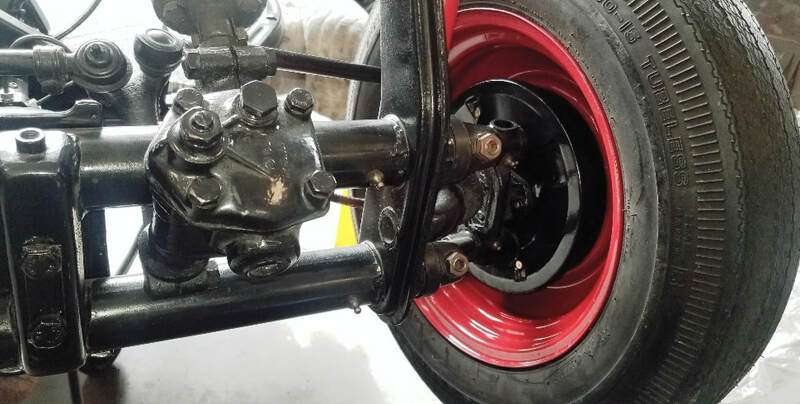 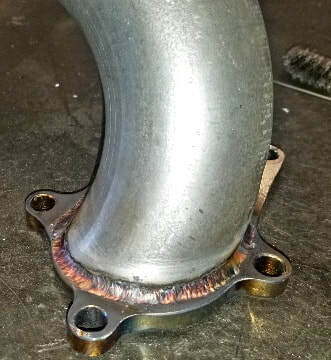 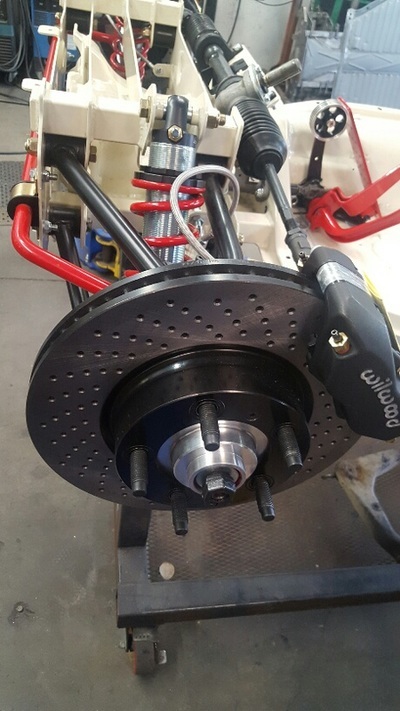 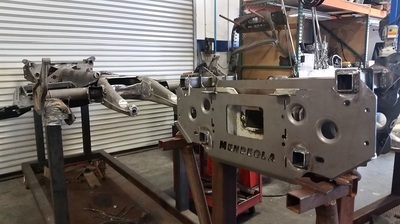 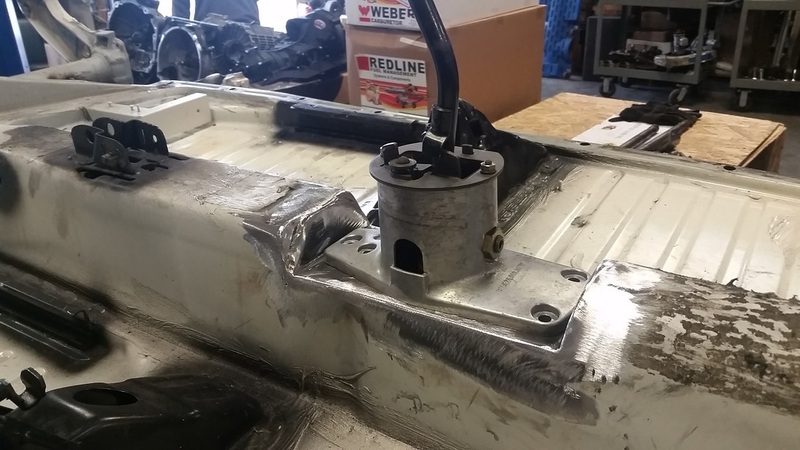 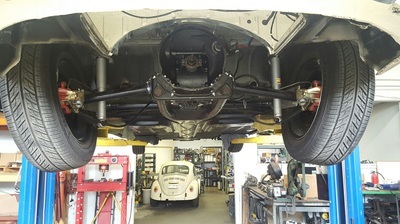 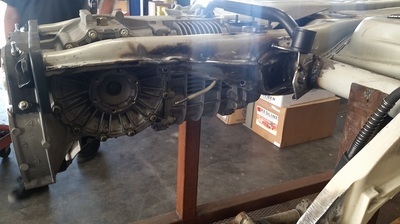 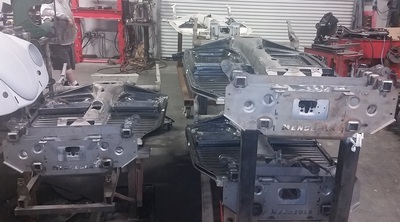 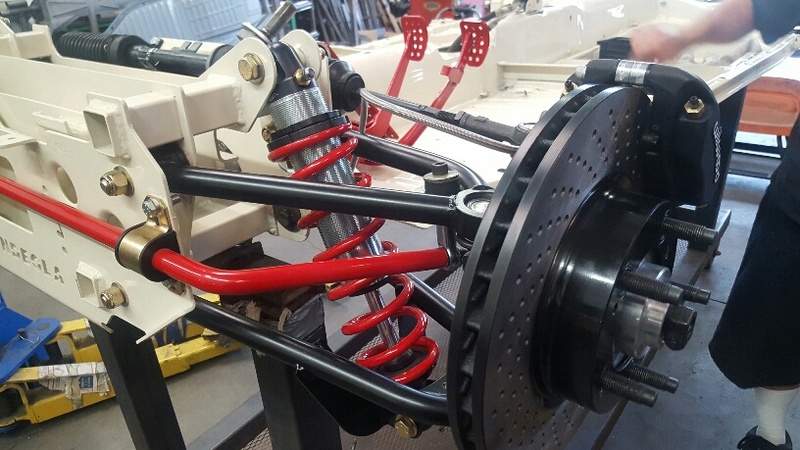 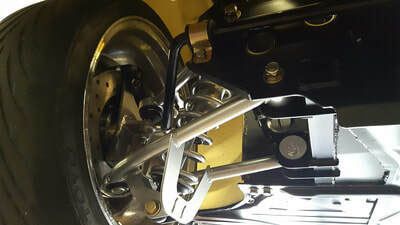 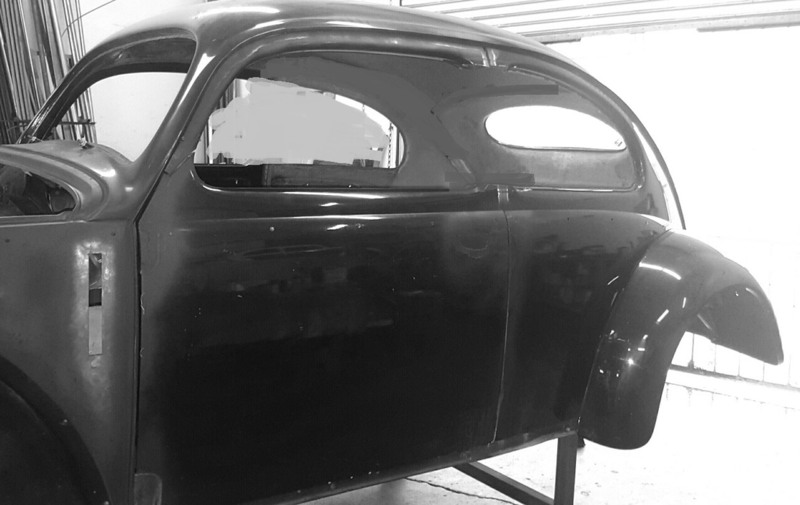 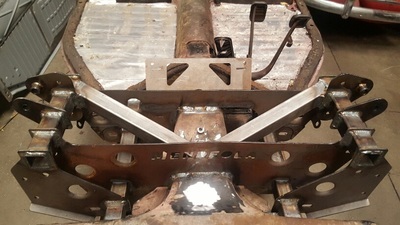 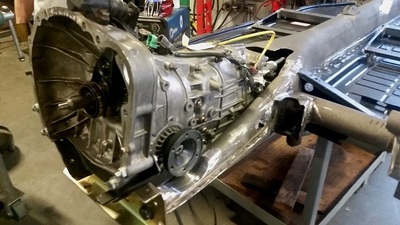 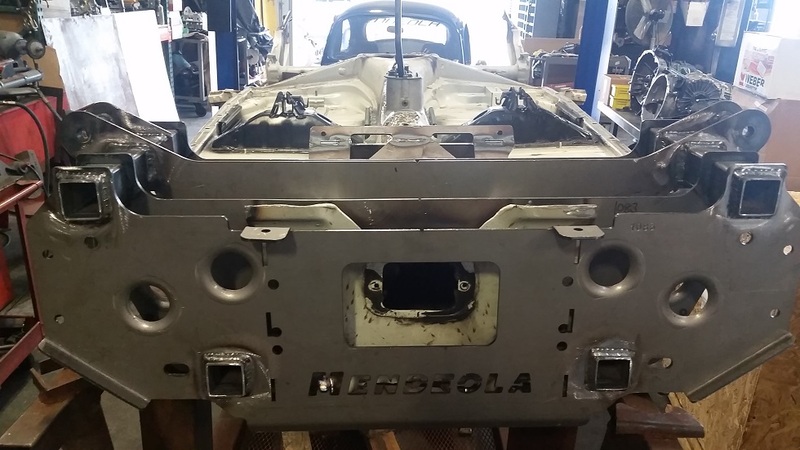 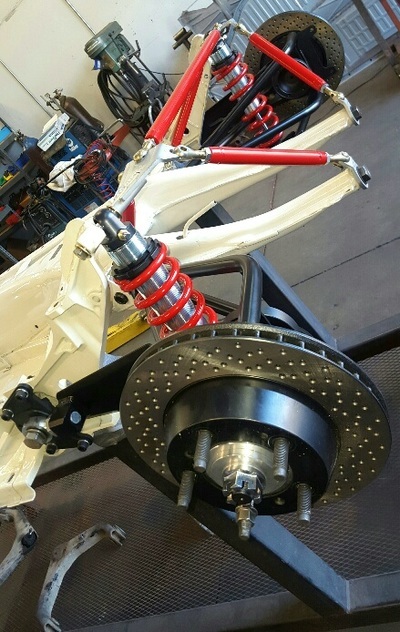 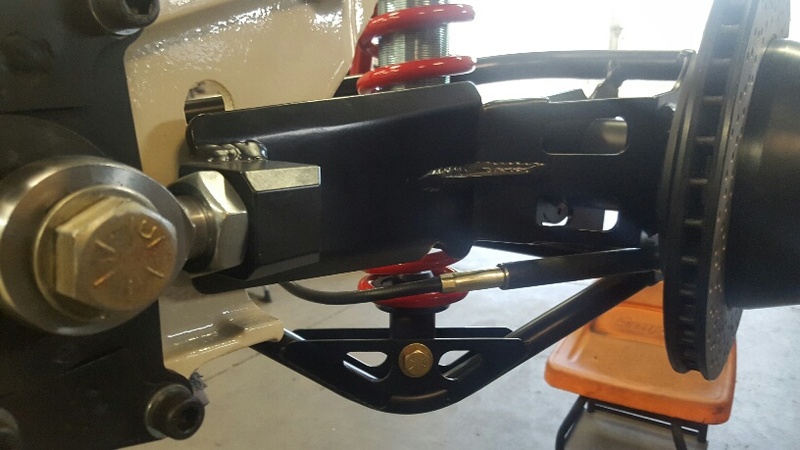 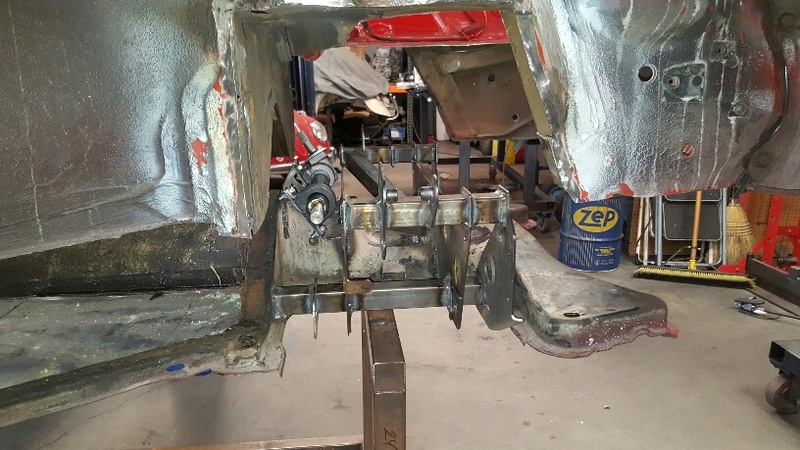 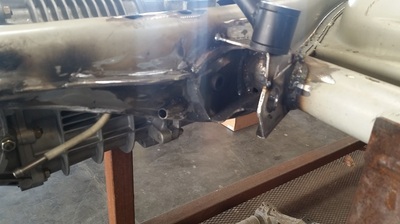 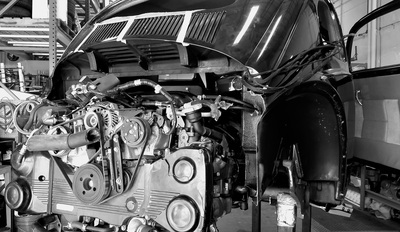 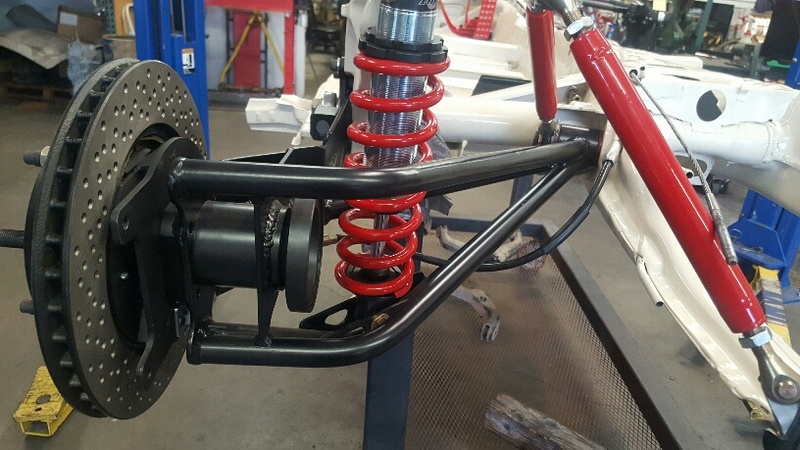 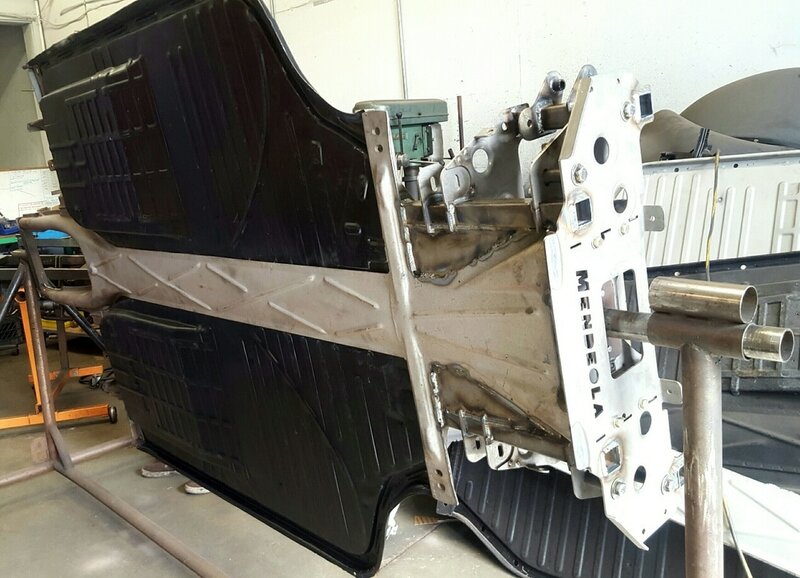 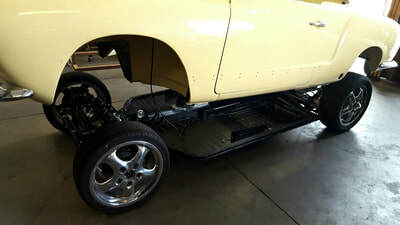 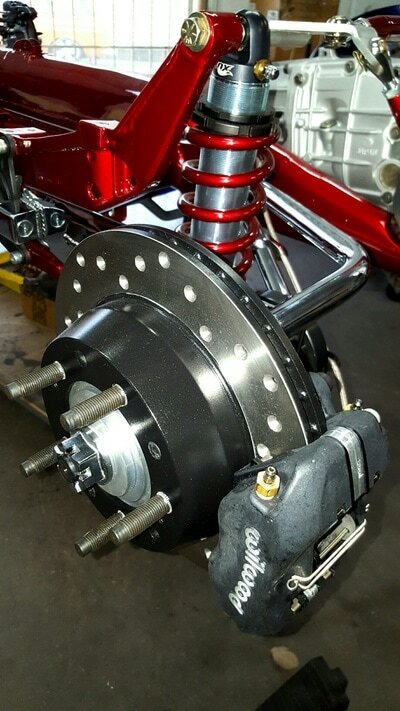 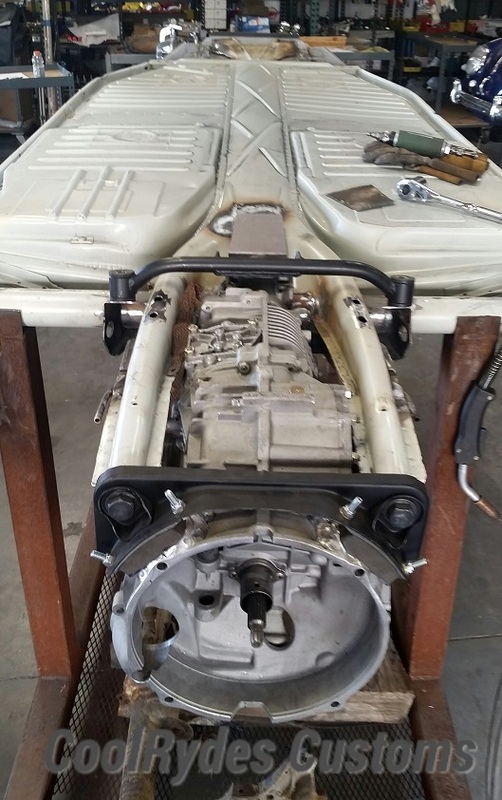 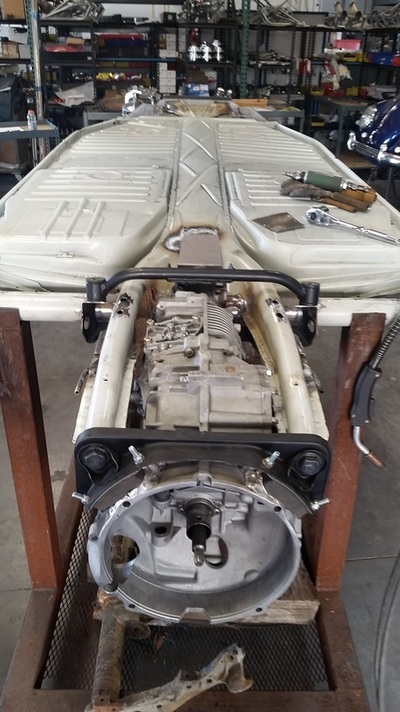 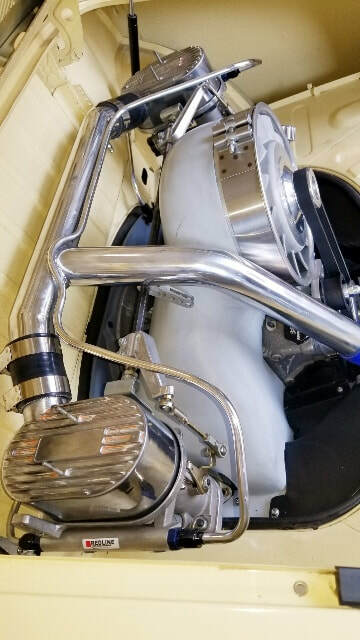 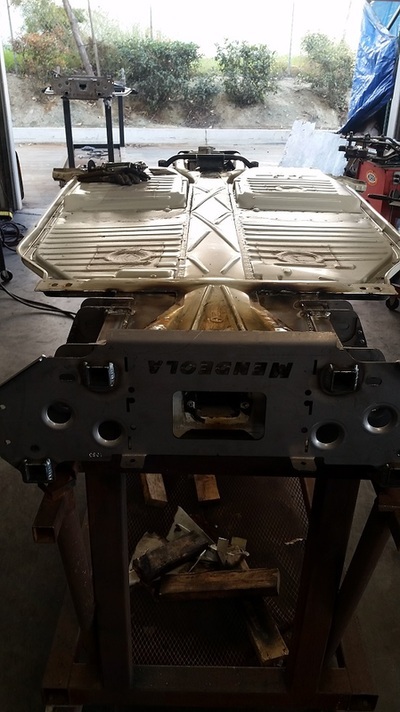 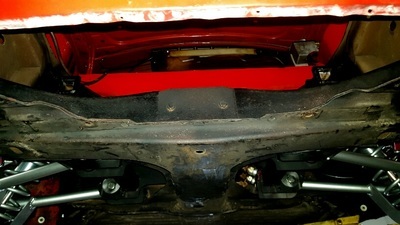 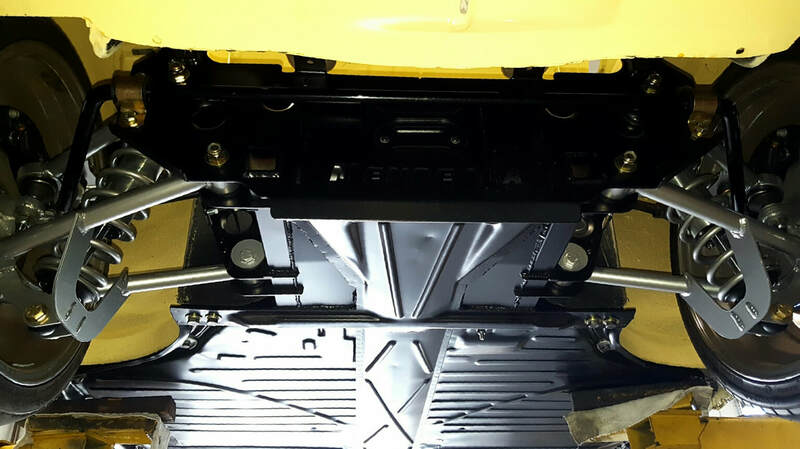 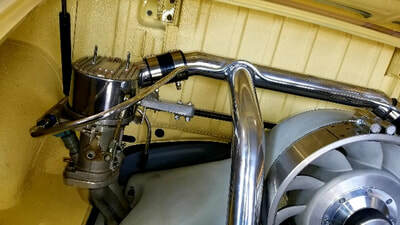 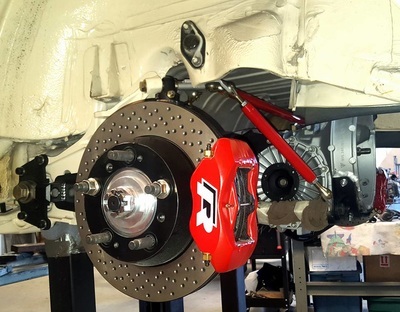 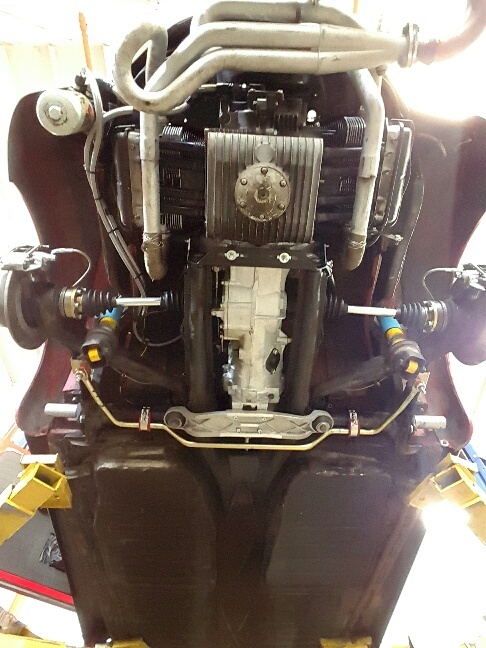 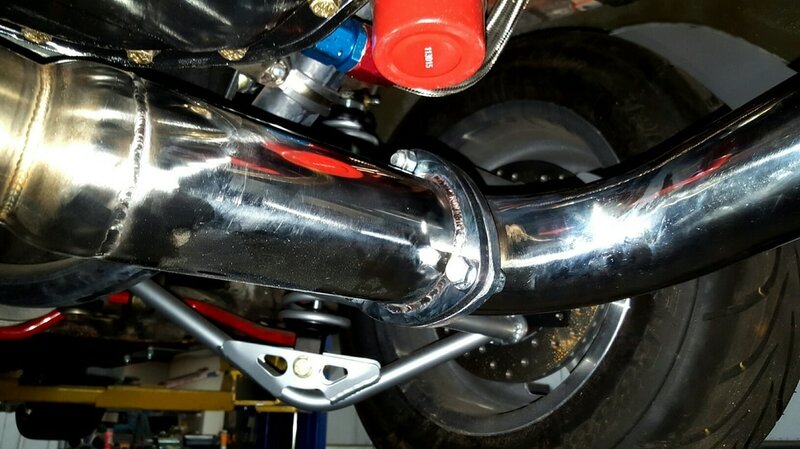 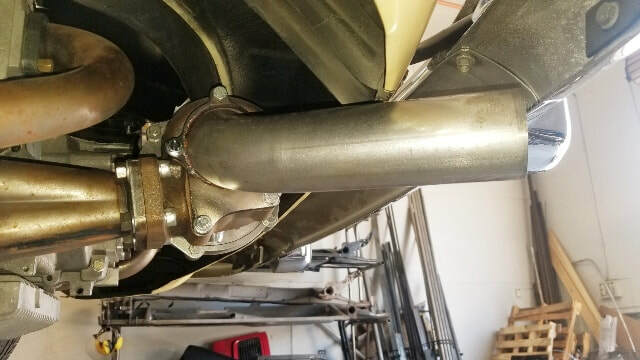 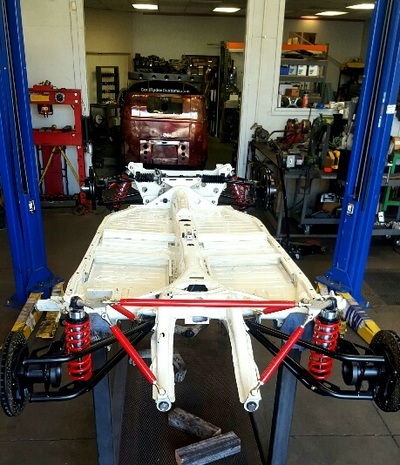 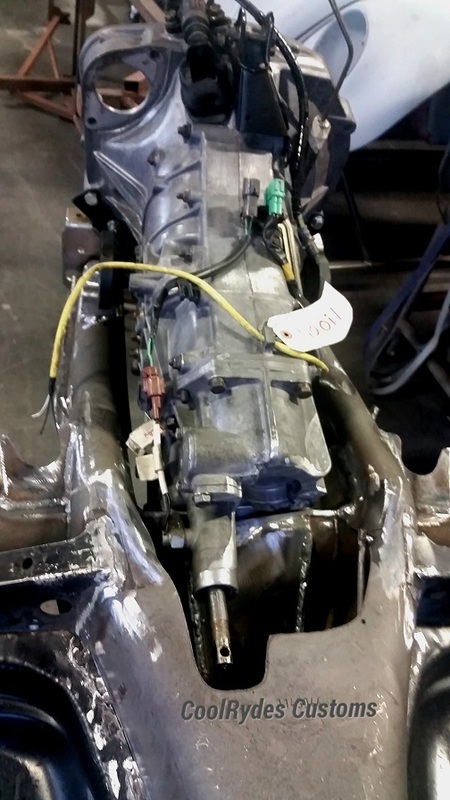 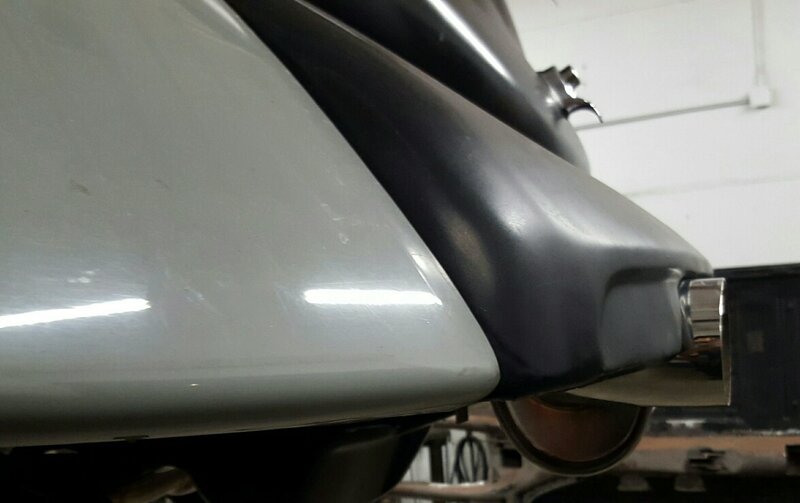 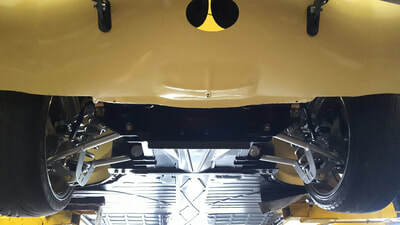 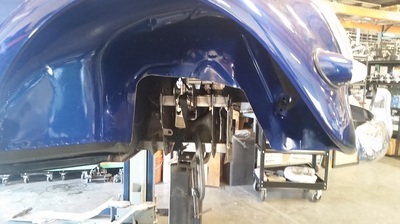 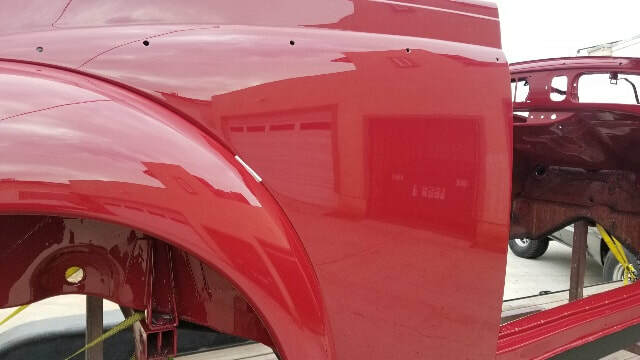 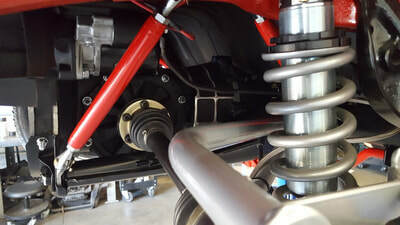 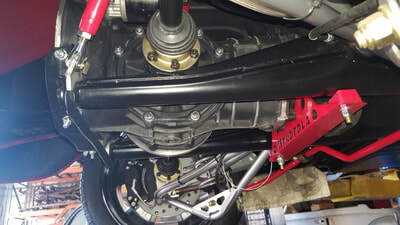 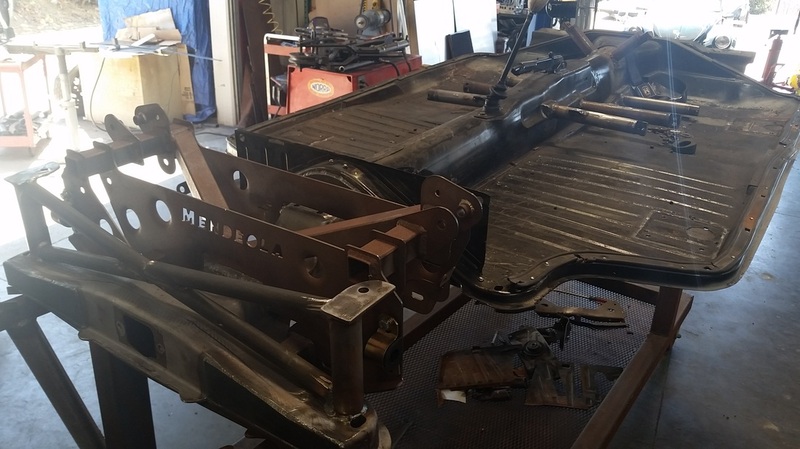 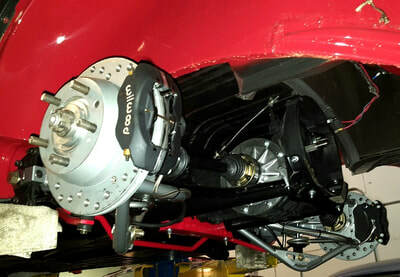 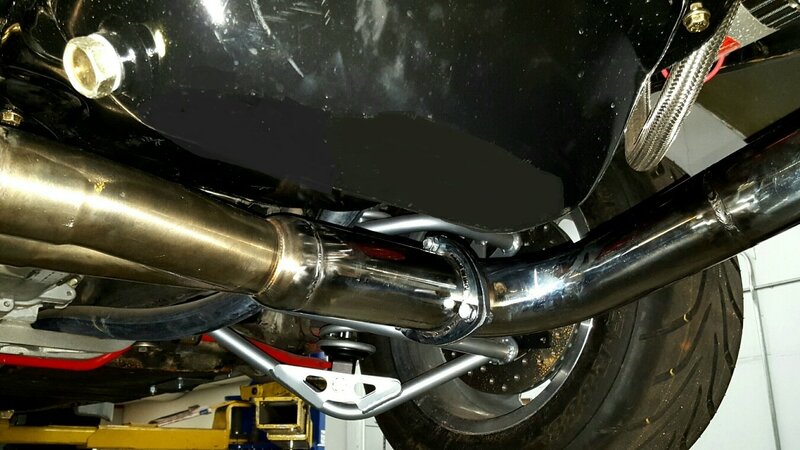 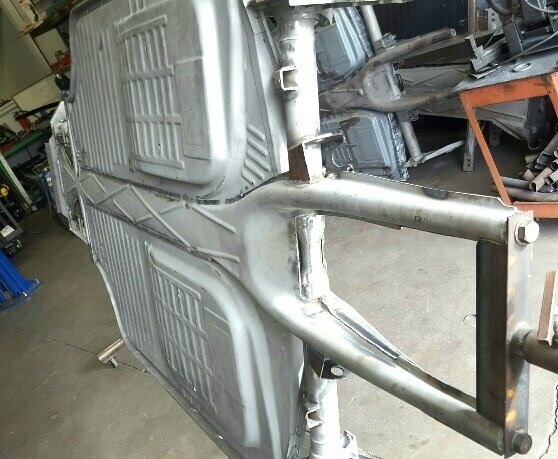 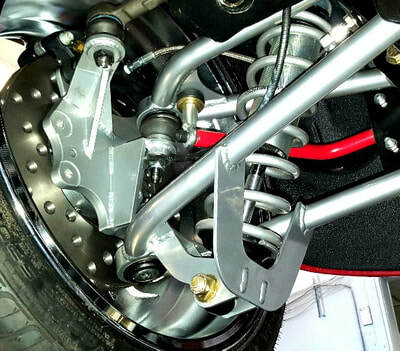 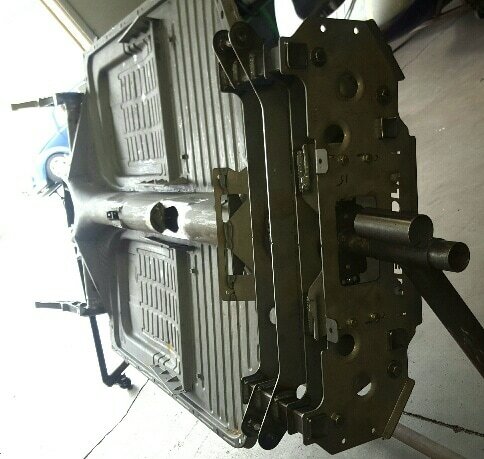 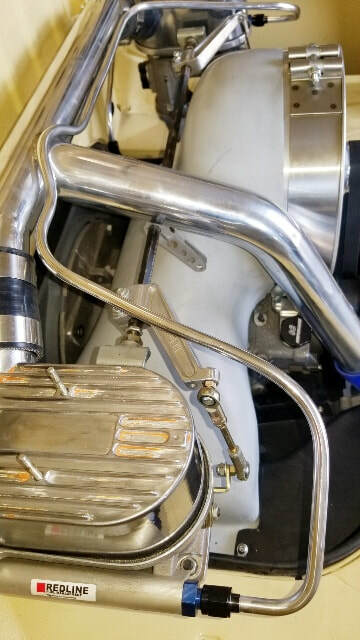 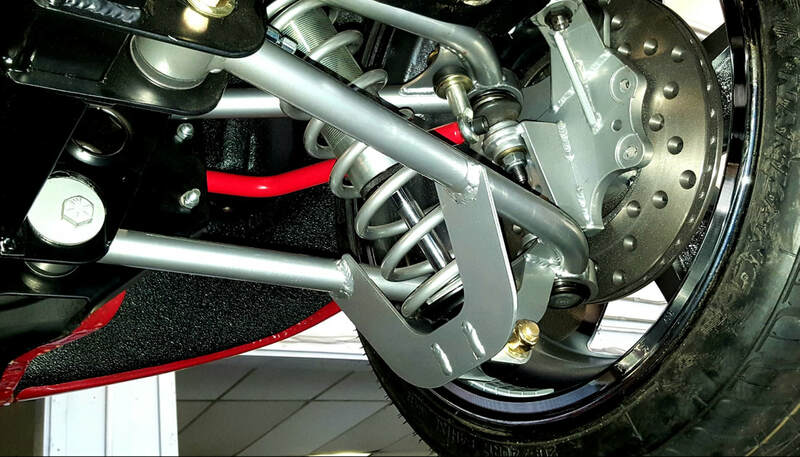 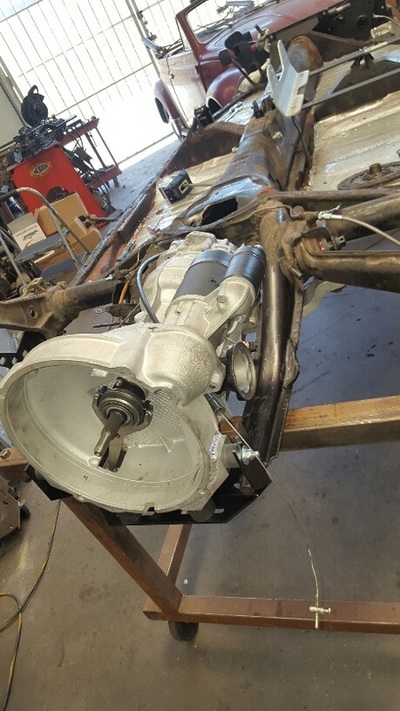 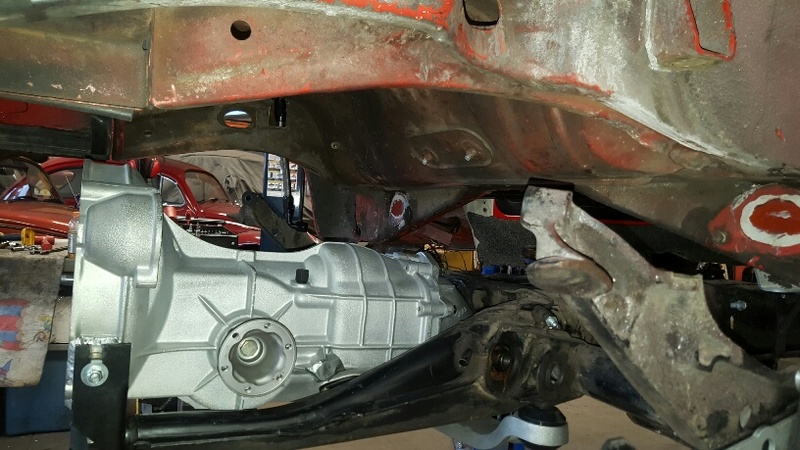 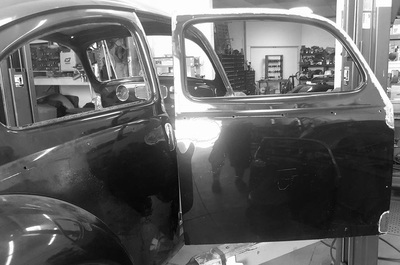 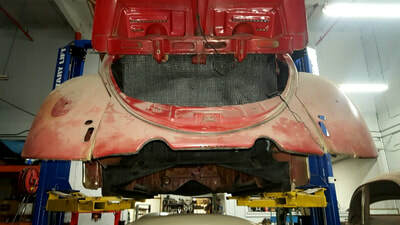 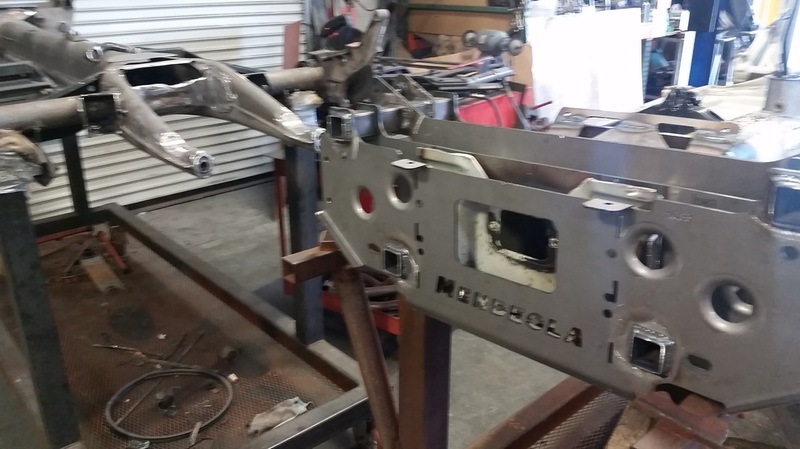 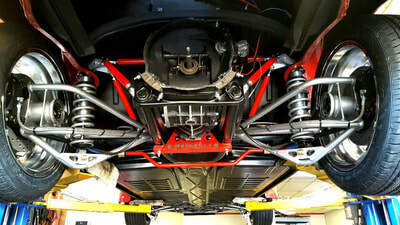 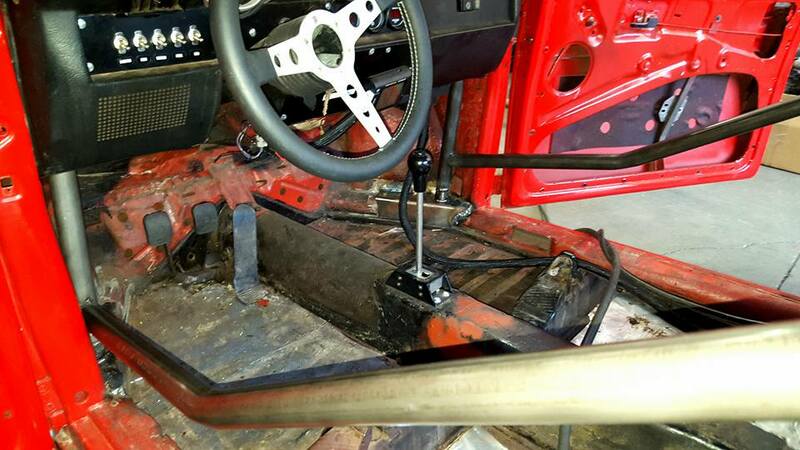 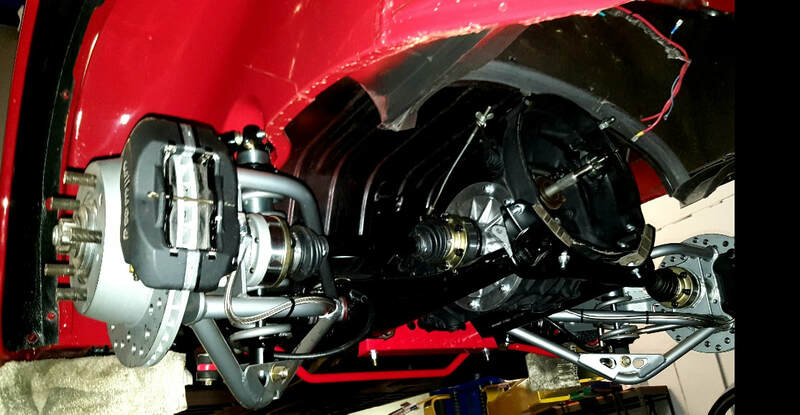 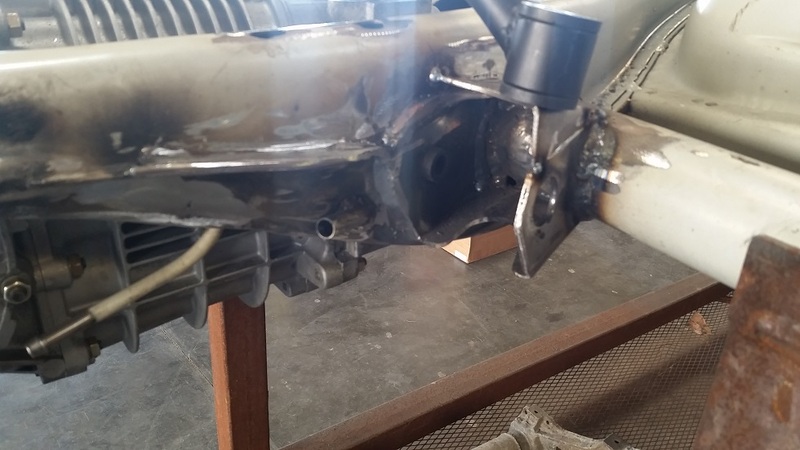 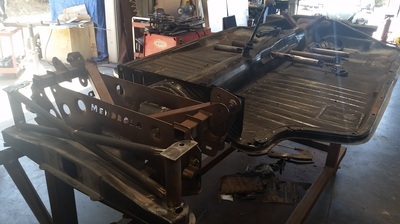 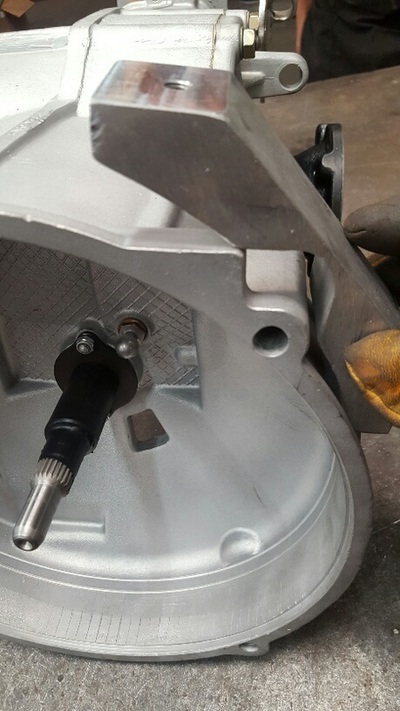 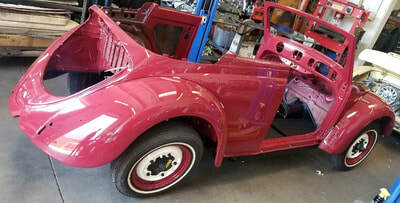 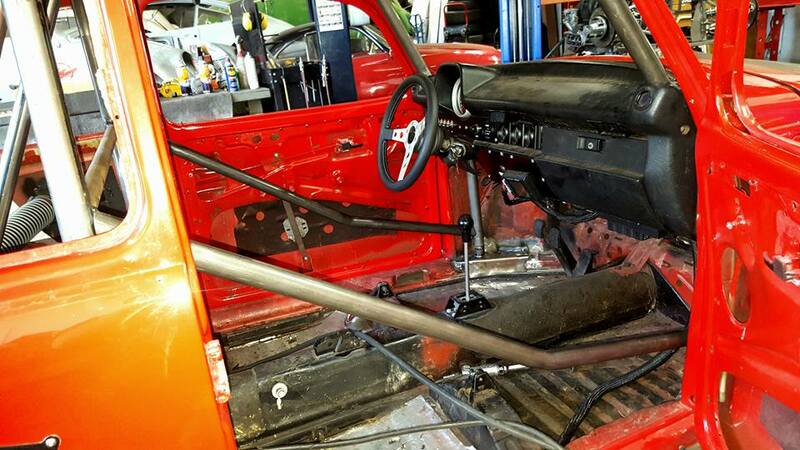 ​GOING TO BE TRANSFORMED USING A MENDEOLA CHASSIS FOR HANDLING, FOUR WHEEL COOLSTOP DISC BRAKES, A RANCHO PERFORMANCE PRO STREET TRANS, AND A NICELY BUILT 1.9L DUAL WEBER COOLRYDES BUILT AND DETAILED POWER PLANT. DIAMOND IN THE ROUGH IS AN UNDERSTATEMENT WHEN IT COMES TO THIS BUILD. 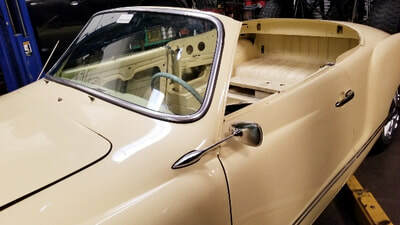 UPON ORIGINAL INSPECTION WE FELT THE CLIENT HAD A PRETTY SOILD GHIA CONVERTIBLE (WHICH IS AS HARD TO FIND AS A UNICORN). 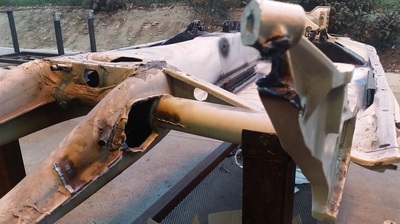 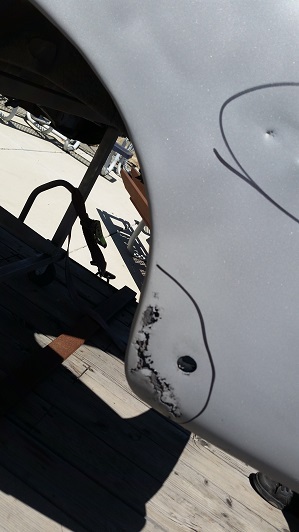 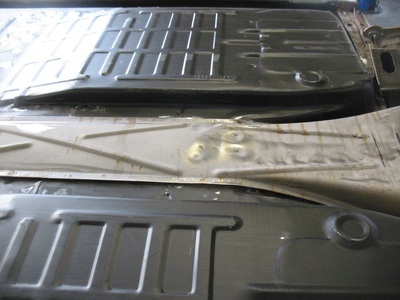 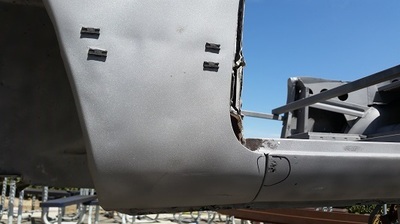 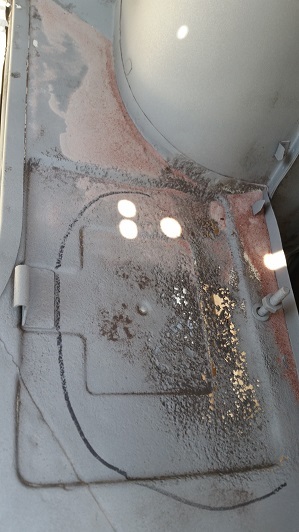 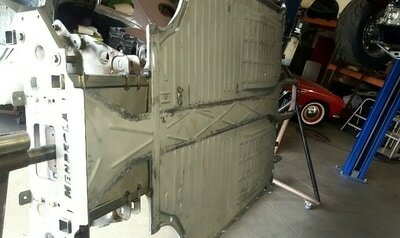 AFTER DISSASEMBLY AND MEDIA BLASTING THE BODY CLEAN WE FOUND WE HAD FAR LESS METAL THEN WE HAD THOUGHT. 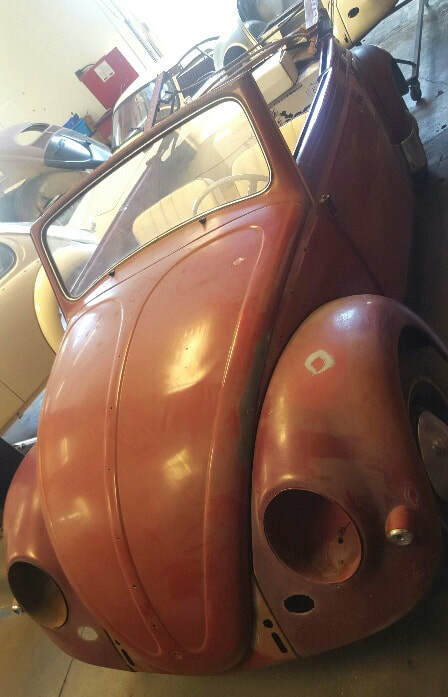 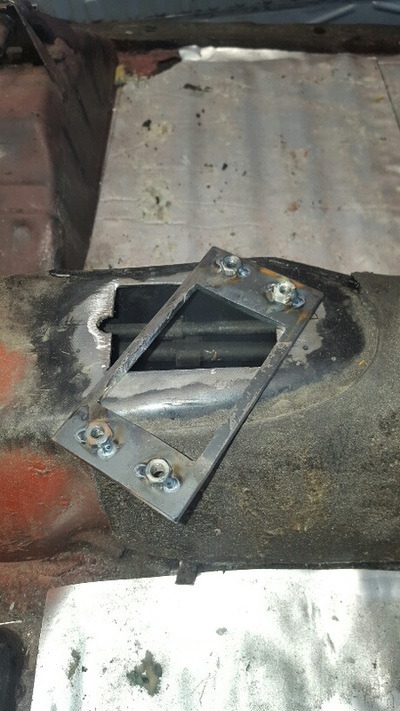 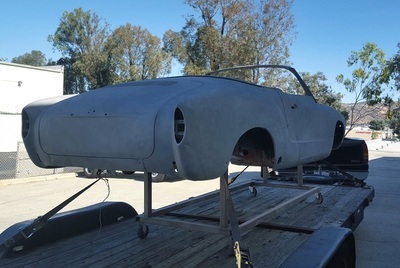 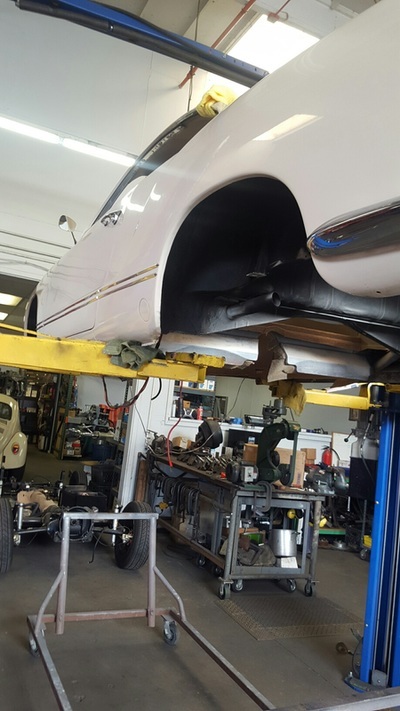 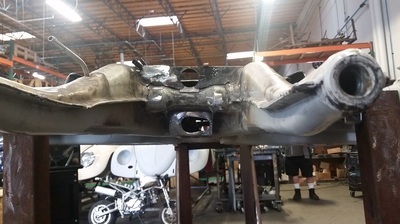 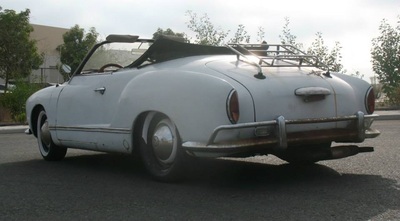 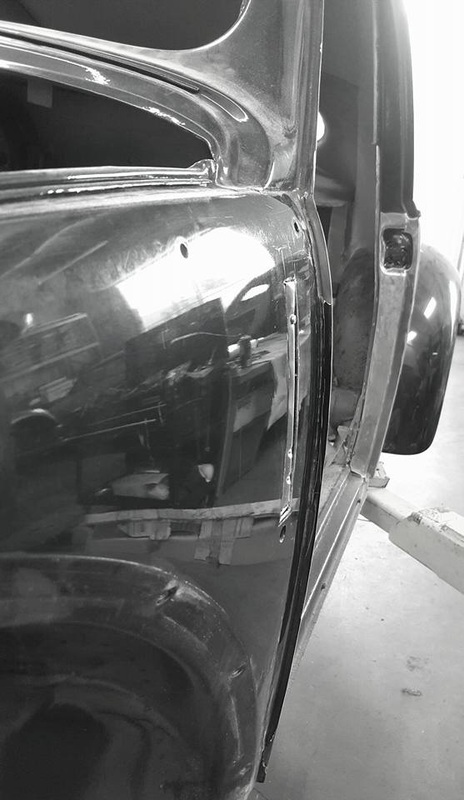 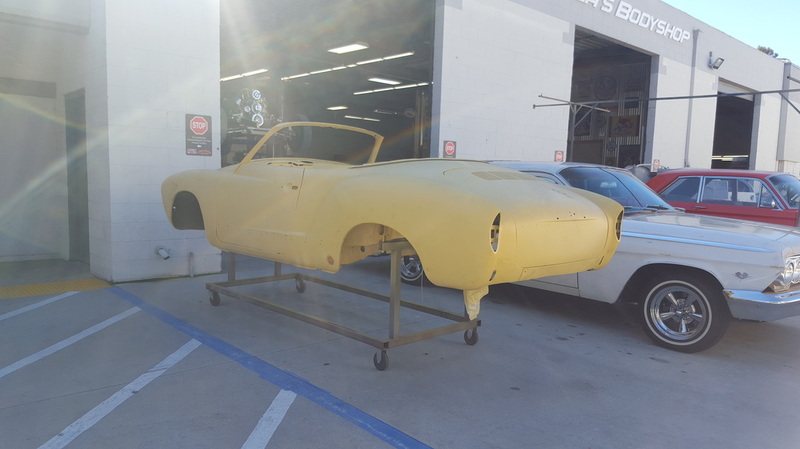 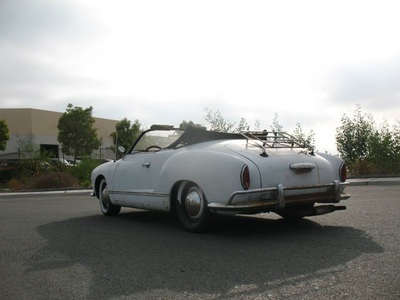 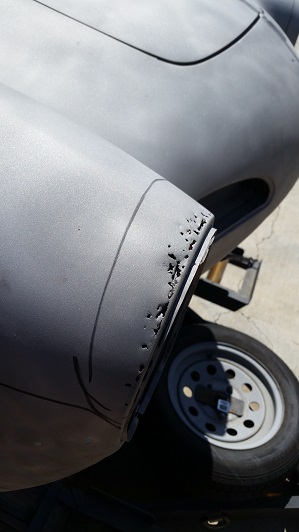 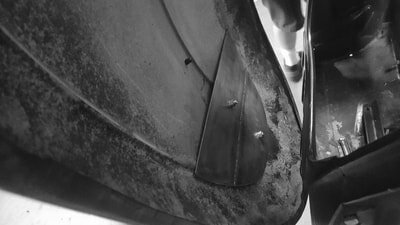 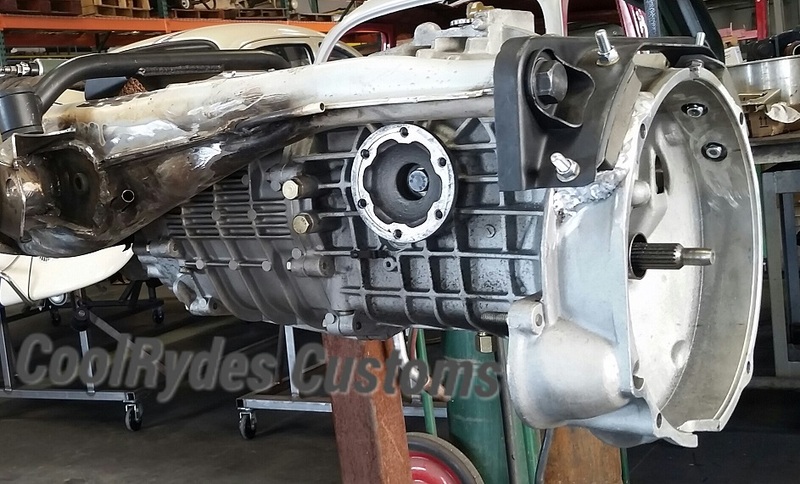 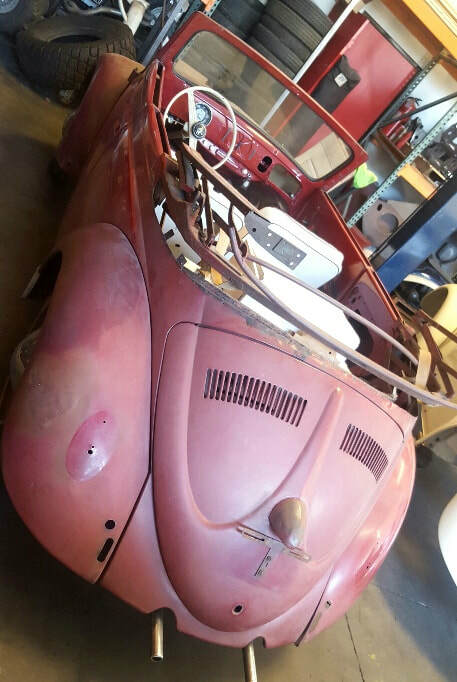 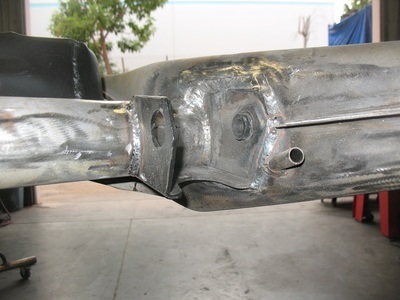 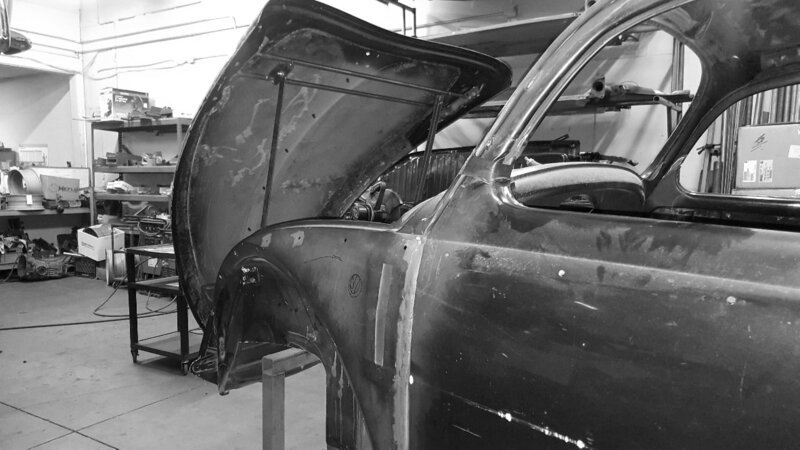 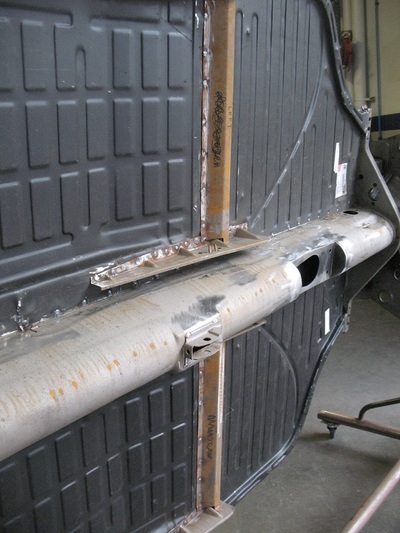 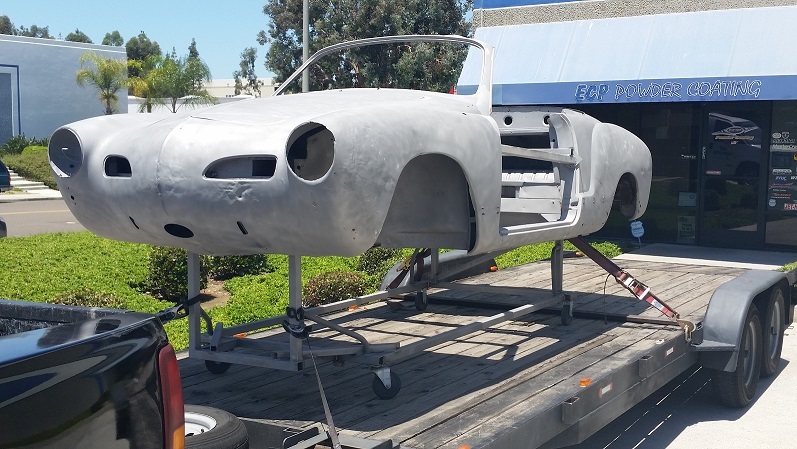 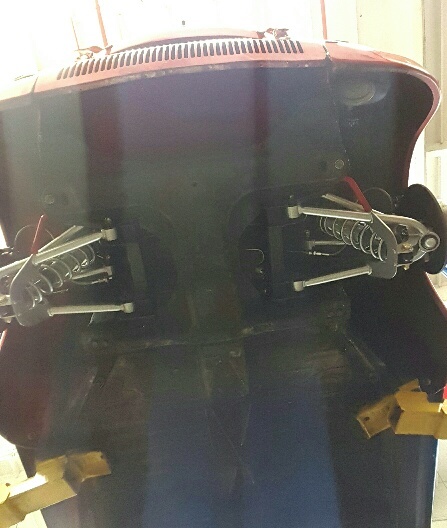 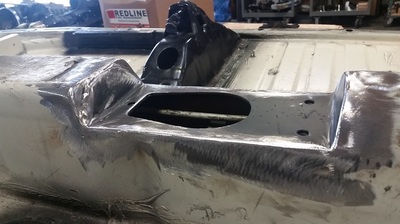 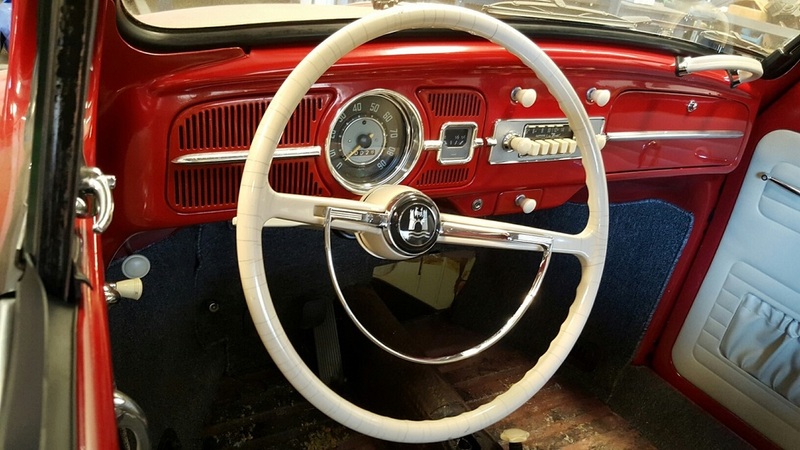 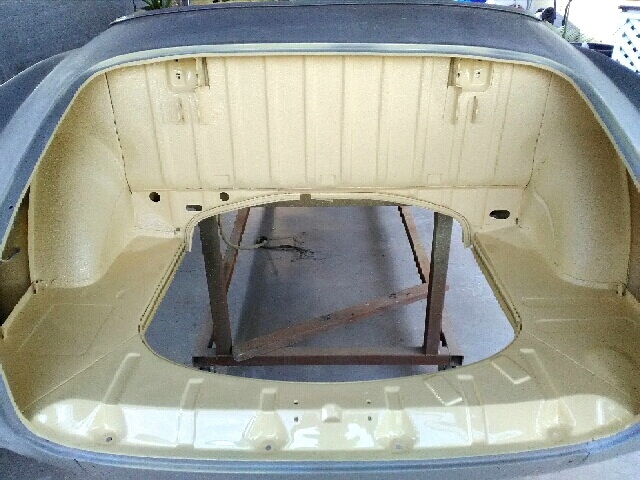 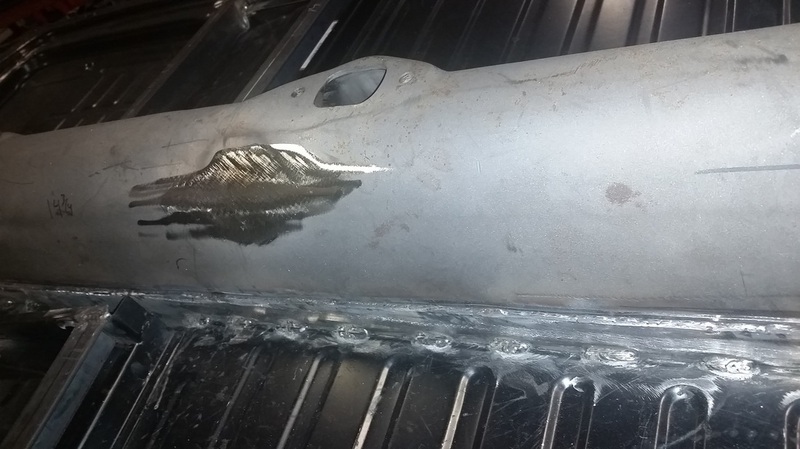 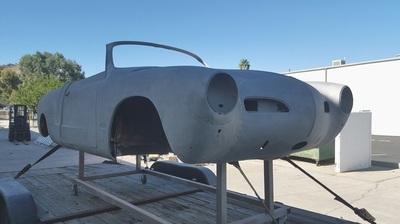 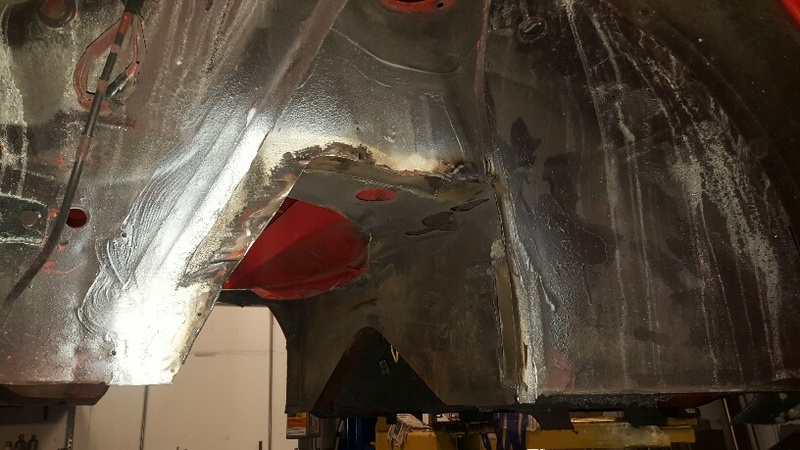 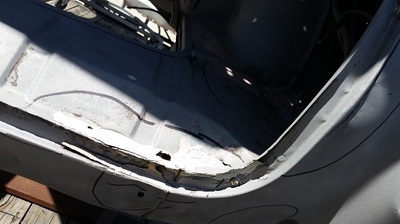 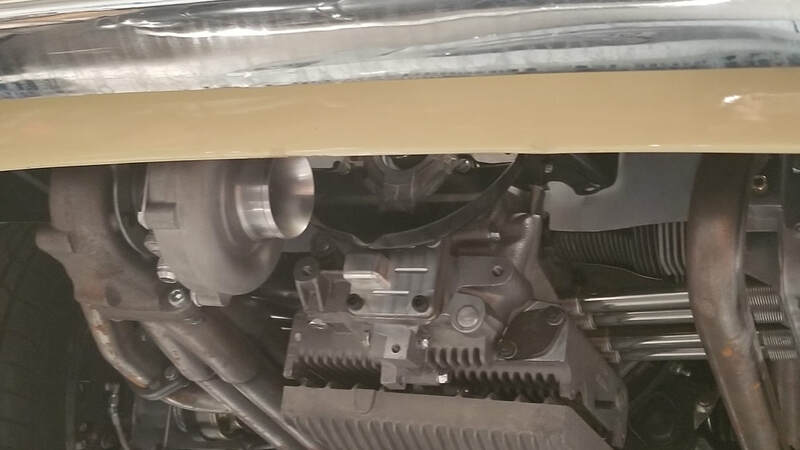 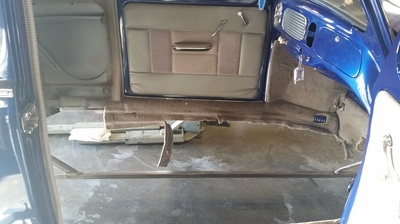 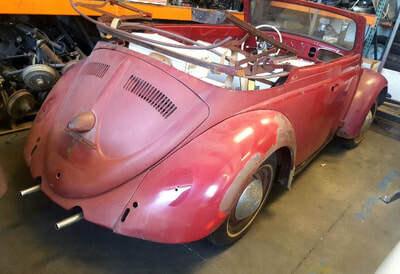 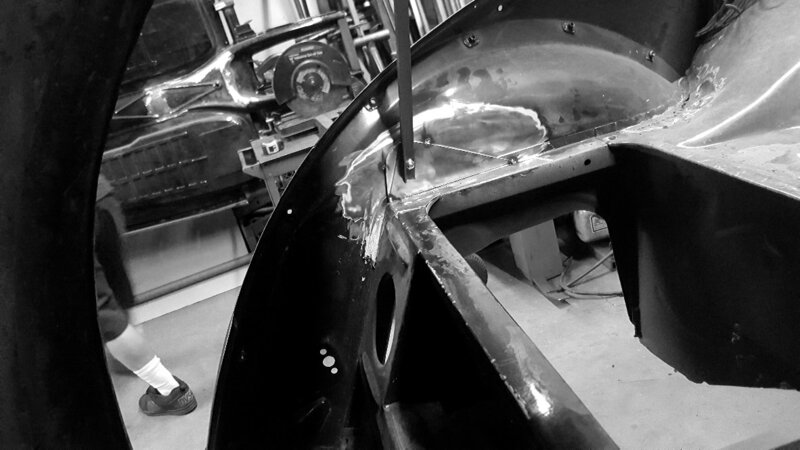 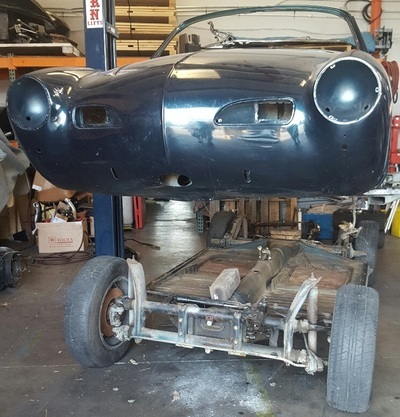 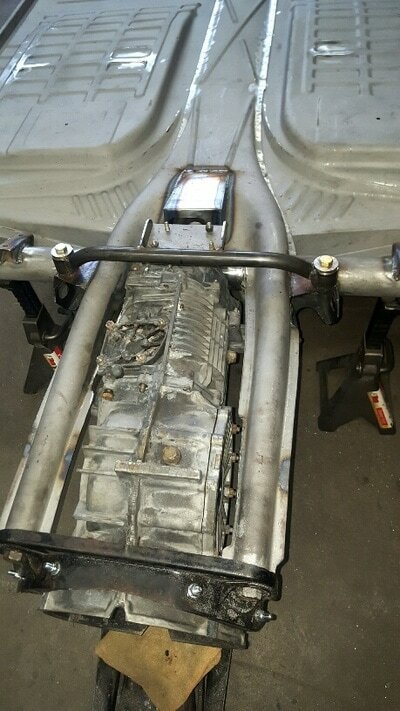 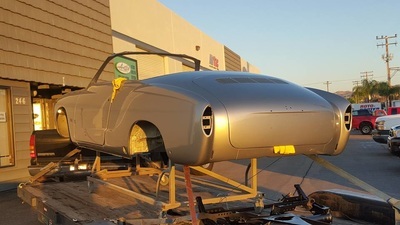 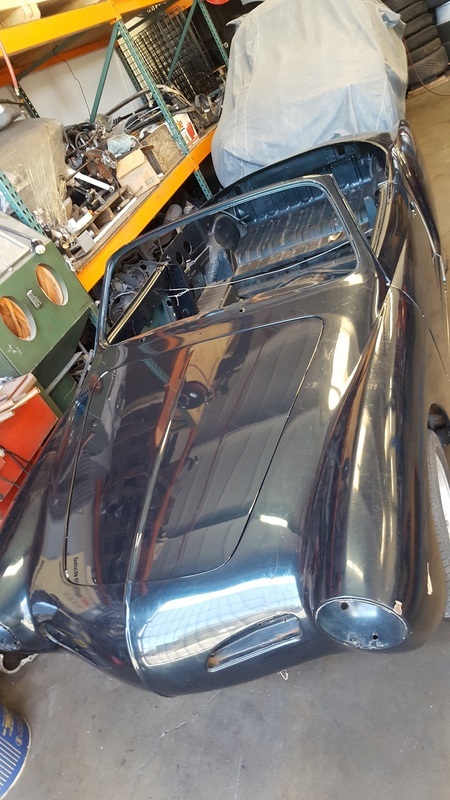 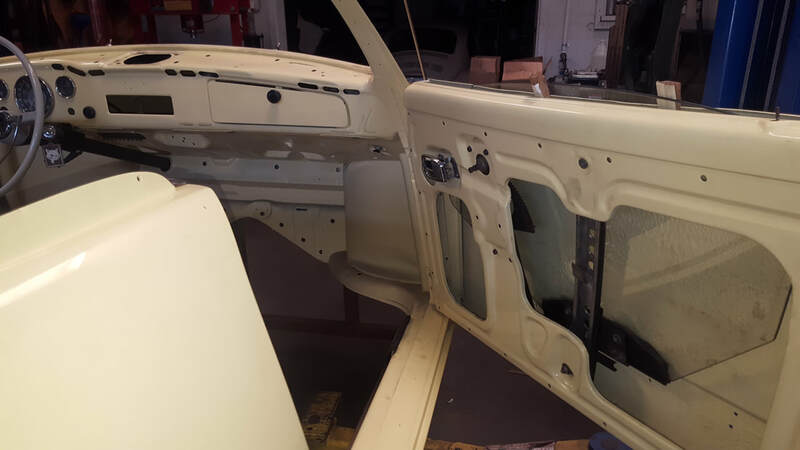 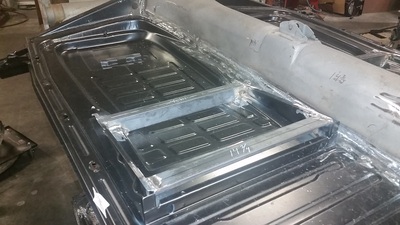 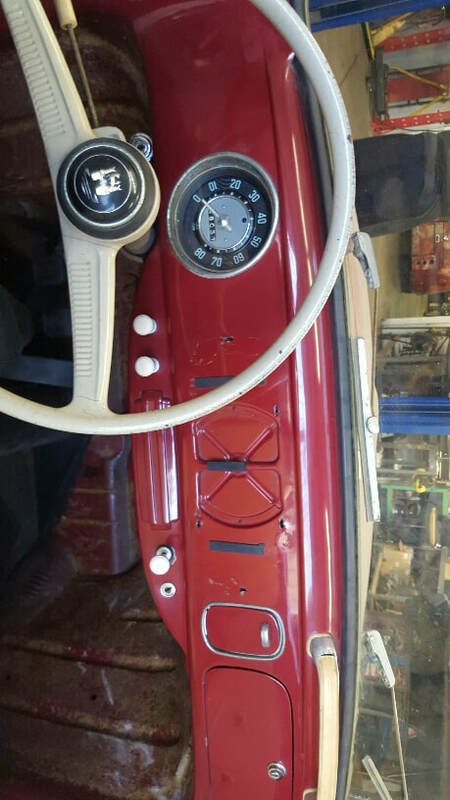 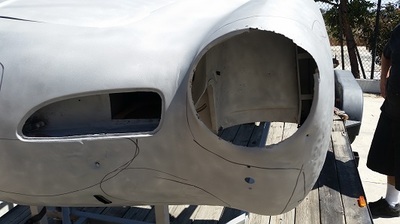 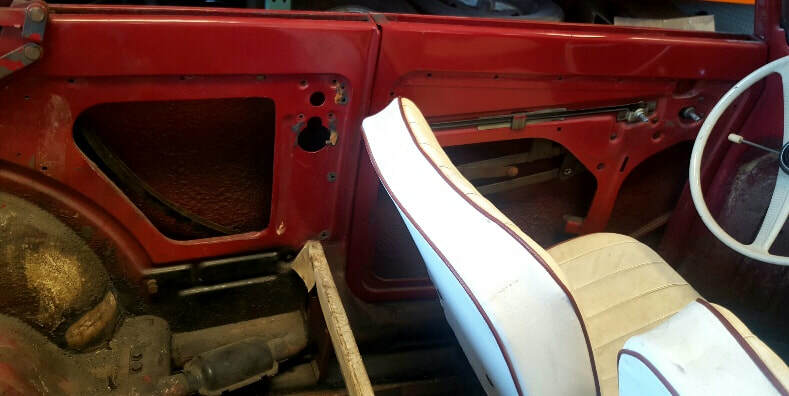 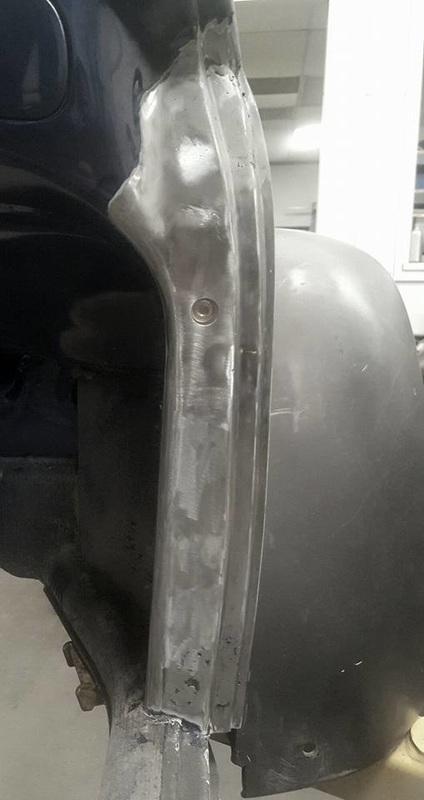 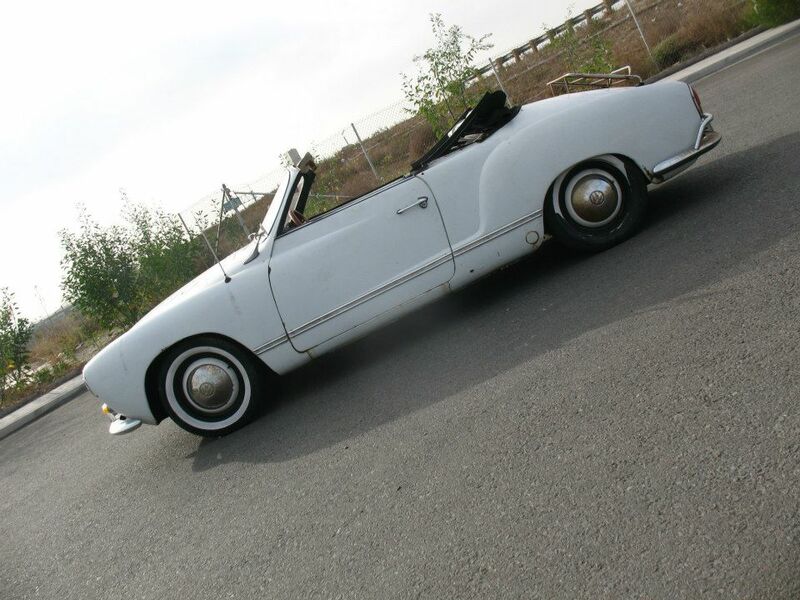 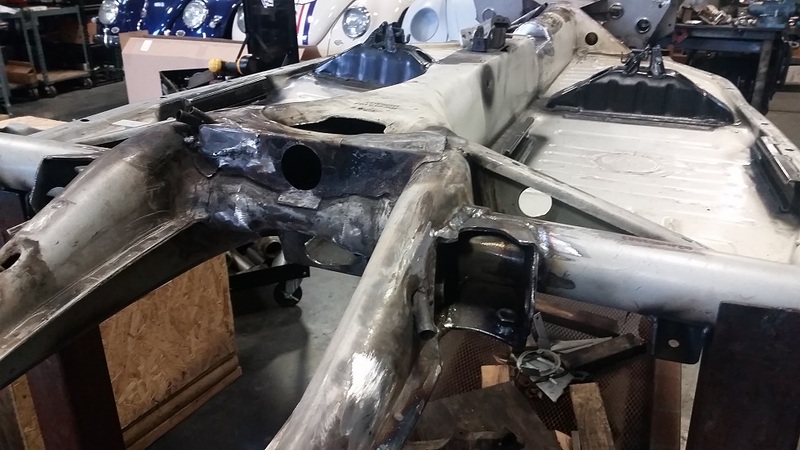 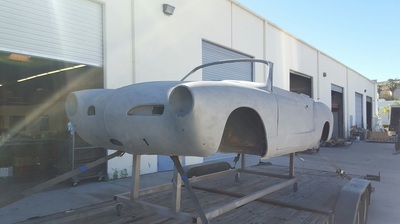 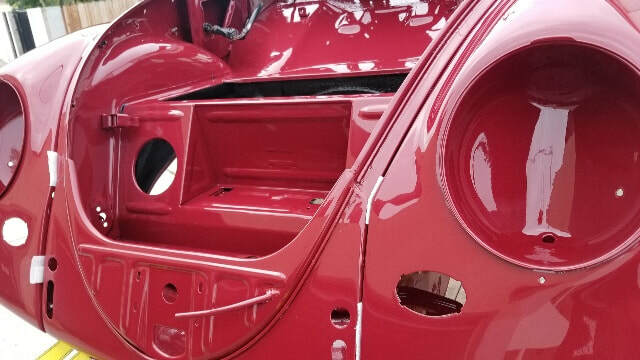 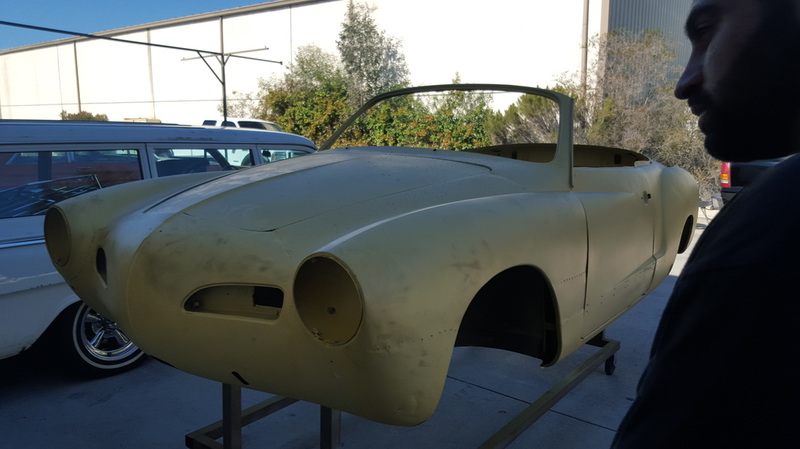 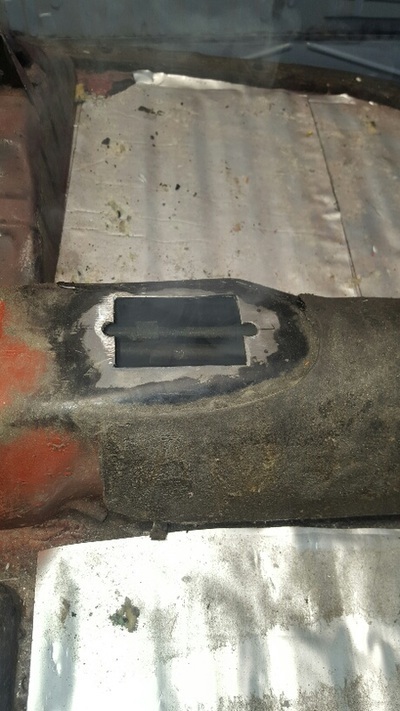 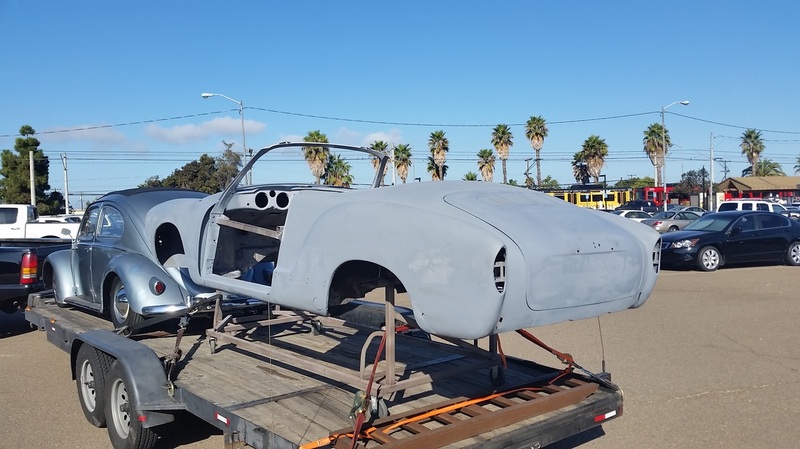 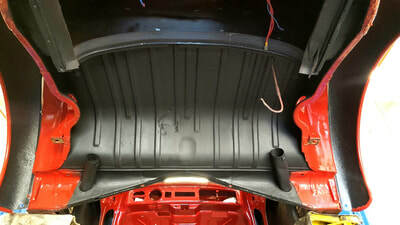 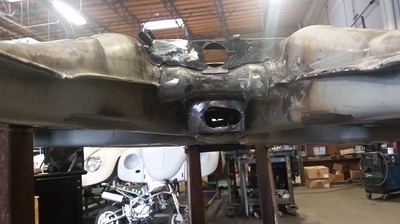 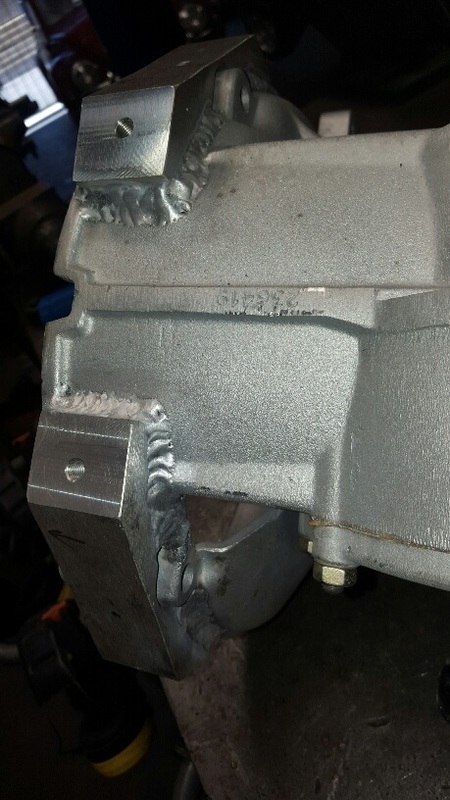 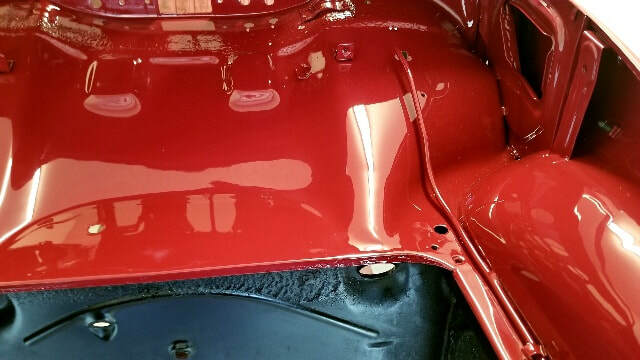 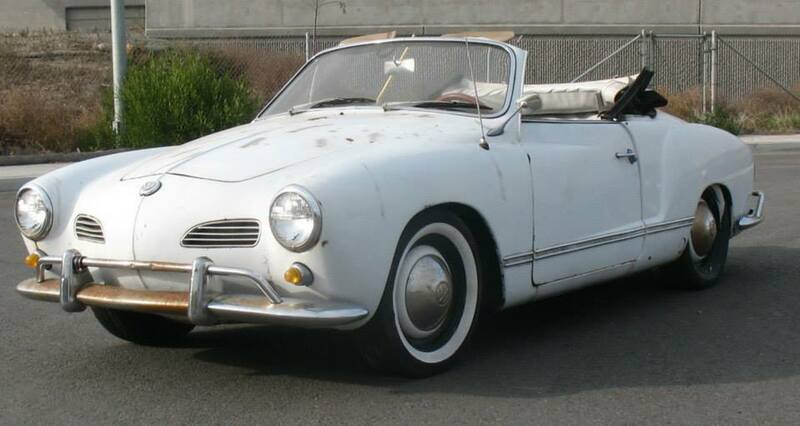 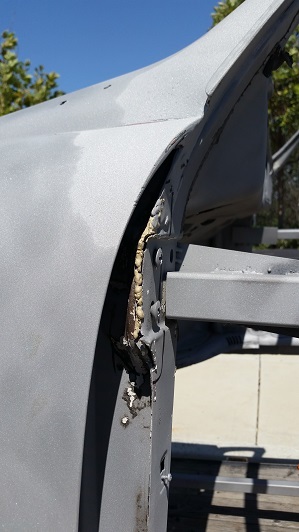 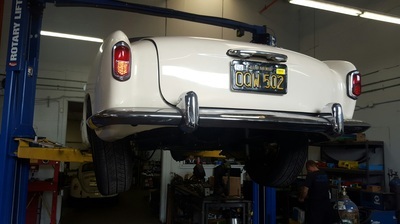 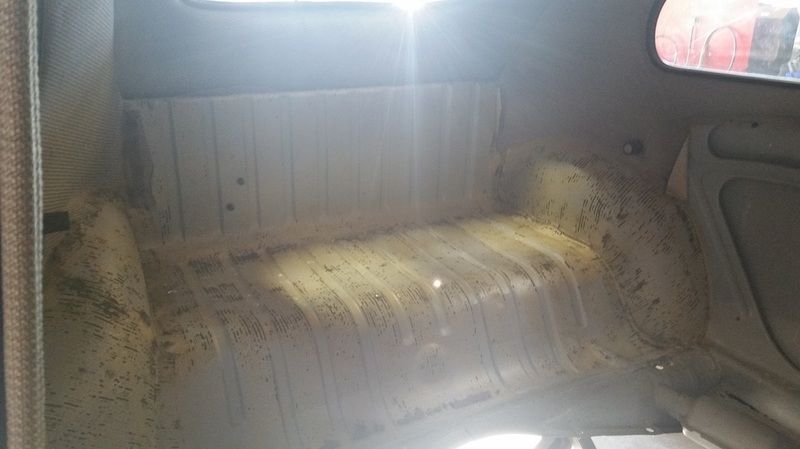 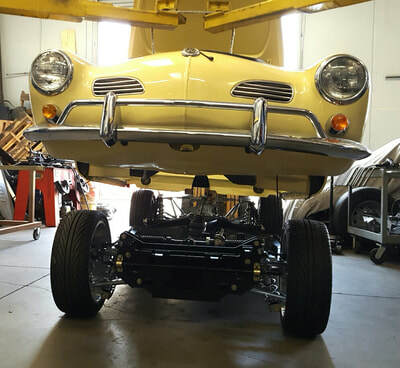 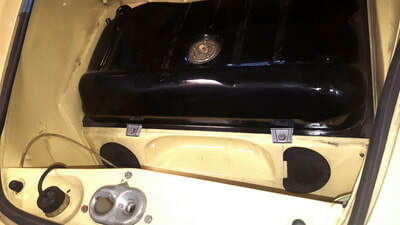 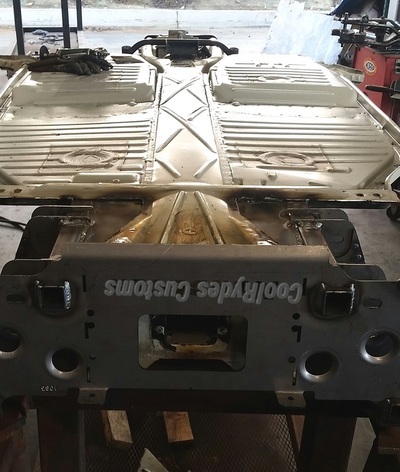 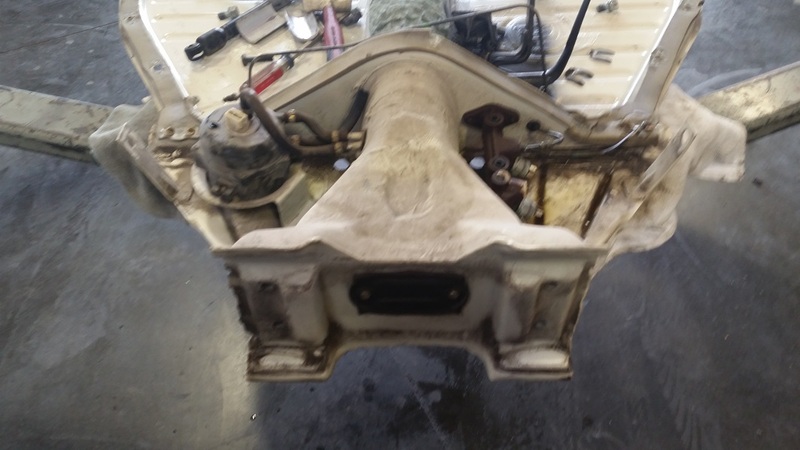 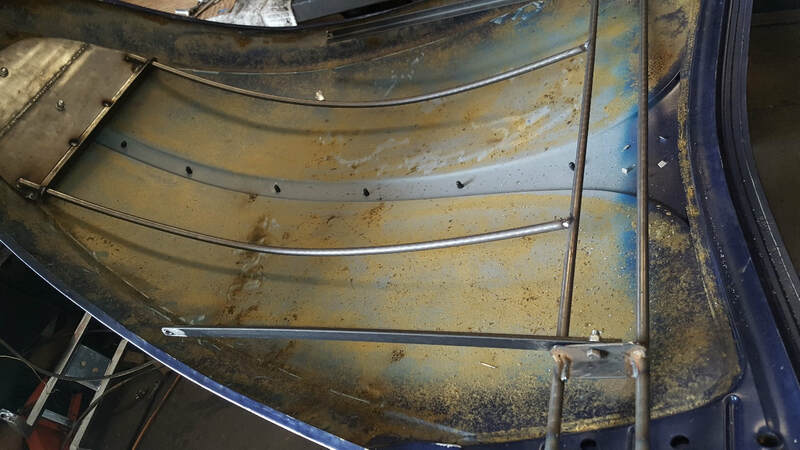 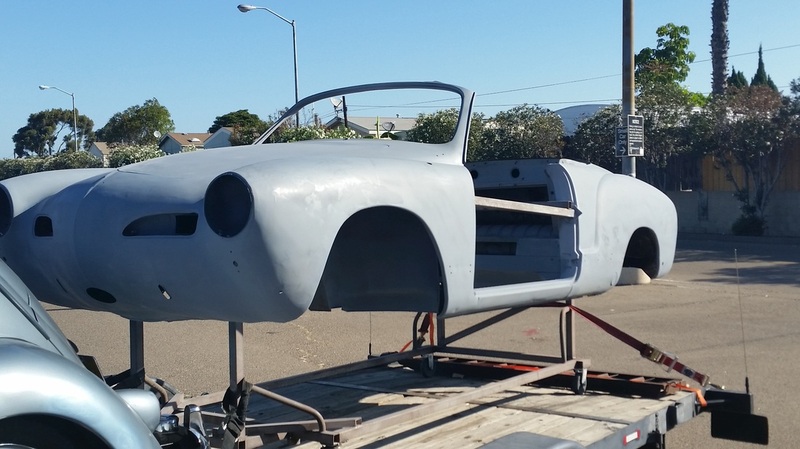 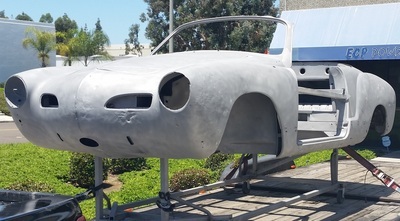 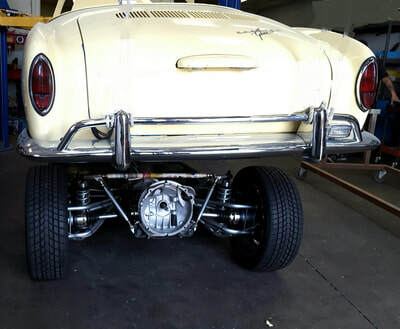 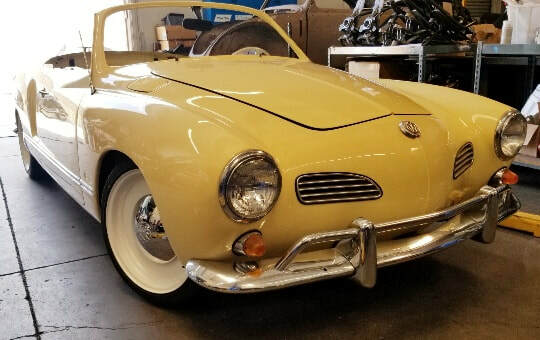 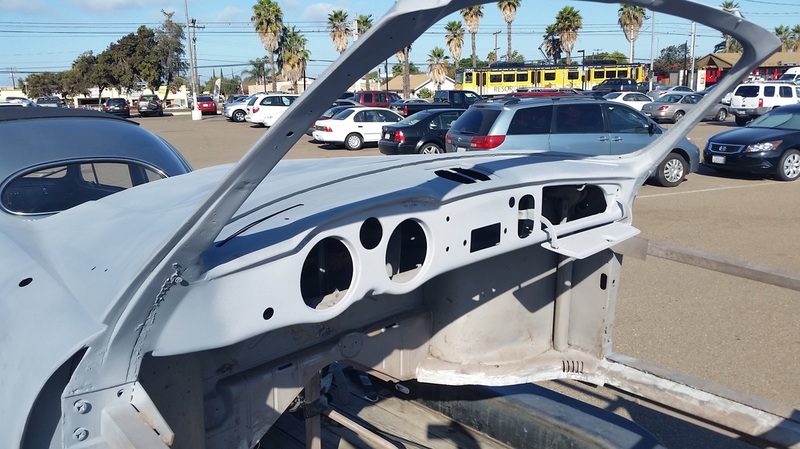 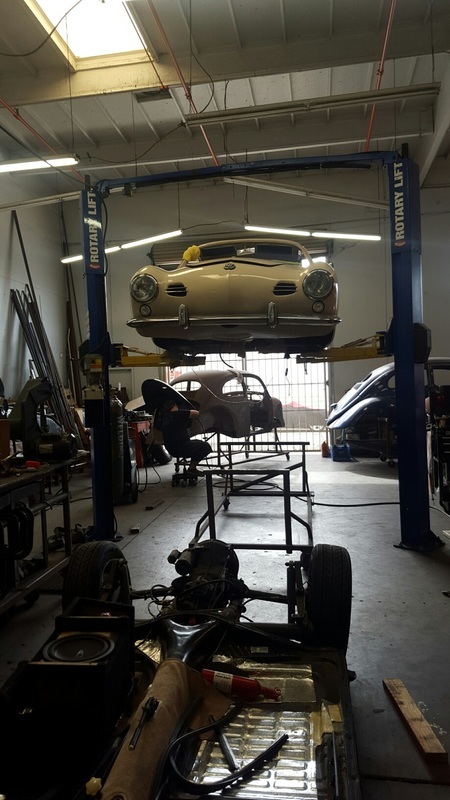 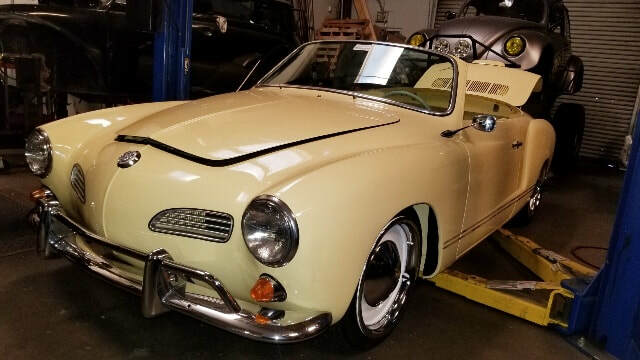 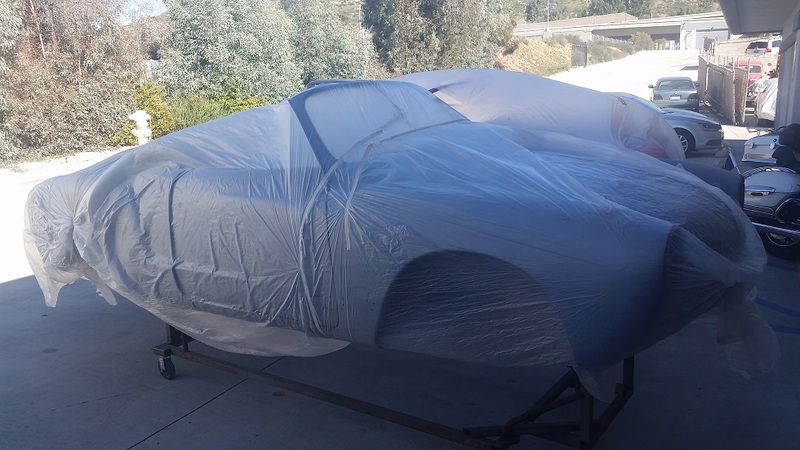 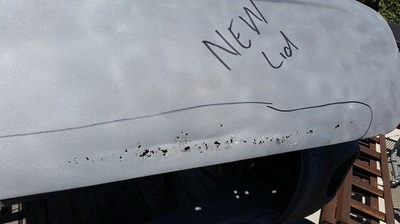 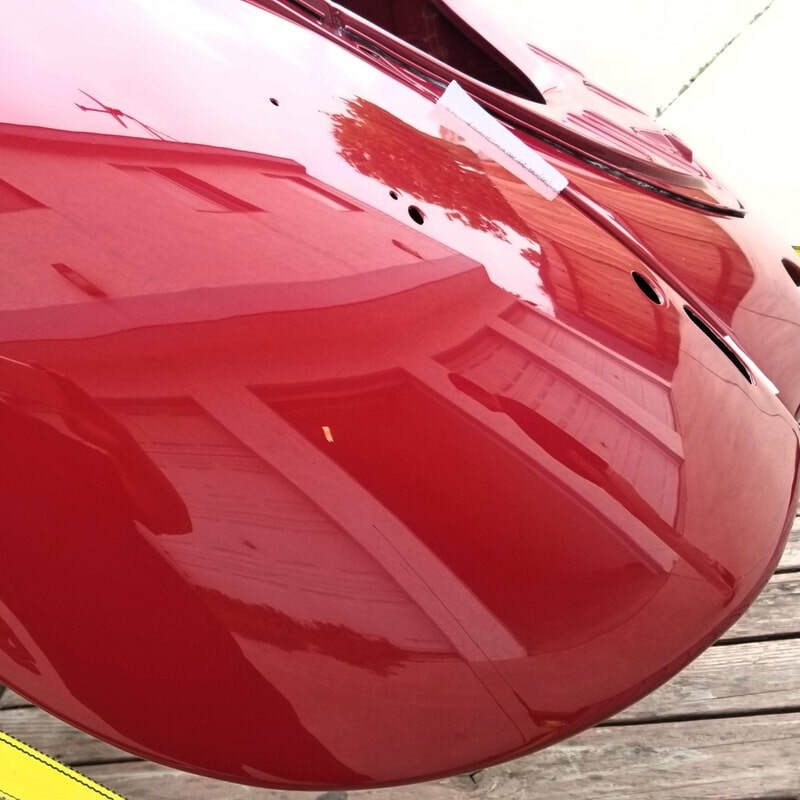 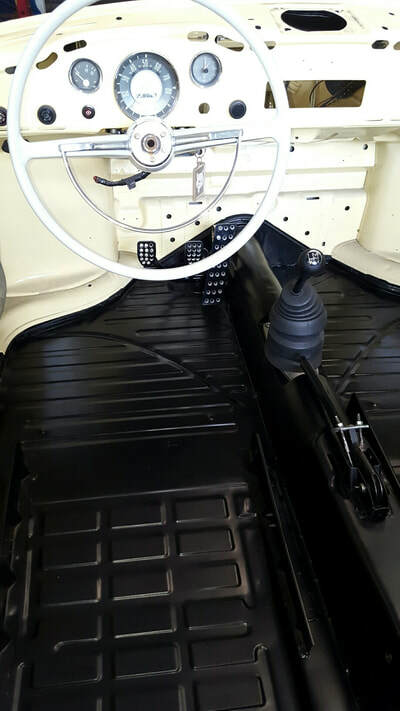 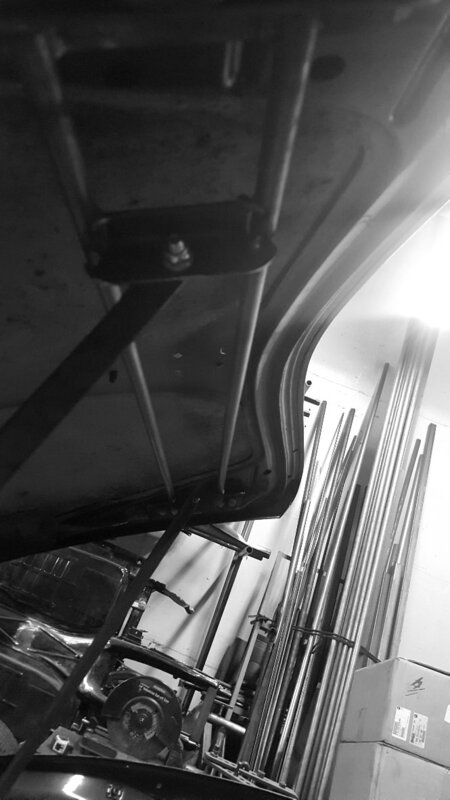 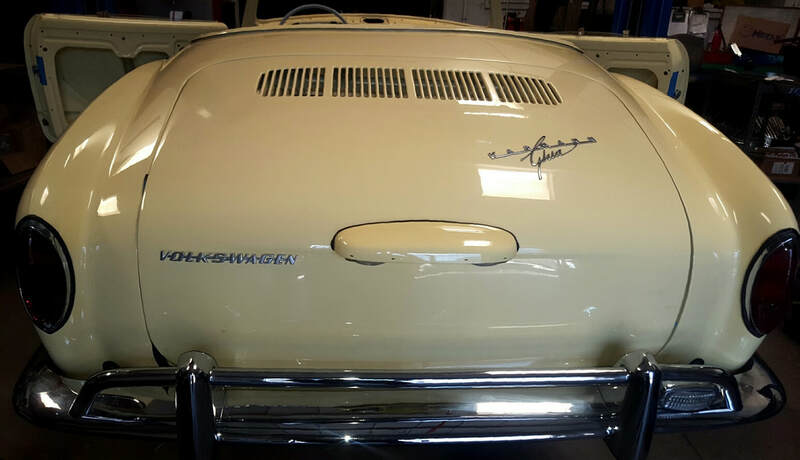 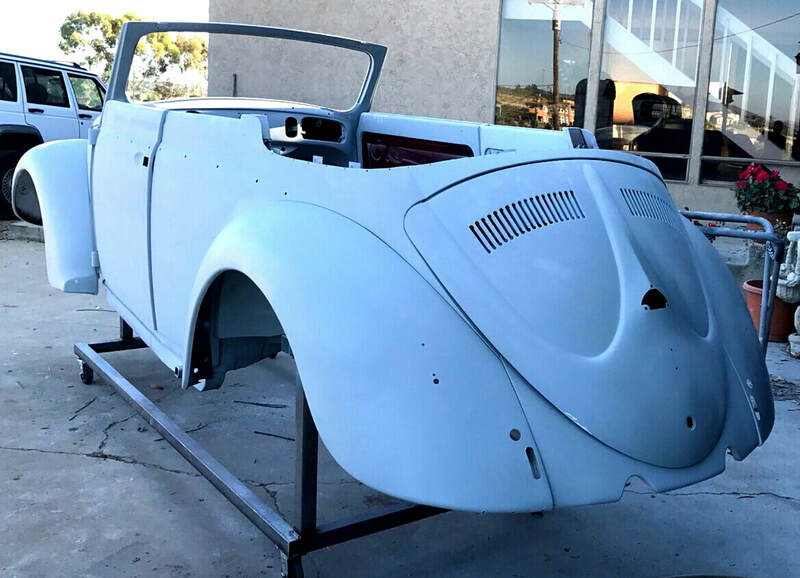 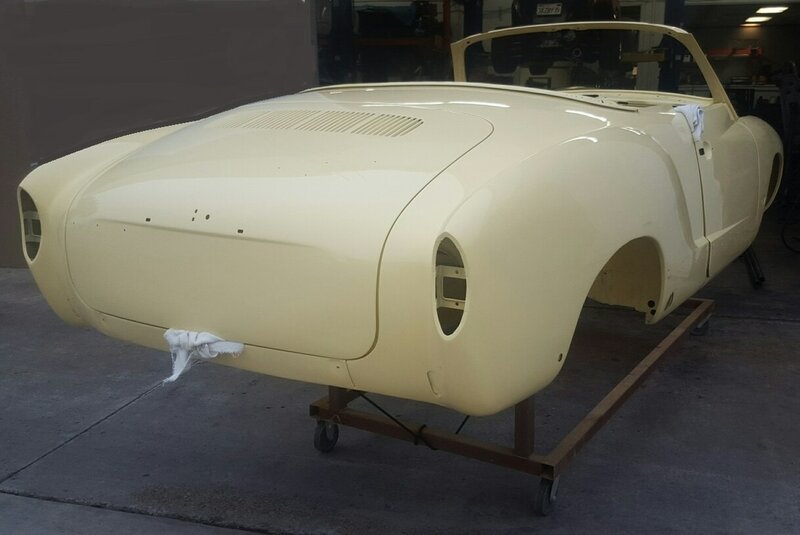 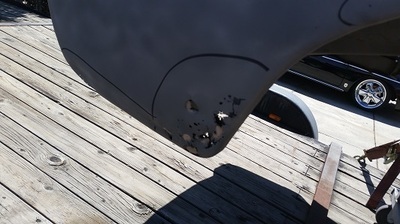 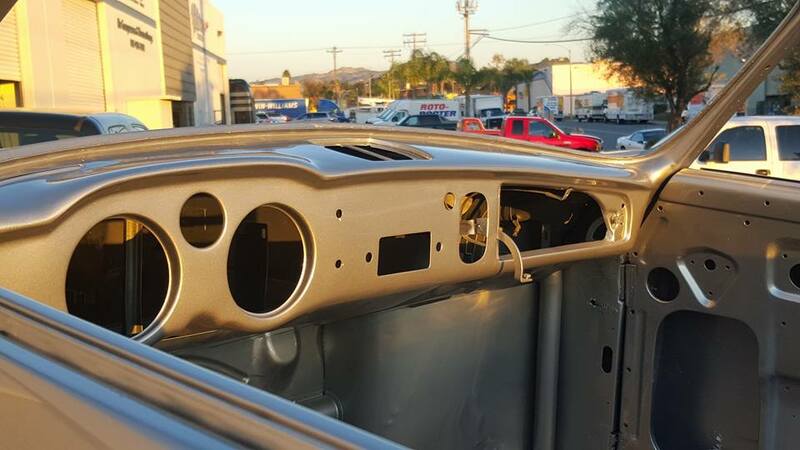 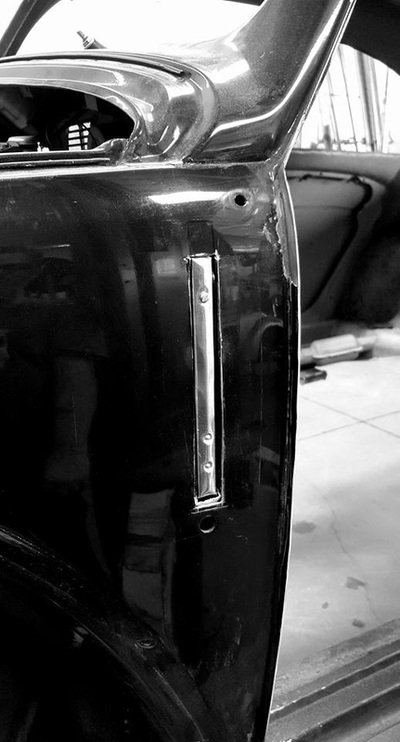 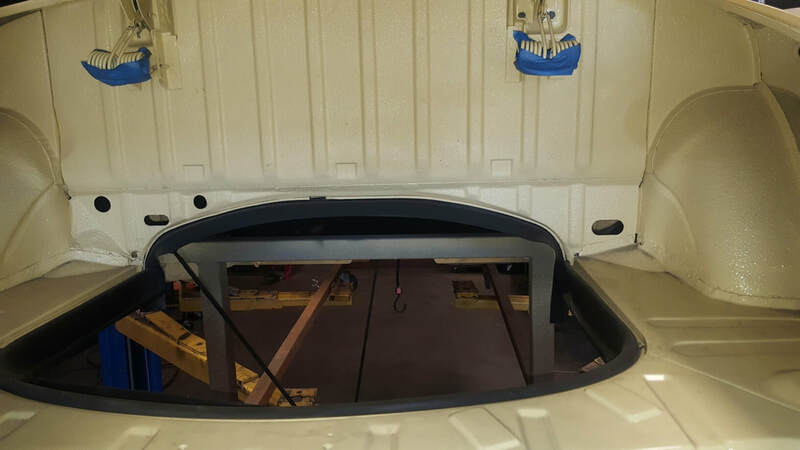 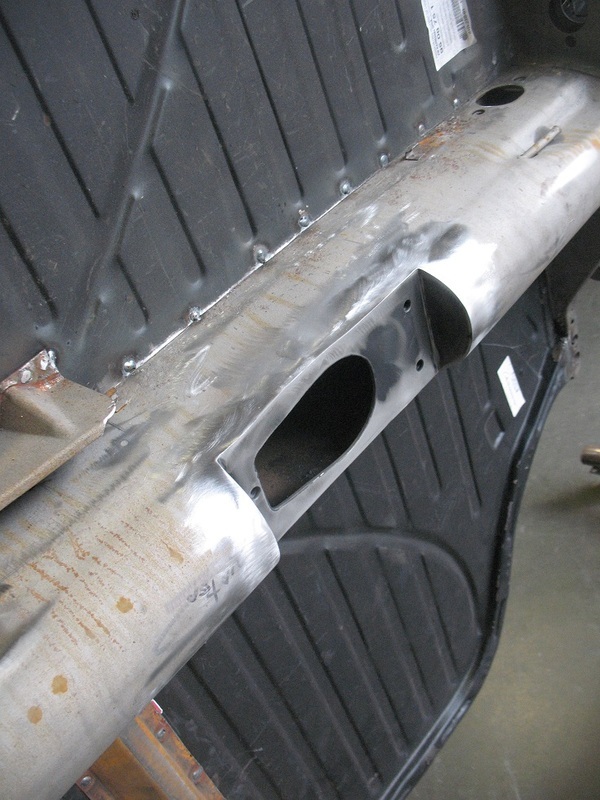 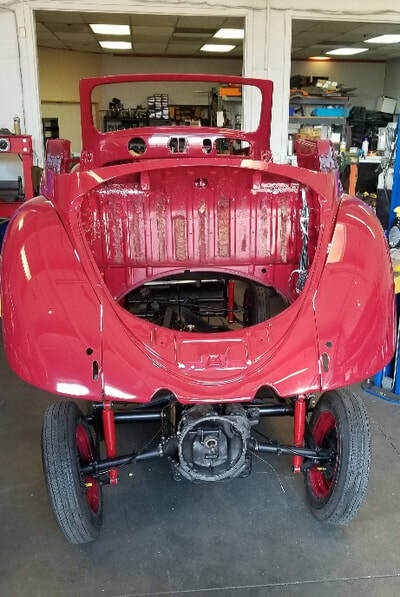 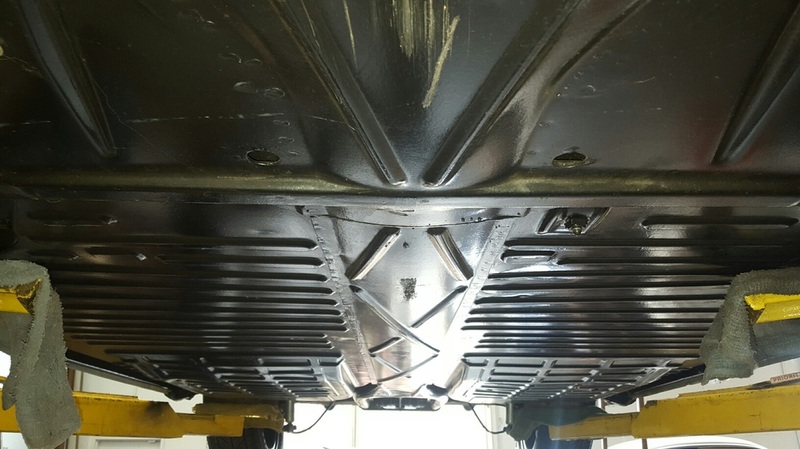 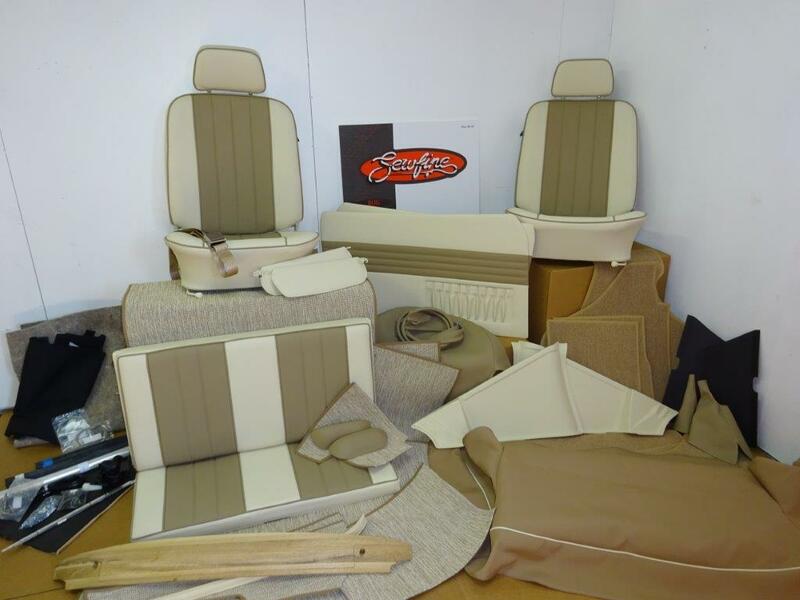 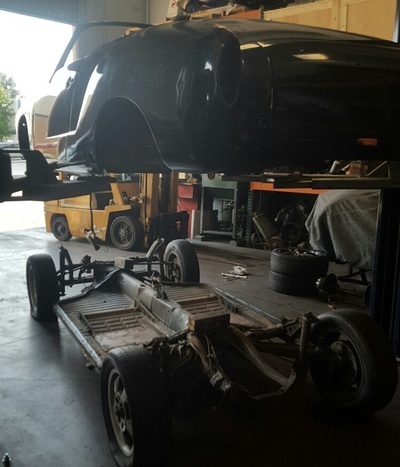 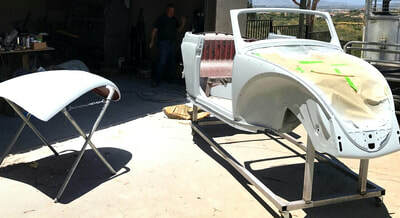 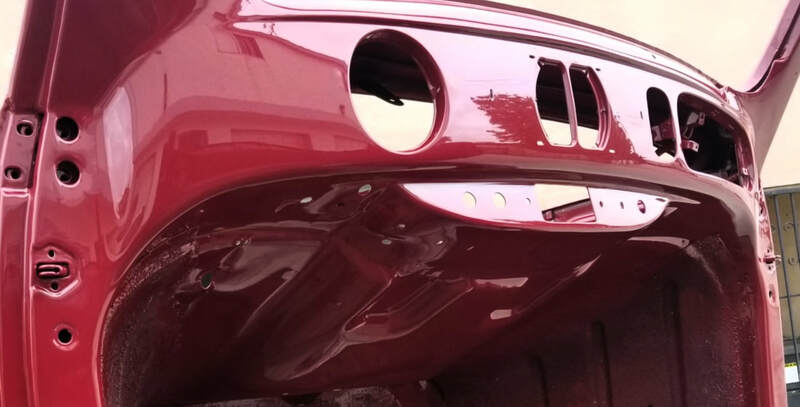 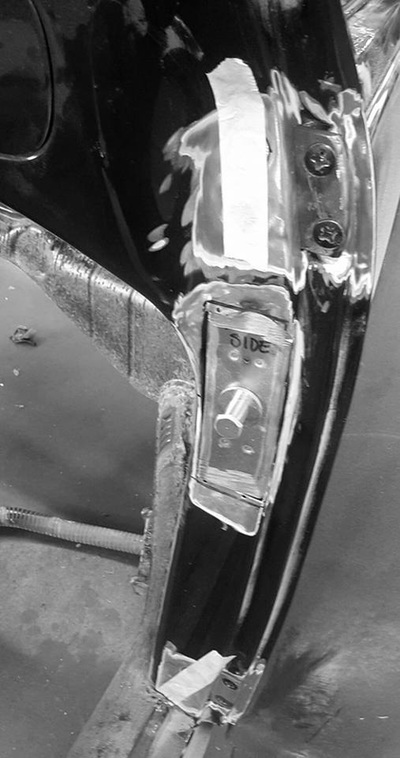 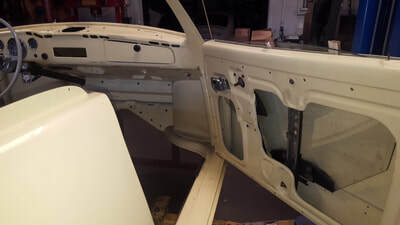 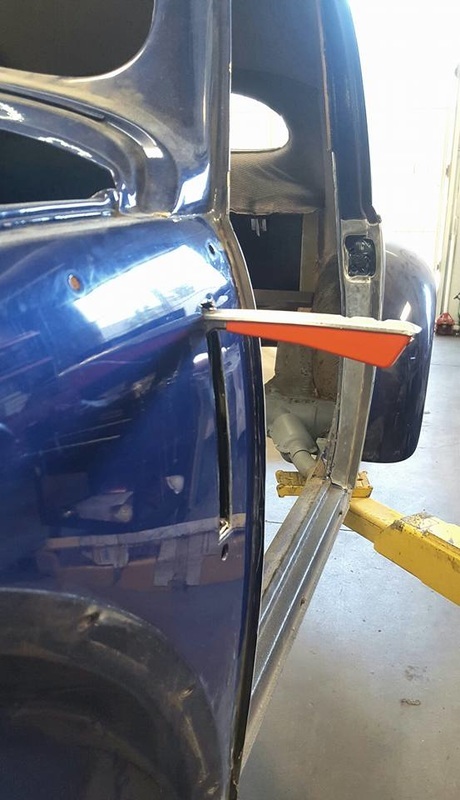 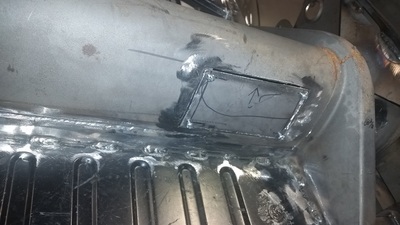 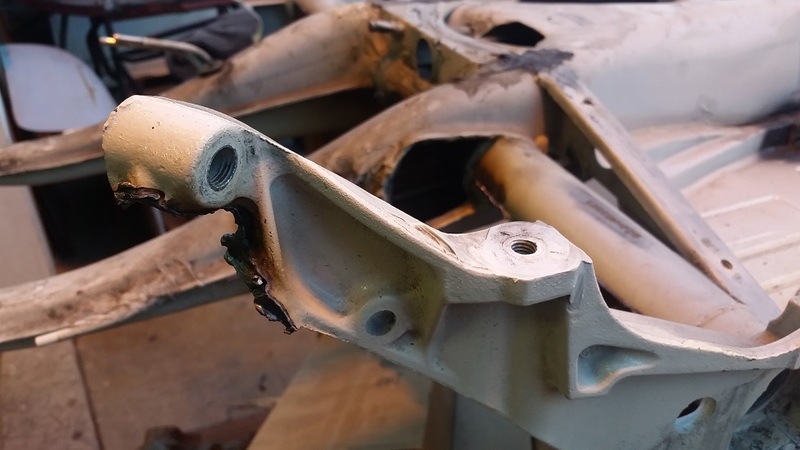 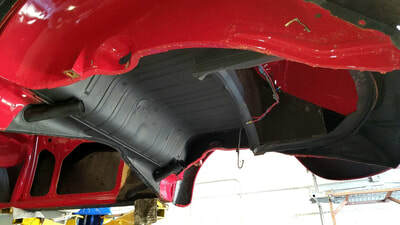 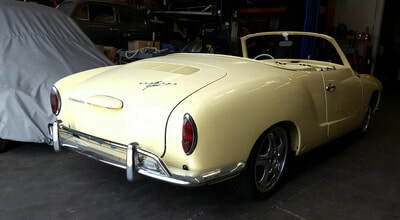 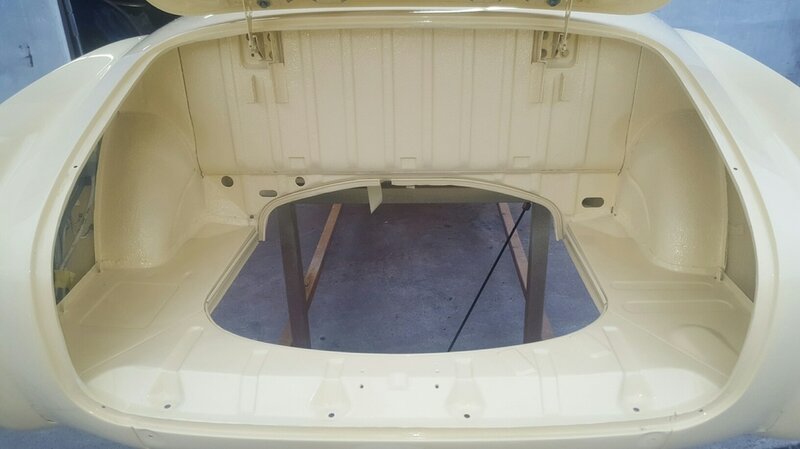 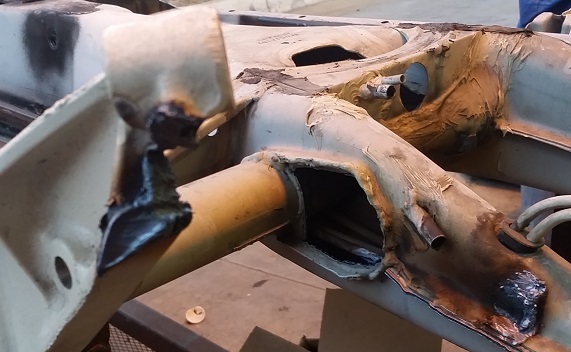 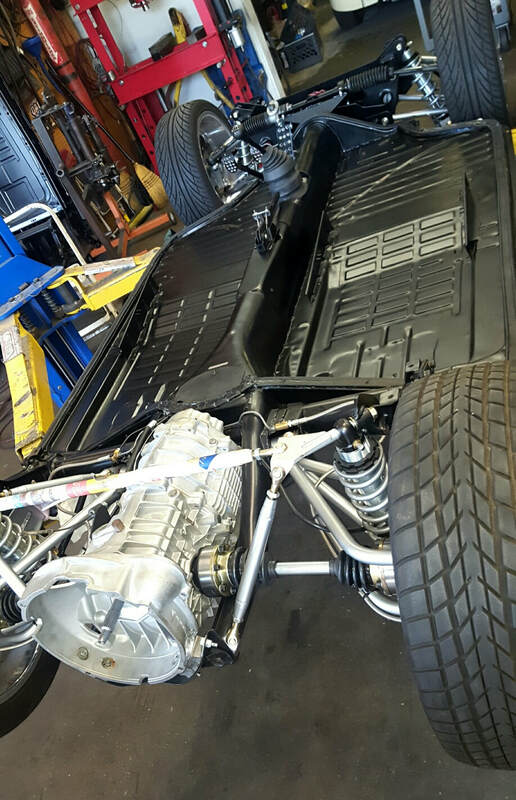 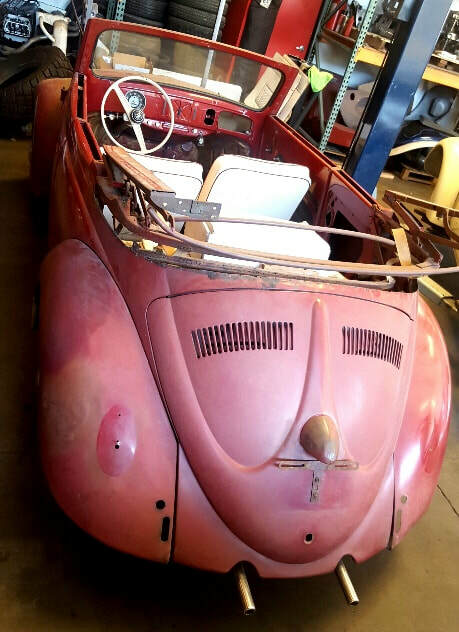 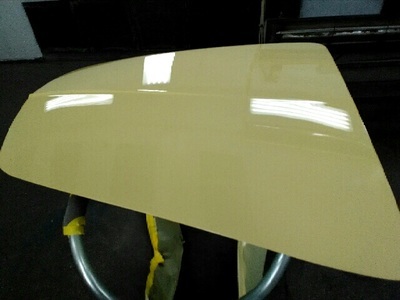 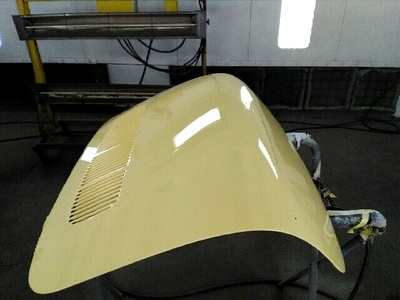 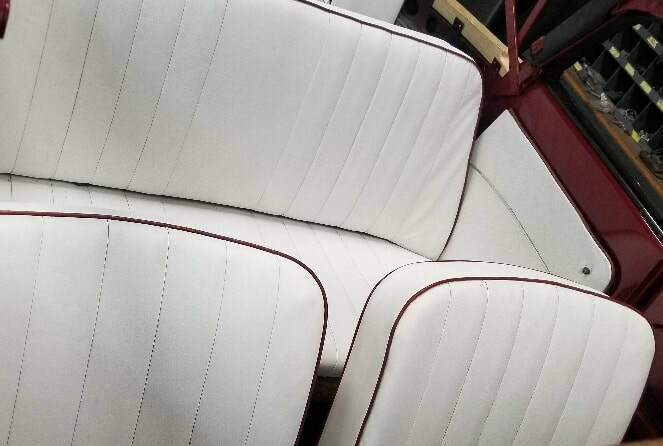 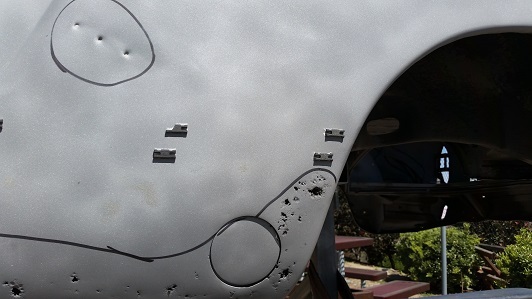 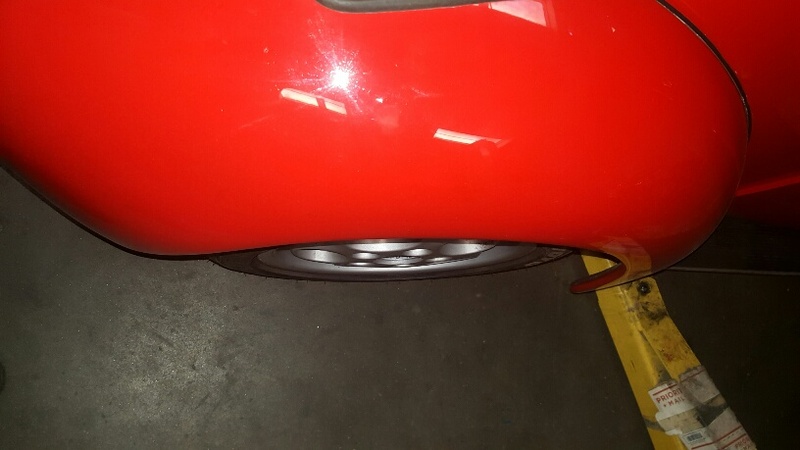 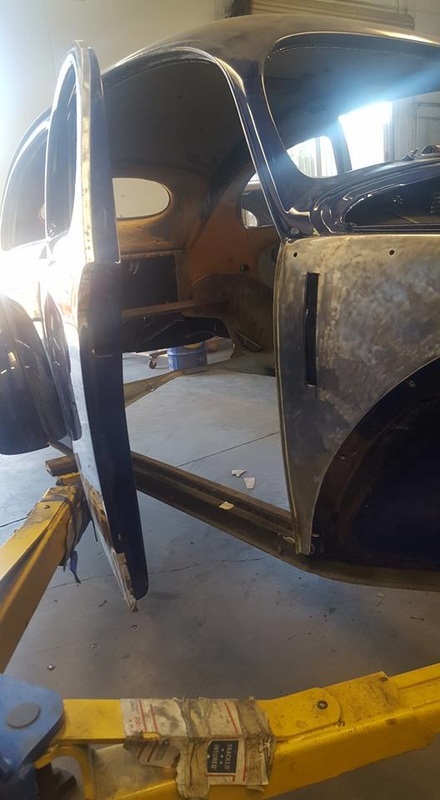 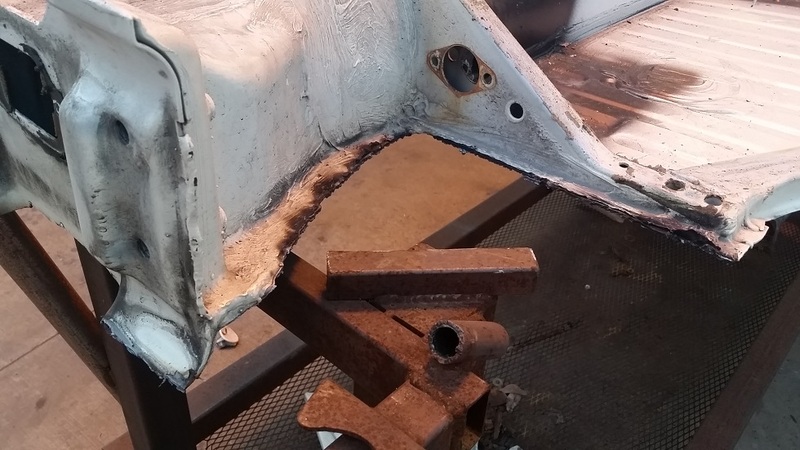 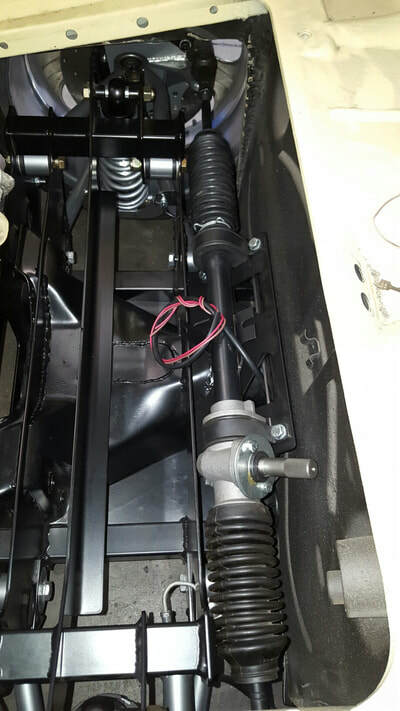 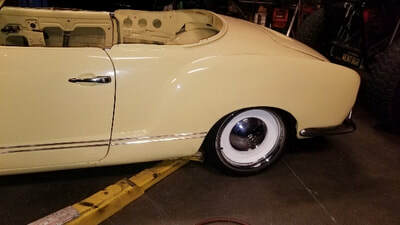 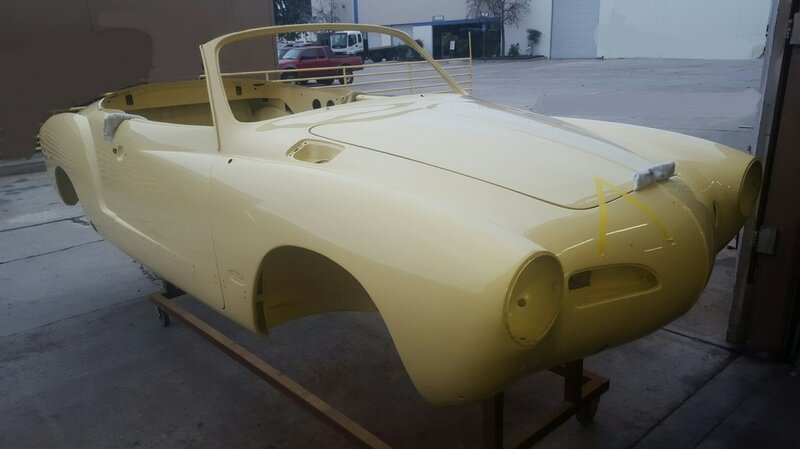 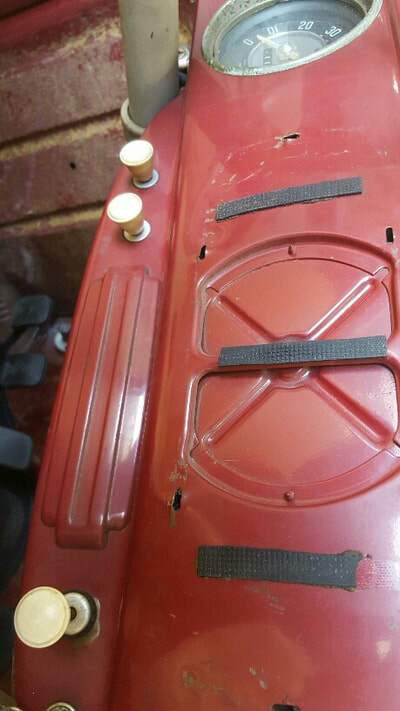 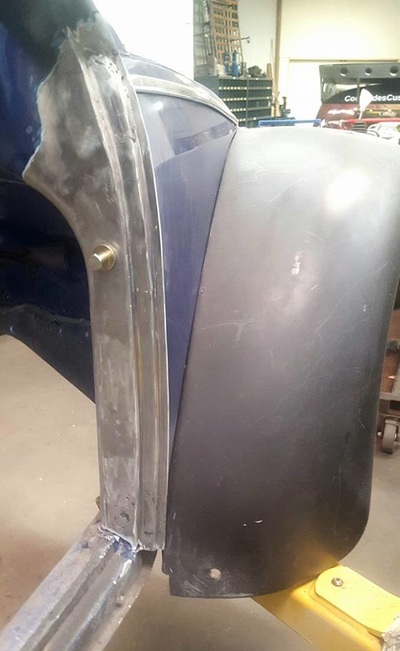 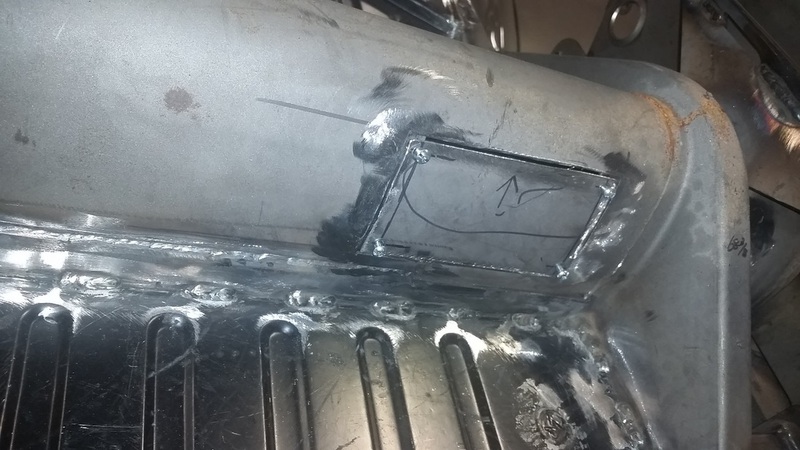 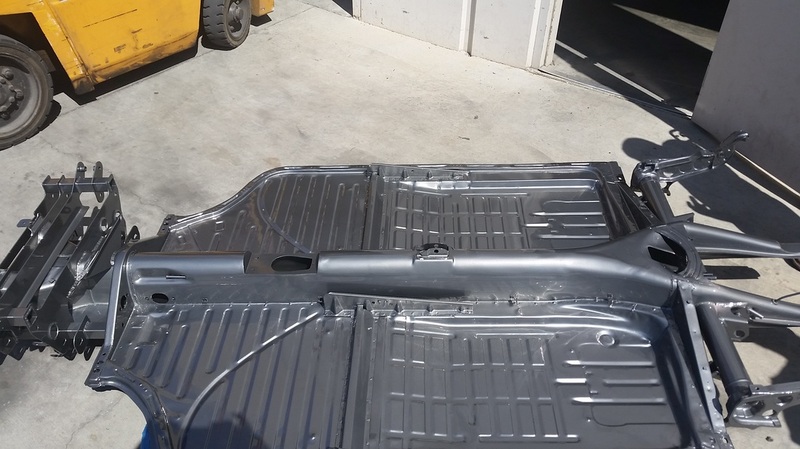 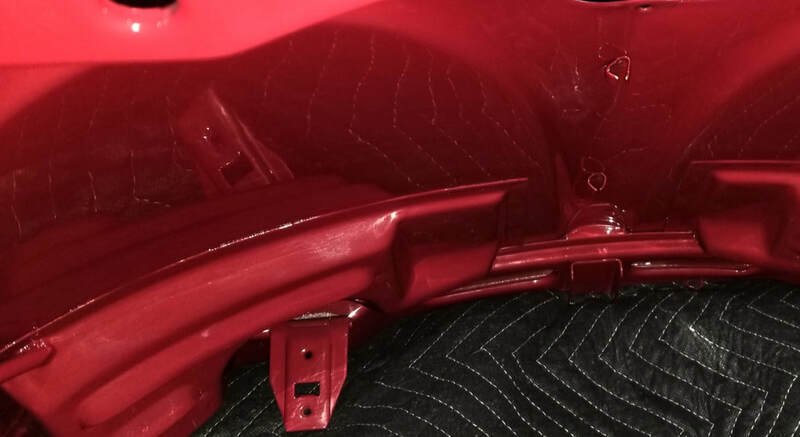 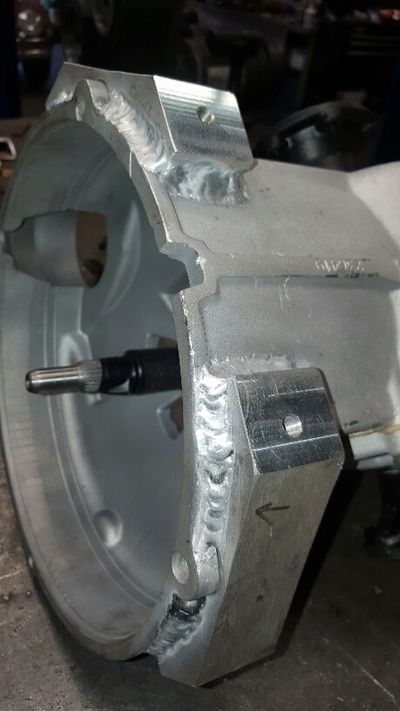 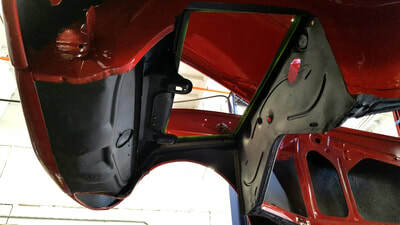 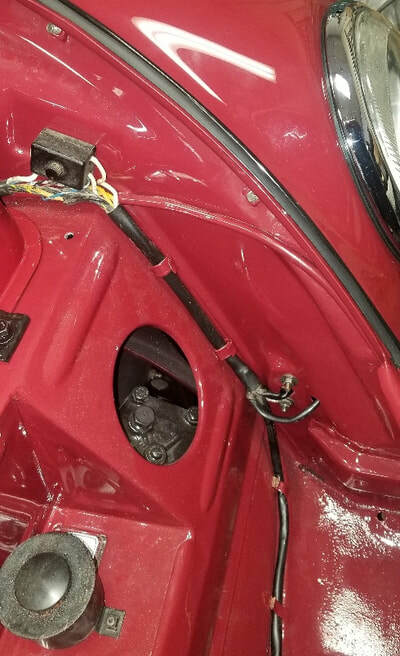 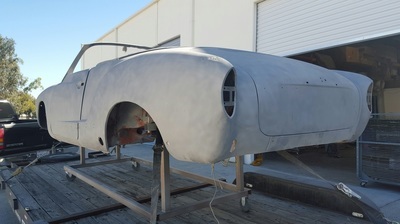 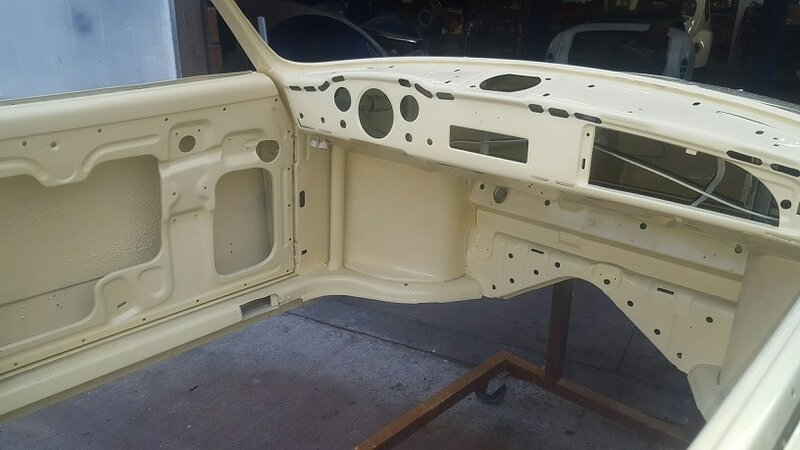 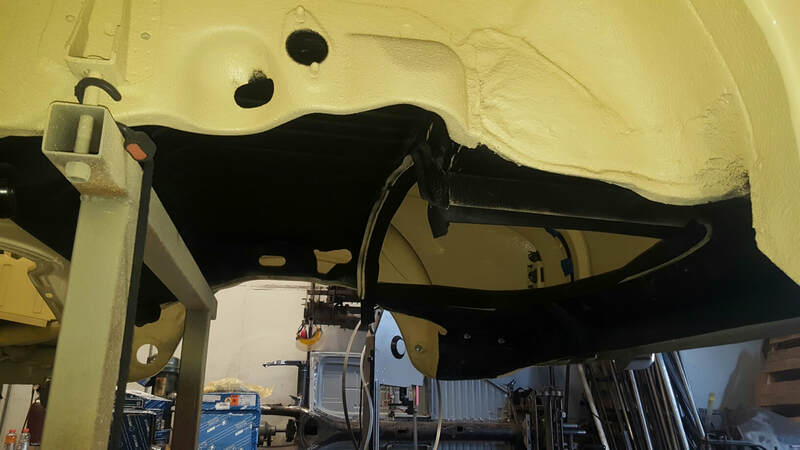 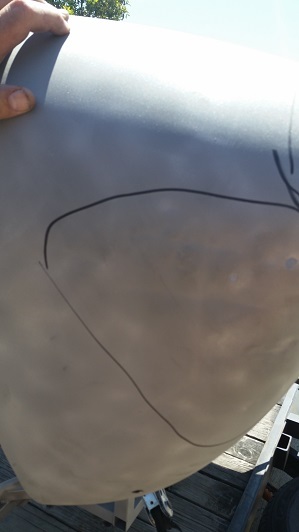 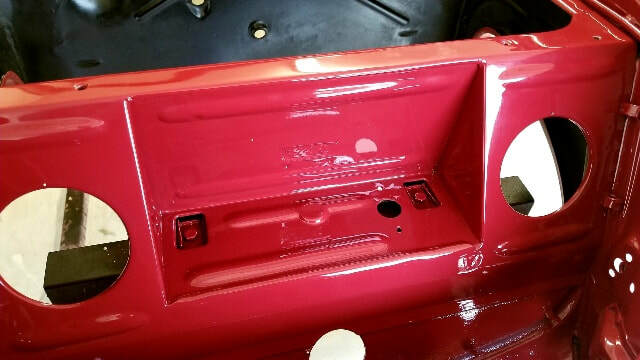 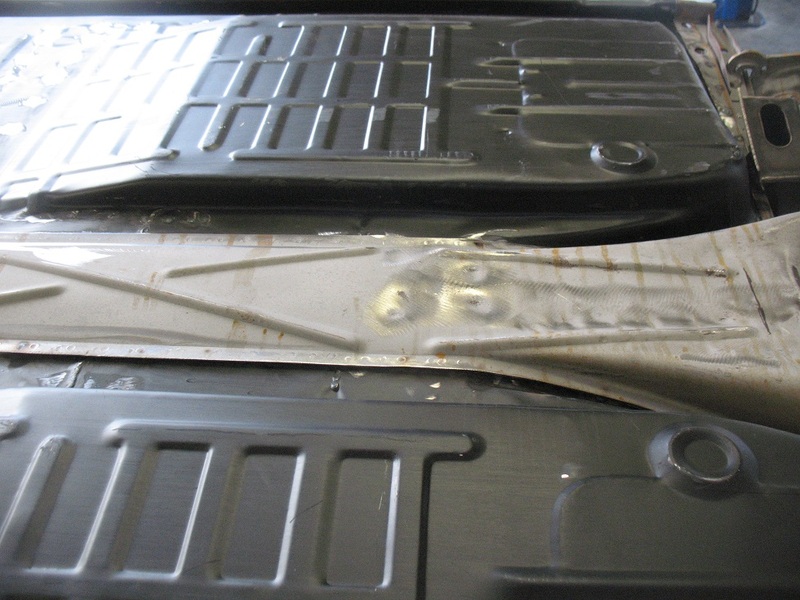 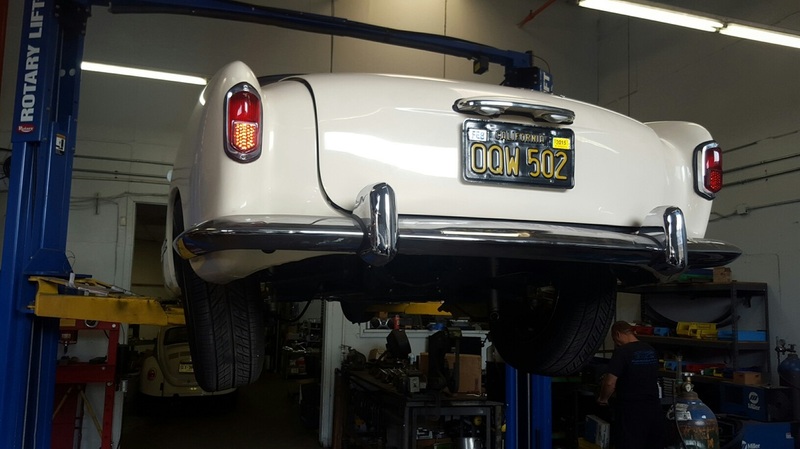 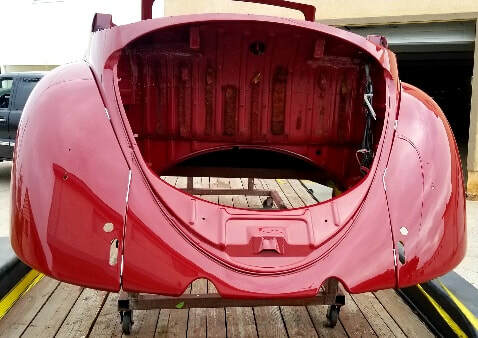 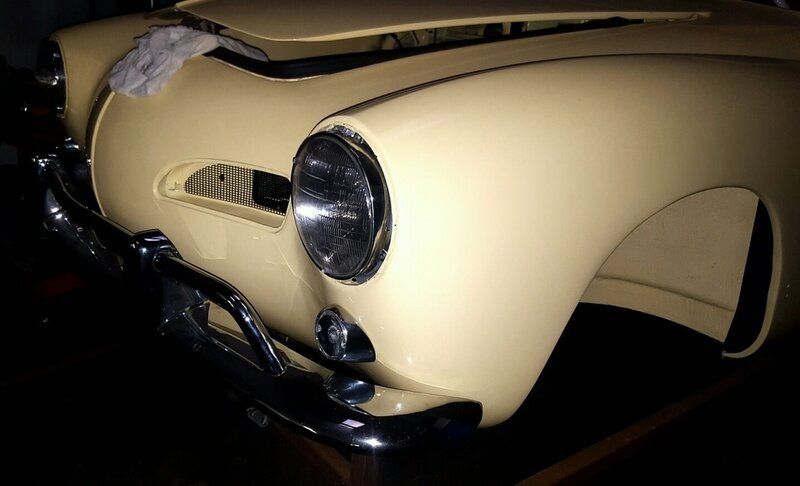 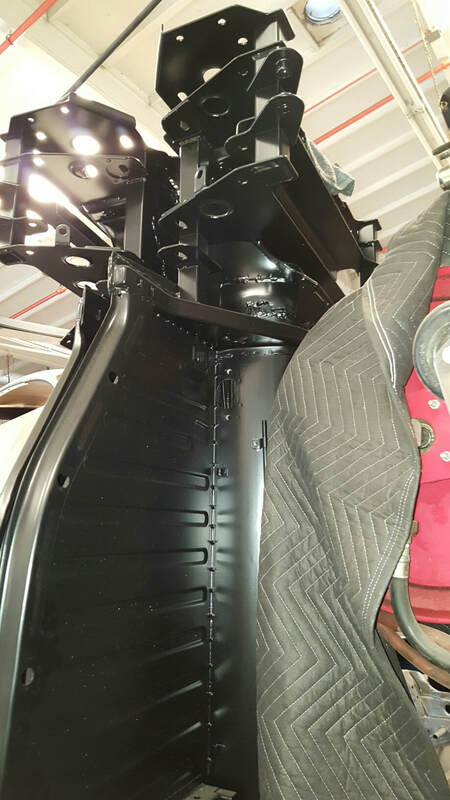 COOLRYDES CUSTOMS IS ALWAYS UP FOR A CHALENGE SO WE TALKED IT OVER WITH THE CUSTOMER AND DUE TO THE FACT GHIA CONVERTIBLES ARE NOT EASY TO FIND IN ANY CONDITION, WE CHOSE TO MOVE FORWARD. NOW WITH ALL THE CANCER CUT OUT AND NEW METAL REPLACEING THE EFFECTED AREAS. 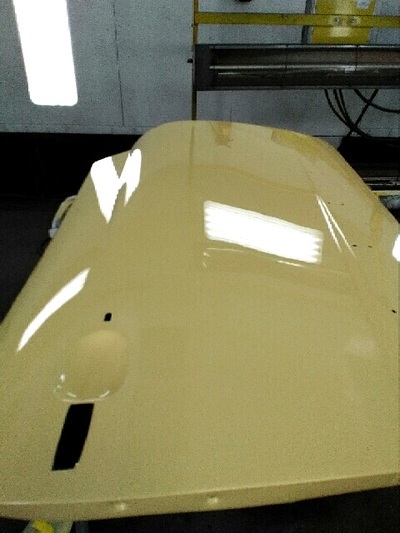 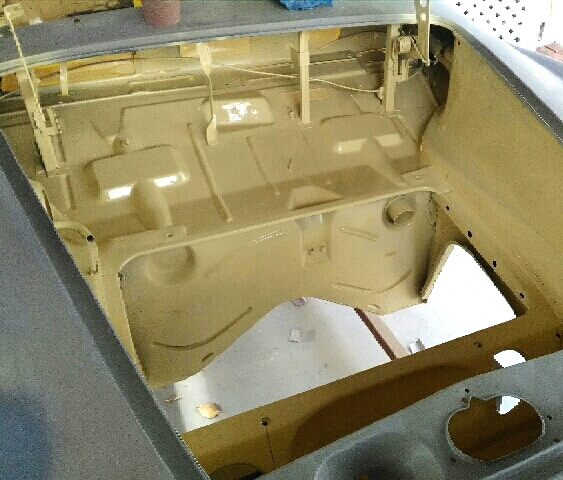 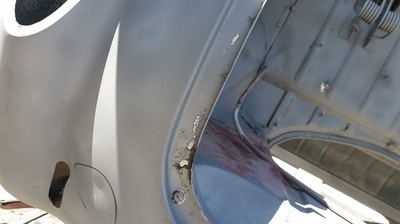 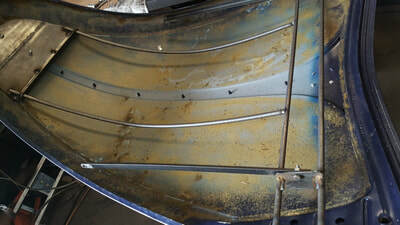 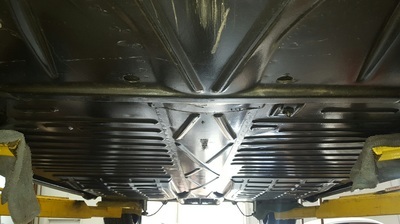 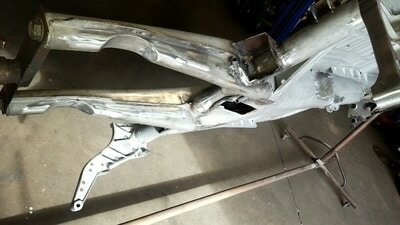 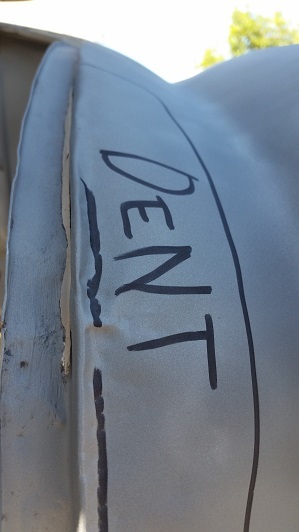 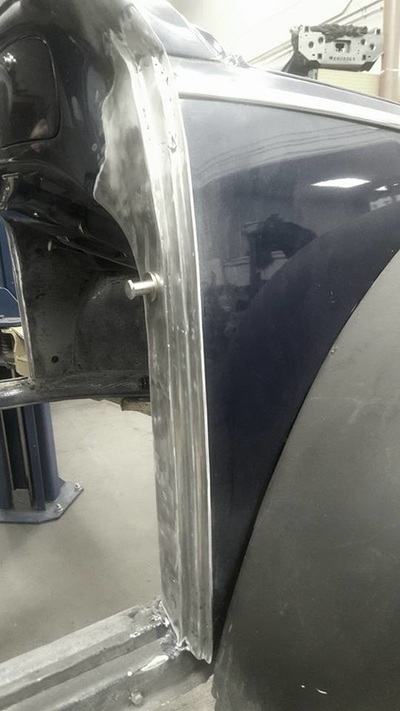 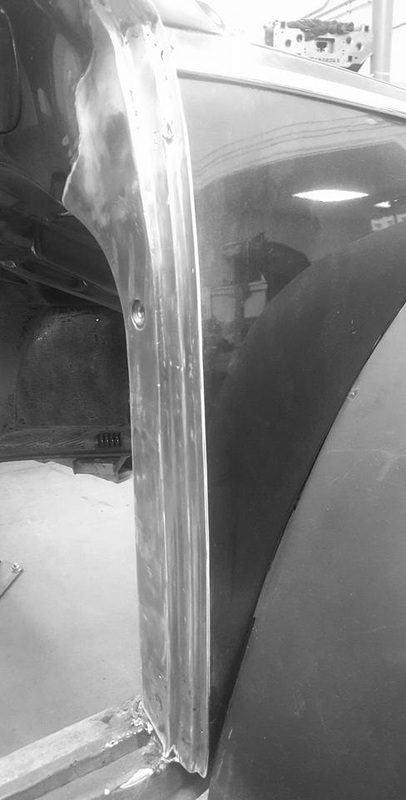 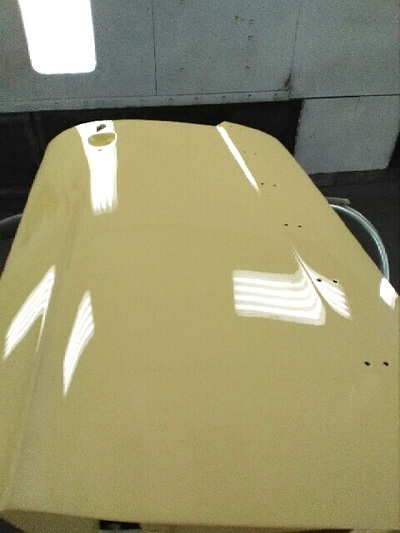 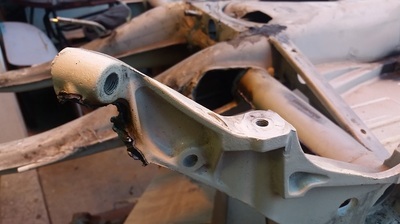 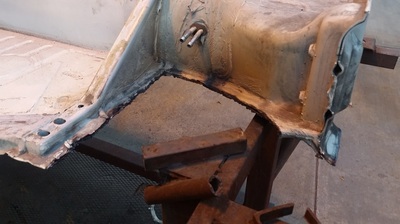 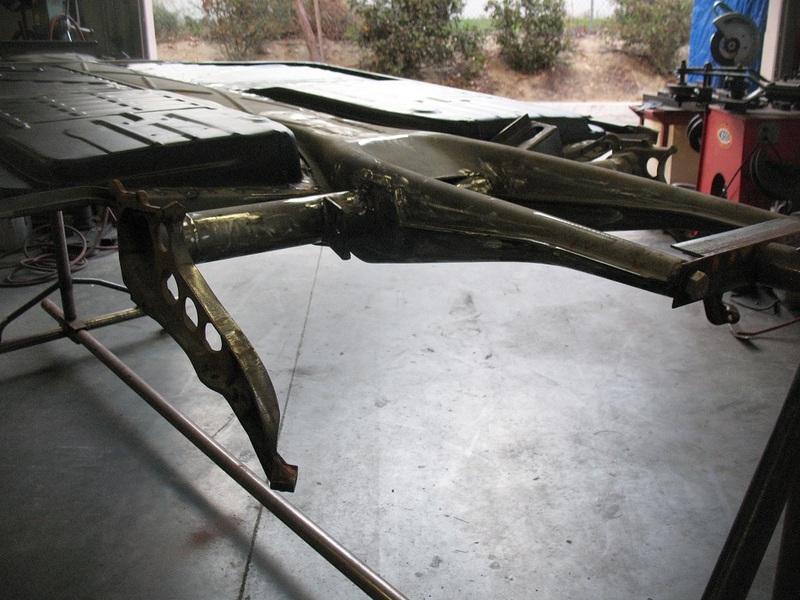 THE BODY HAS NOW GONE TO PAINT FOR A BEAUTIFUL MERCEDES SILVER PAINT JOB. 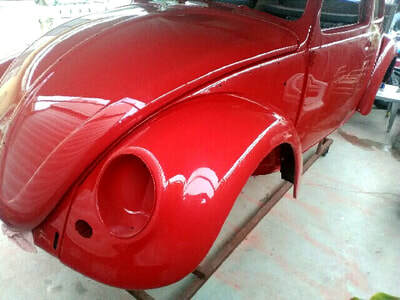 AFTER THAT WE WILL BE BILDING THIS SOON TO BE GEM INTO THE DREAM CAR THE CLIENT HAD IN MIND. 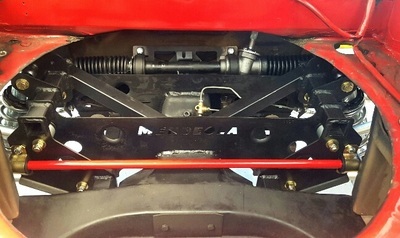 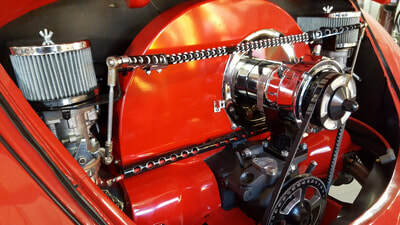 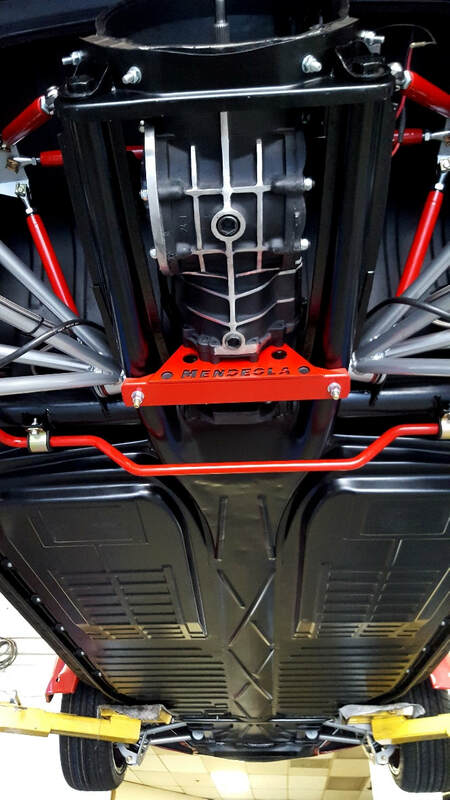 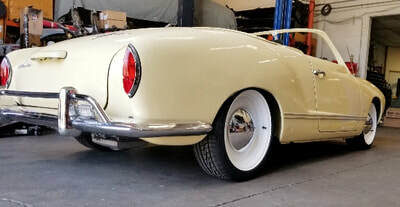 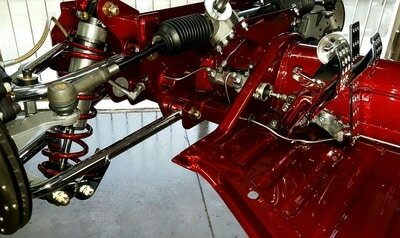 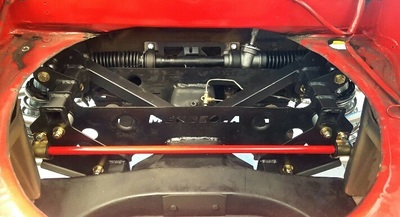 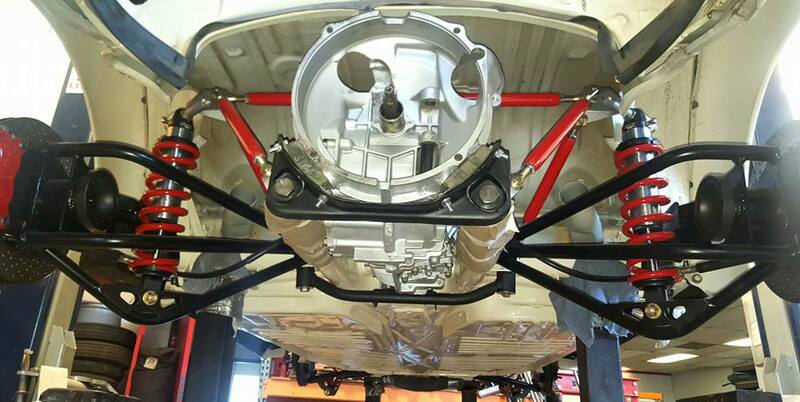 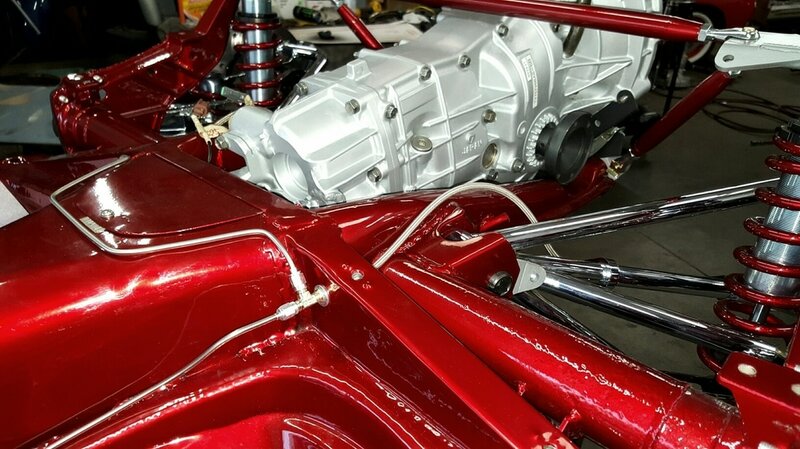 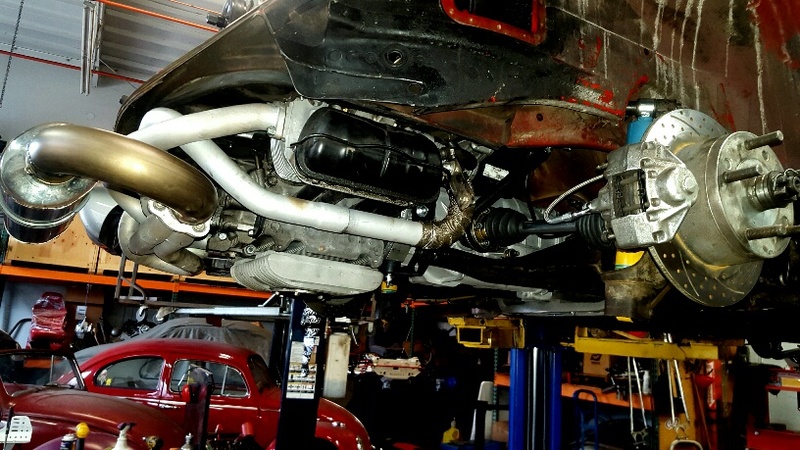 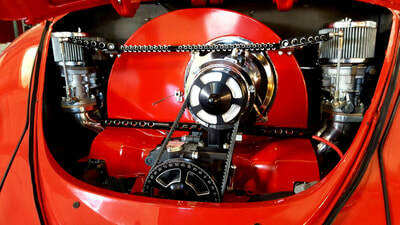 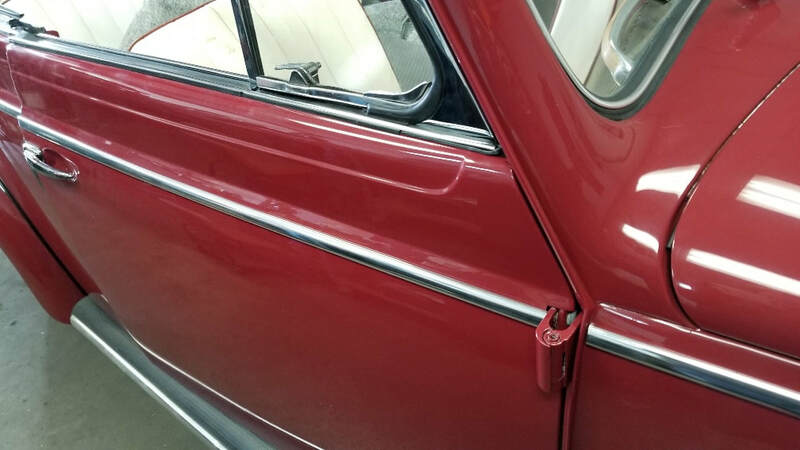 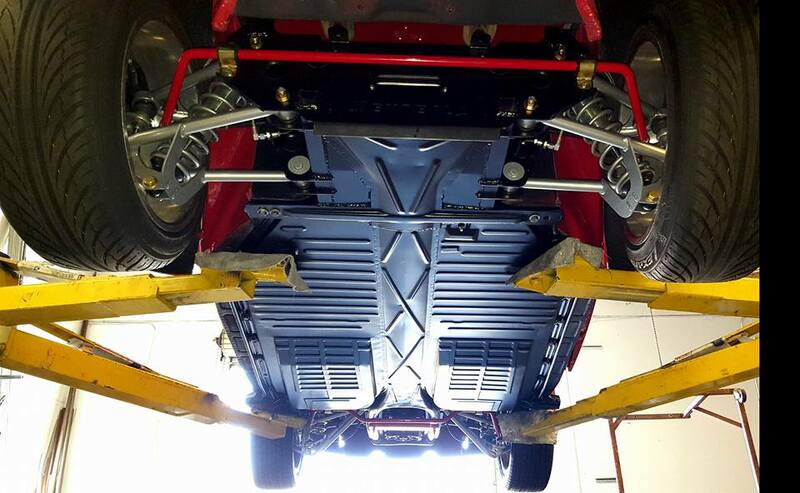 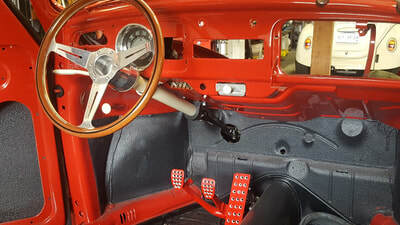 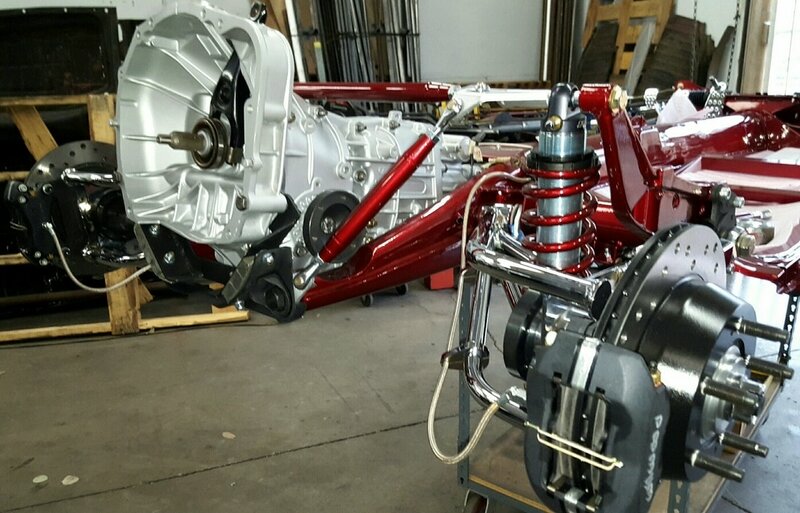 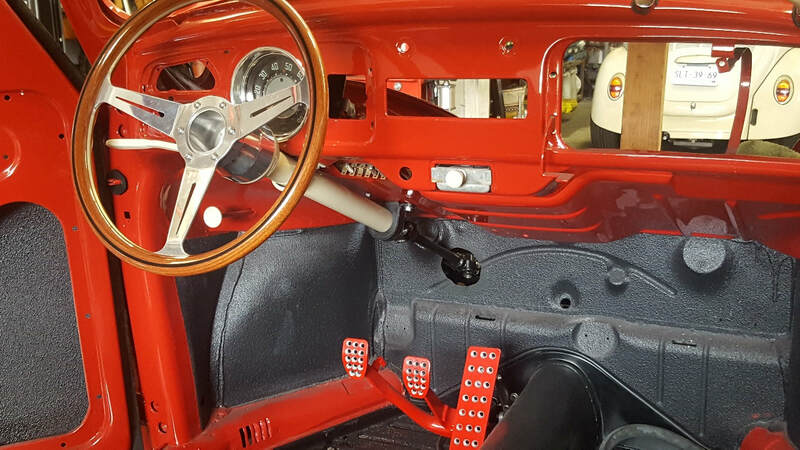 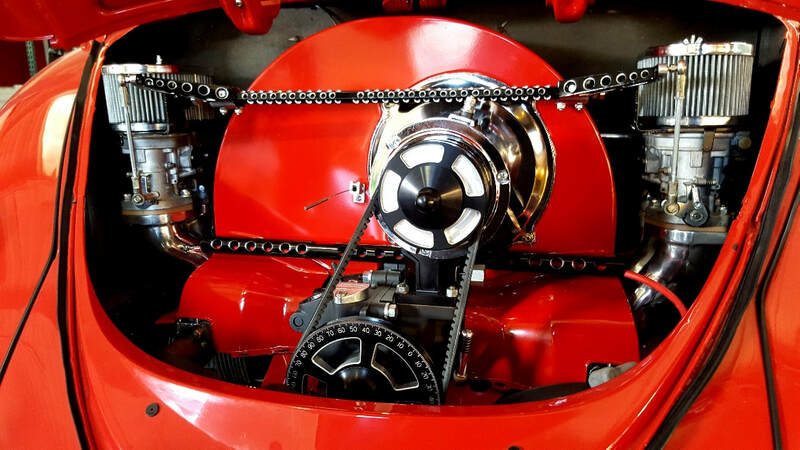 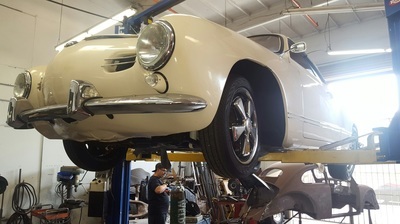 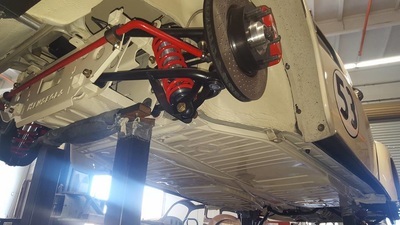 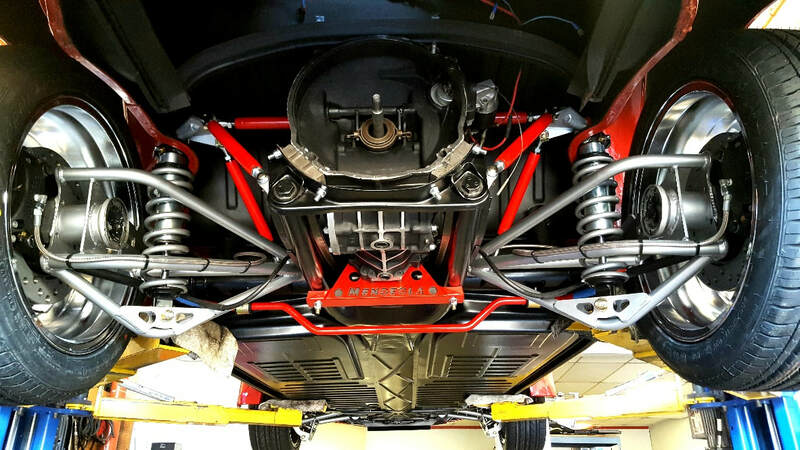 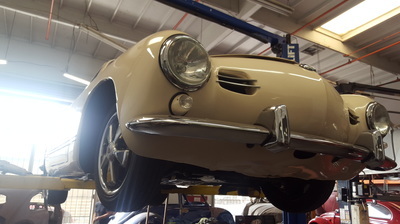 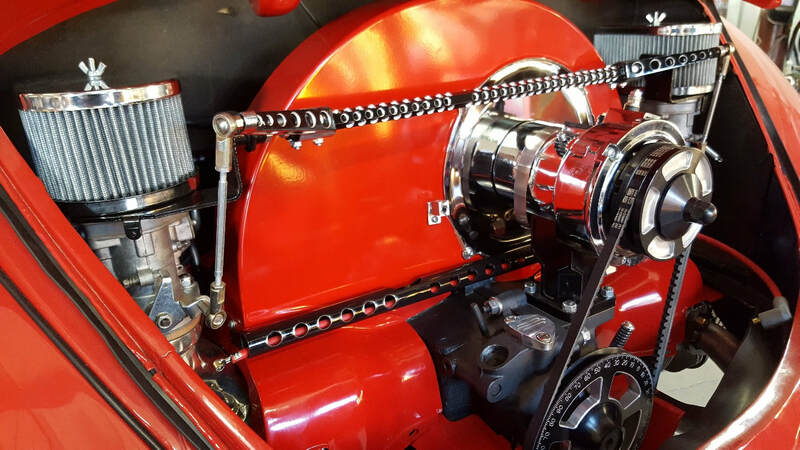 THIS 1960 GHIA WILL FEATURE FULL MENDEOLA PERFORMANCE SUSPENSION, COOLSTOP DISC BRAKES, A PORSCHE 915 TRANSAXLE, PERFORMANCE BUILT ENGINE, WITH A FULL COOLRYDES CUSTOMS ENGINE BAY DETAIL, A FULL RED LEATHER INTERIOR WITH A HIGH CLASS FEEL. THE AVERAGE ADMIRER WILL HAVE A HARD TIME KNOWING IF THIS IS AN OLD PORSCHE OR MERCEDES THEY NEVER SAW BEFORE. 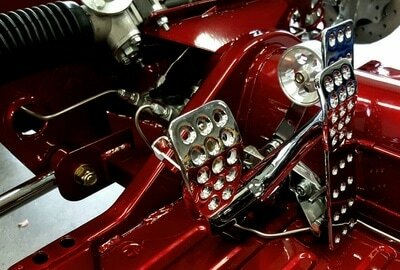 In life we are given many choices to make at one time or another. 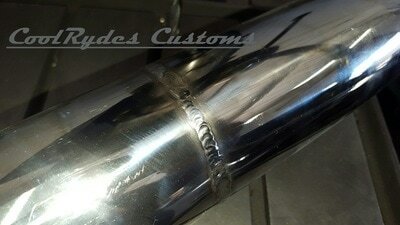 Wendy had one to make recently and we think she made the right one. She was given the choice between three of the what we call the 3 "F" cars. 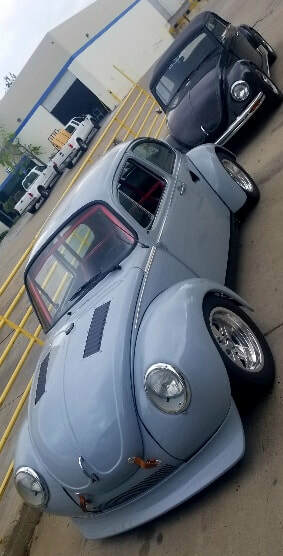 Fun, Fast, & Feakin nice !!! 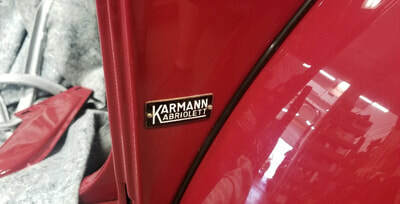 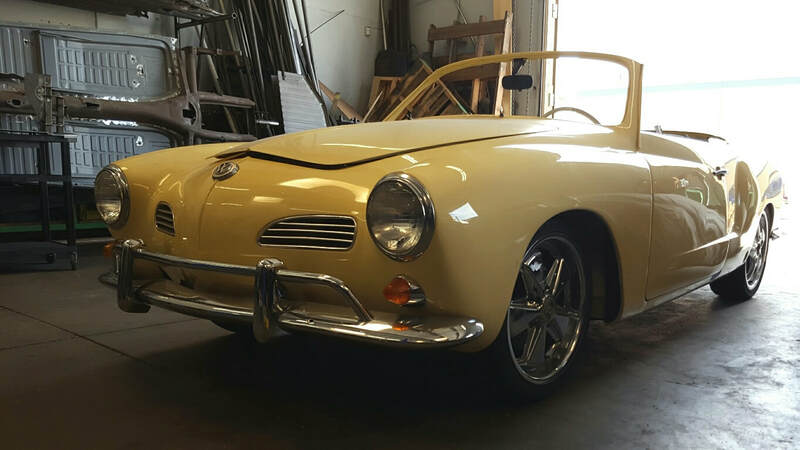 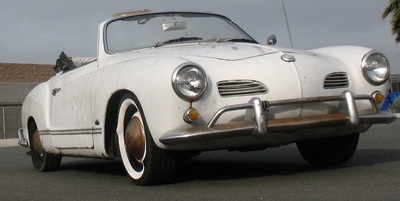 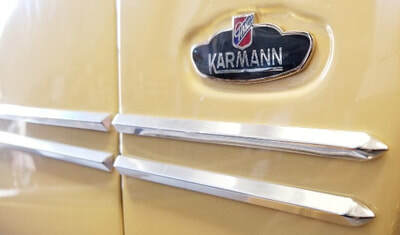 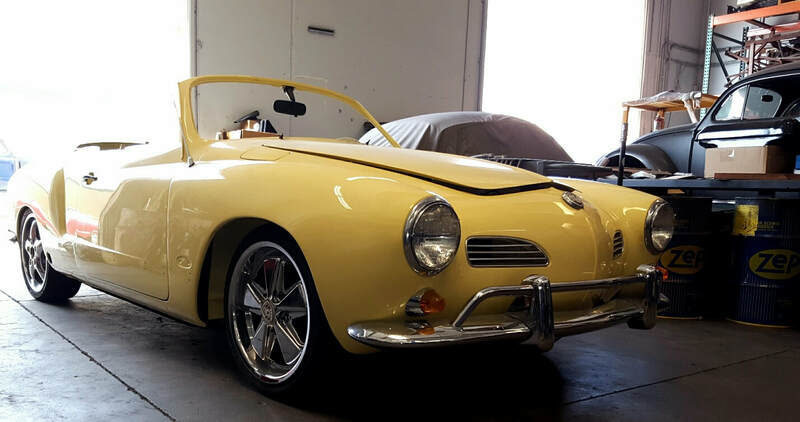 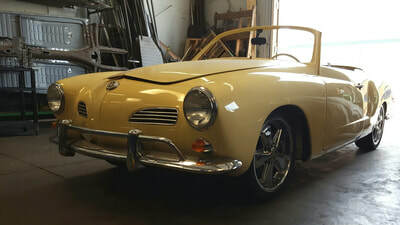 She followed her heart and chose a late Karmann Ghia convertible. 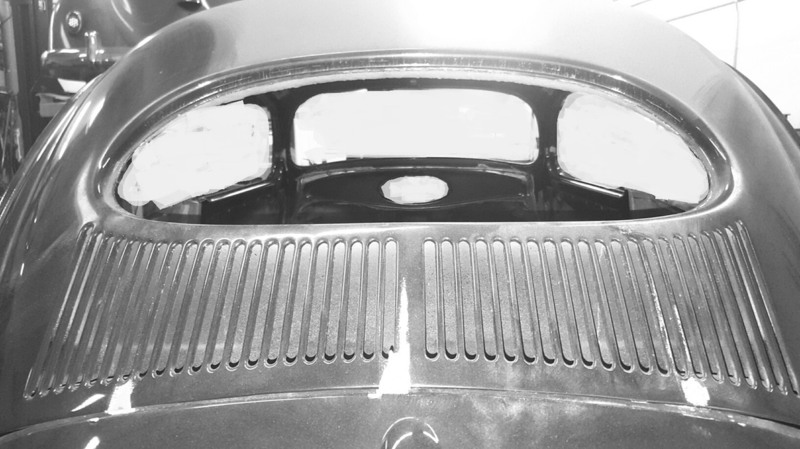 The one you see here and now does not embody the three "F's" yet, however when we're done it most certainly will. 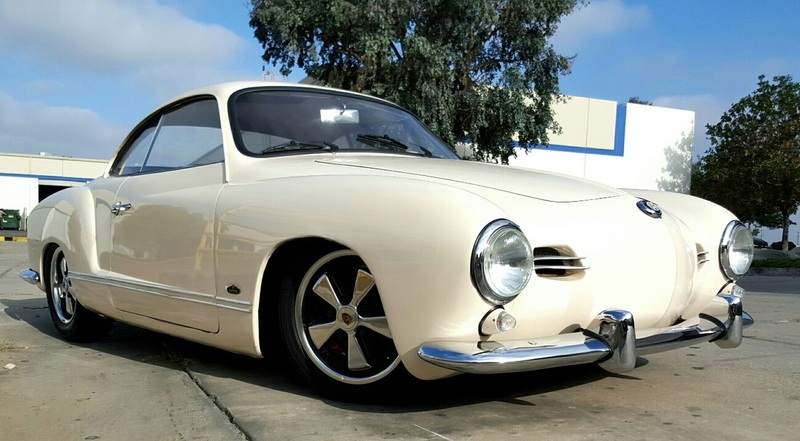 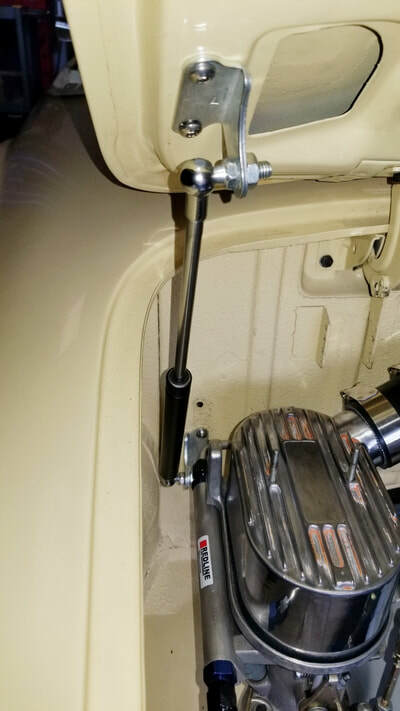 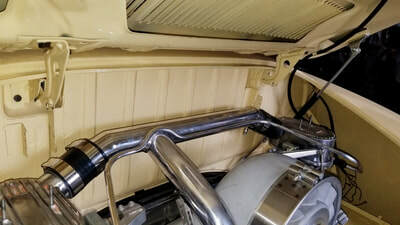 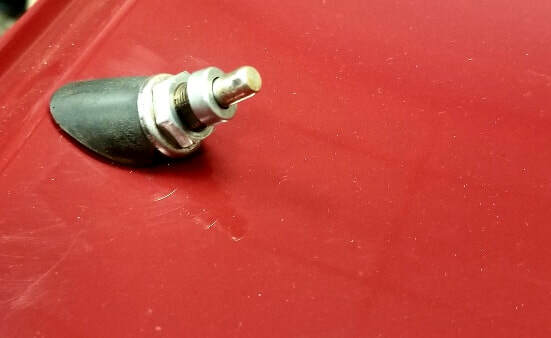 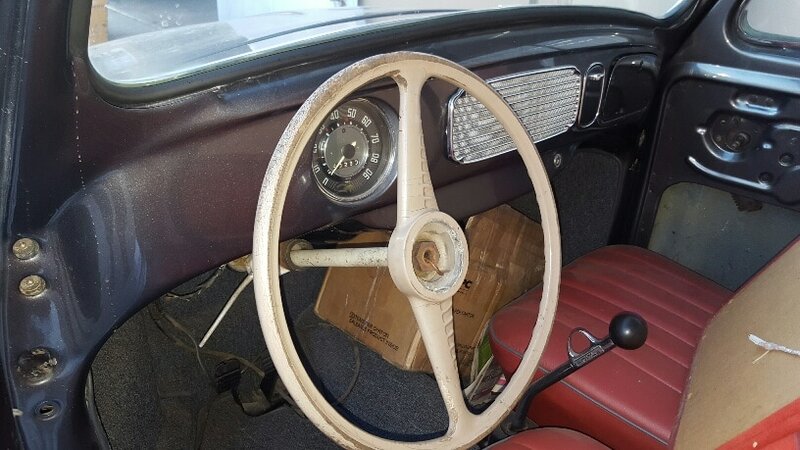 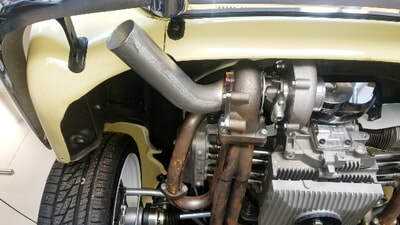 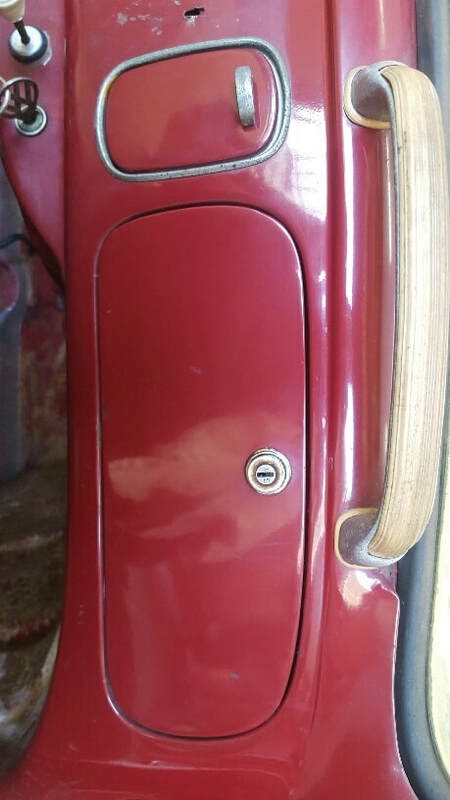 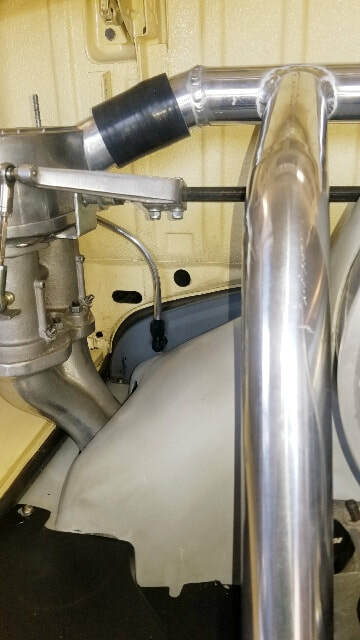 The style of this Ghia will allow it to blend right in at a car show with a very clean stock look and should fool some police officers, thinking their radar guns need repair. It will be like a wolf in sheep's clothing...... More details to come.